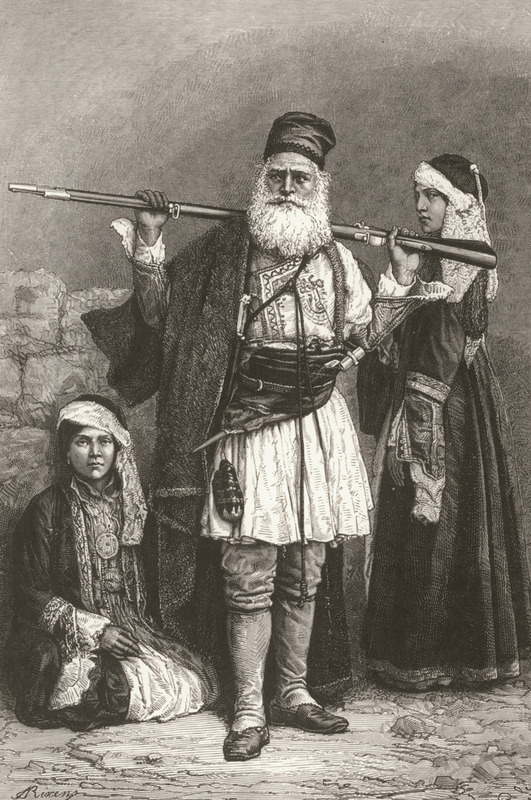 Avusturyalı subay ve yazar Amand Schweiger Lerchenfeld (1846-1910) Viyana'da doğar. 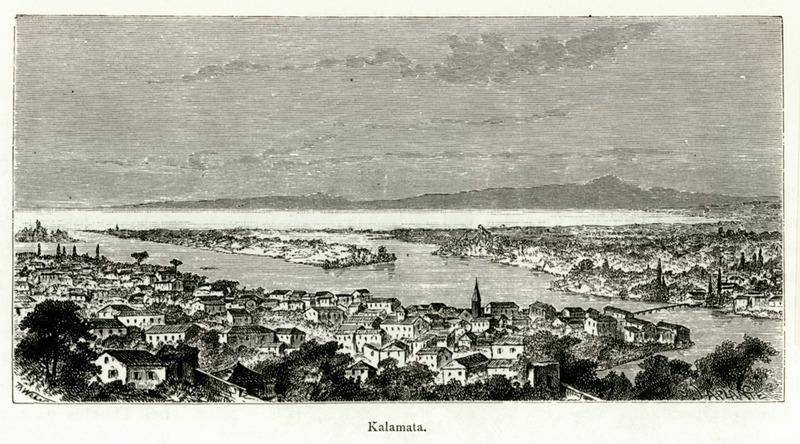 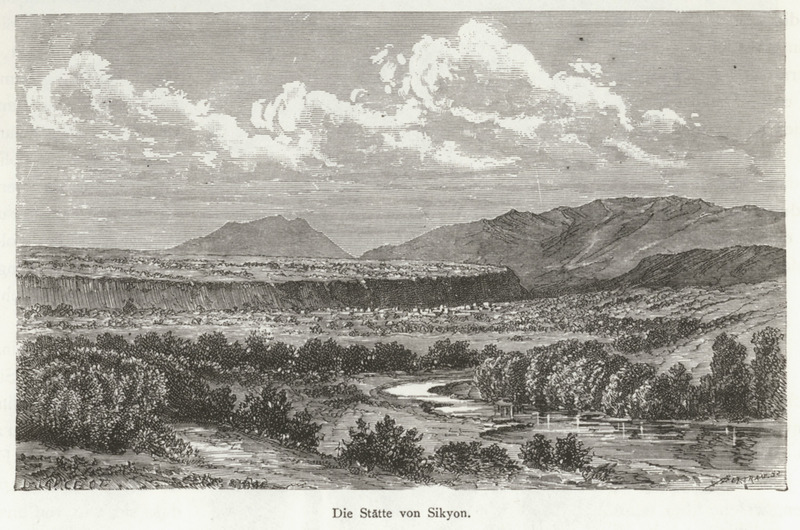 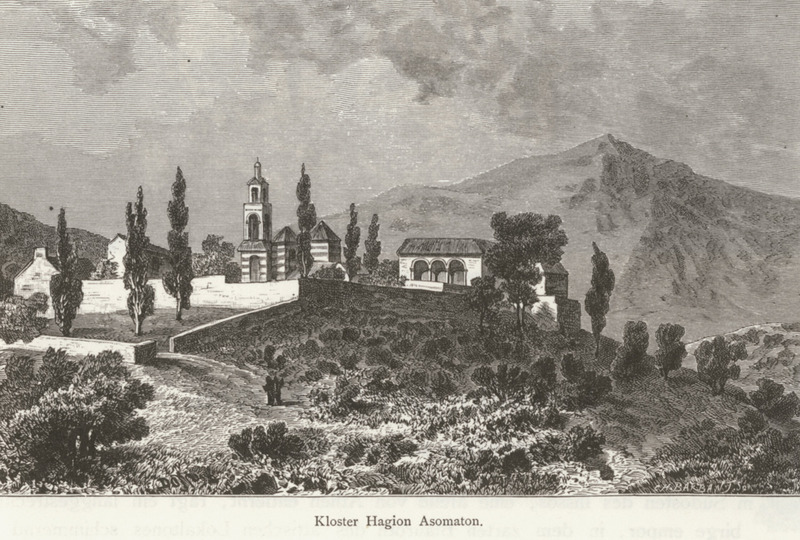 Wiener Neustadt Askeri Akademisinden mezun olduktan sonra orduya girip 1866 yılında İtalya seferine katılır. 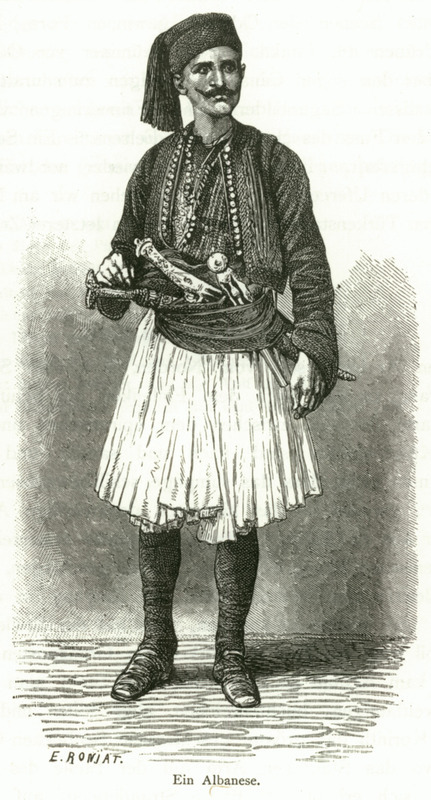 1871'de ordudan istifa edip seyahat etmeye başlar. 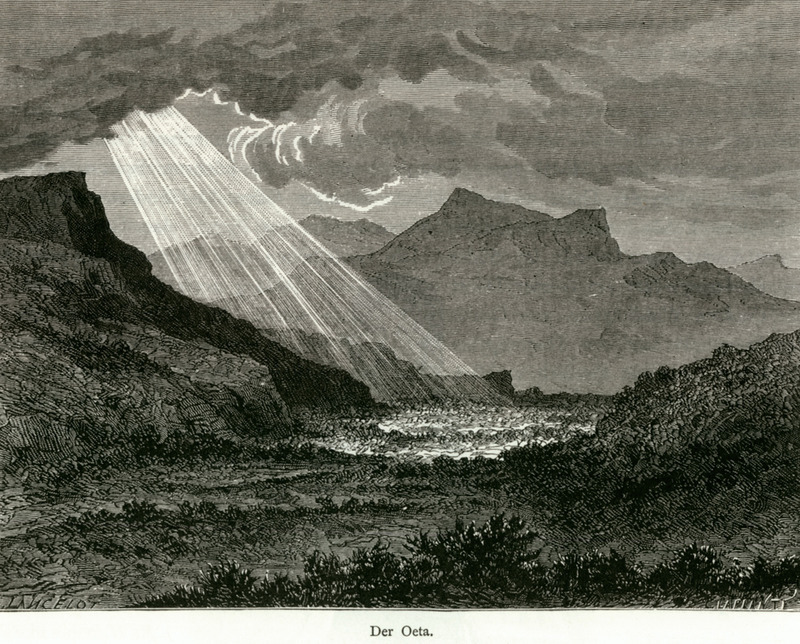 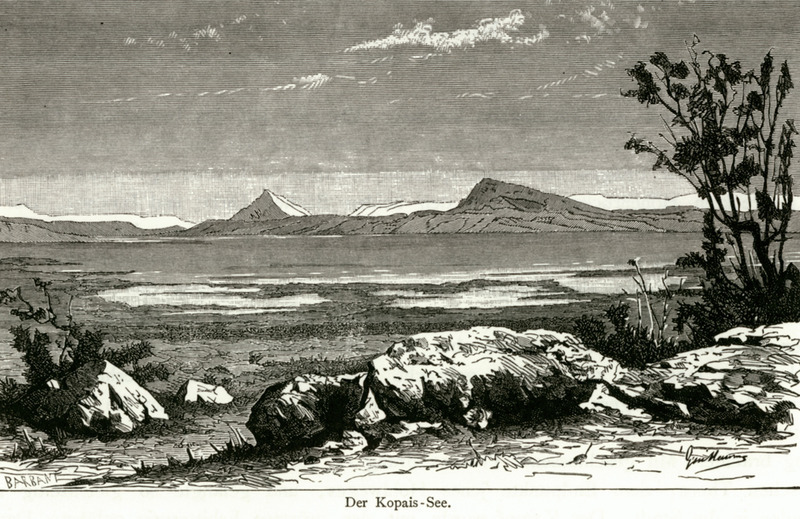 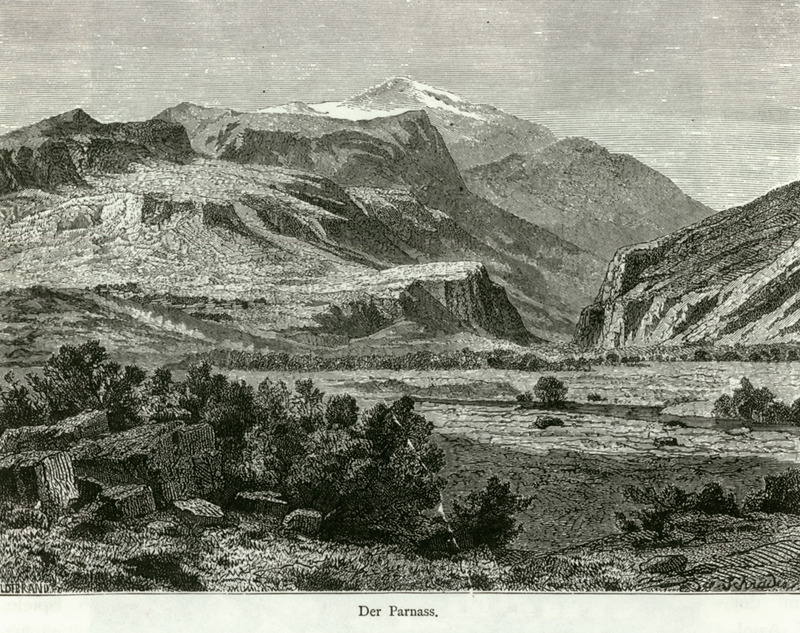 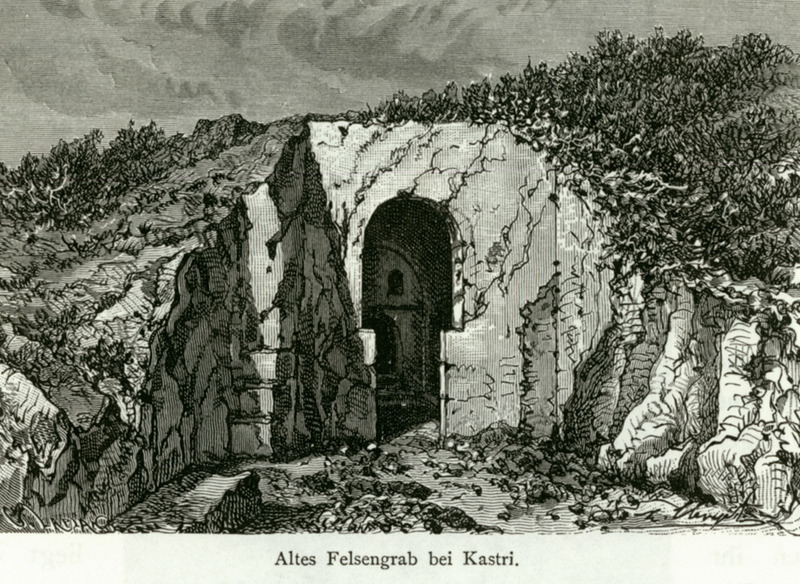 Daha sonra ise (1889) Stein der Weisen gazetesini kurup başyazarlığında çalışır. 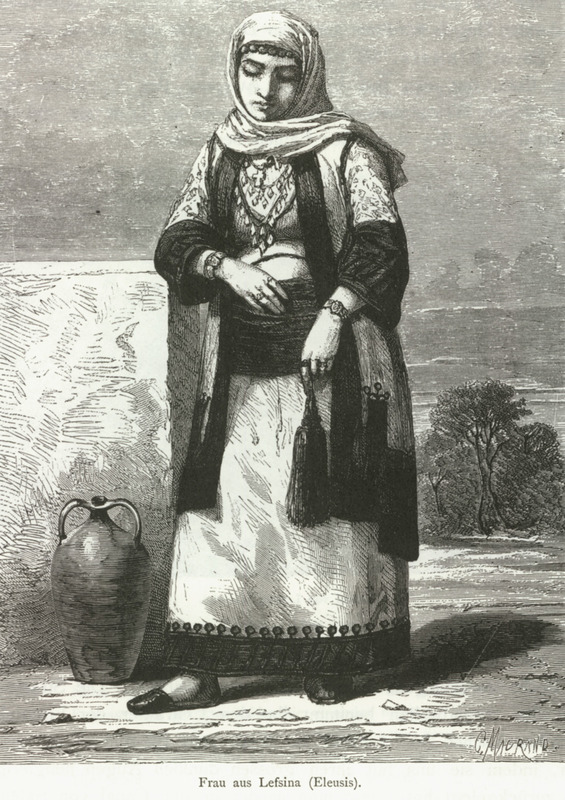 1873 yılında ilk yolculuğuna çıkıp İtalya'ya gider, 1875'te ise Yunanistan'ı ziyaret eder. 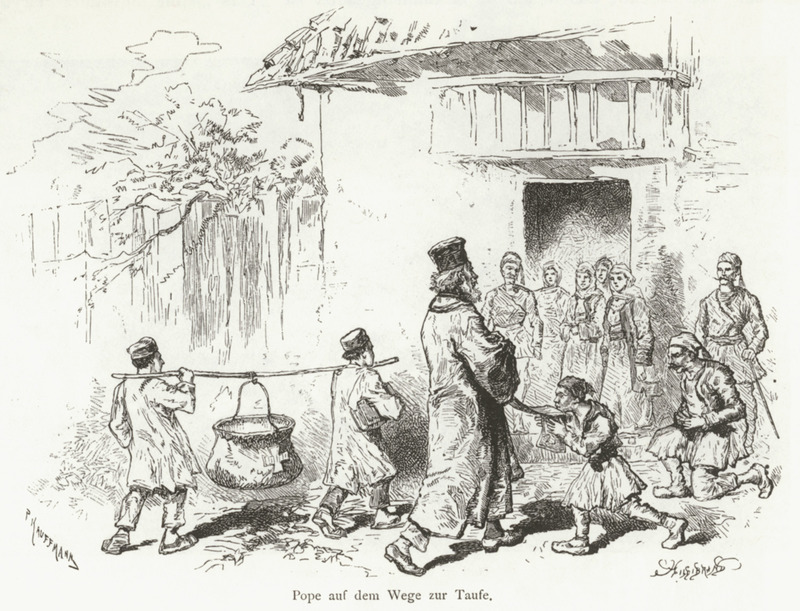 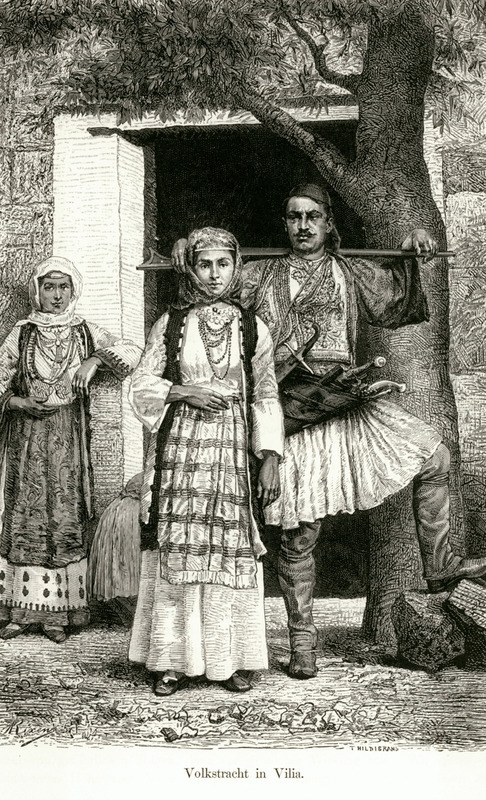 1876 yılından itibaren, Ermenistan, Bosna, Bulgaristan, Karadeniz, Anadolu, Adriyatik denizi, İtalya, Yunanistan, Afrika, ve Tuna nehrinden Kafkas bölgesine kadar yaptığı gezilerden izlenimlerini kaleme alır. 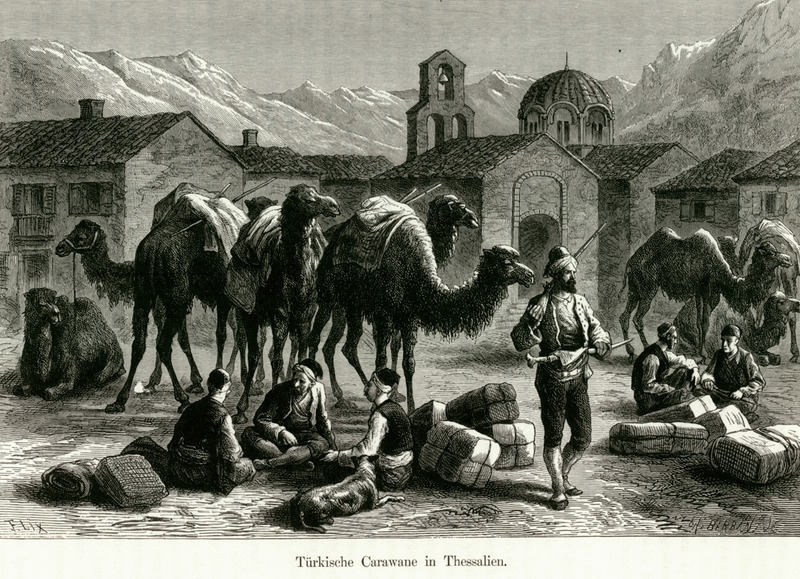 Toplamı 33 tane kitabı bulan eserleri arasında seyahatnamelerden başka doğa bilimi, etnografya, haritacılıkla ilgili hatta eğlendirme amaçlı yayınlar, Atlaslar v.s. 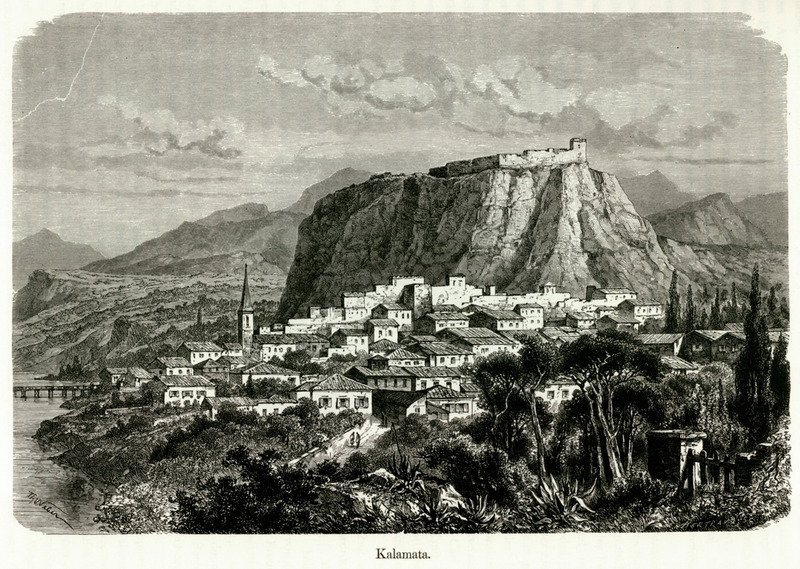 bulunmakta. 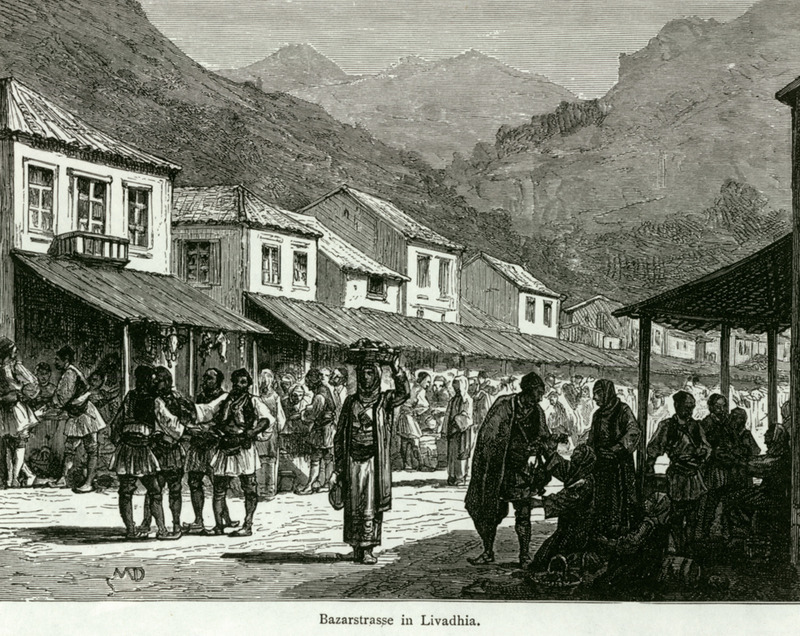 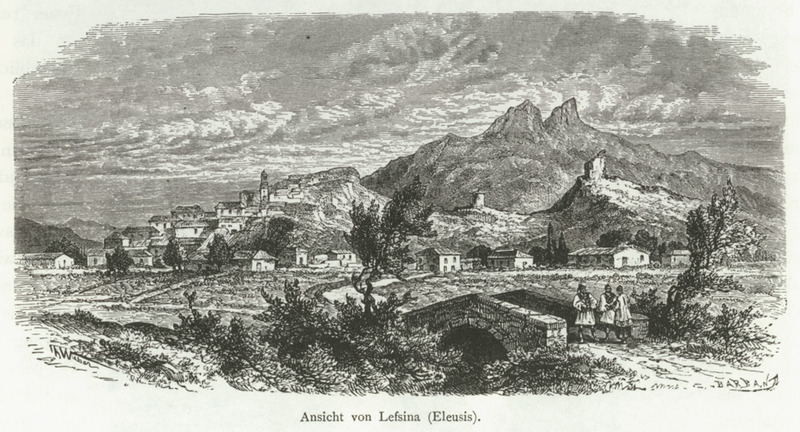 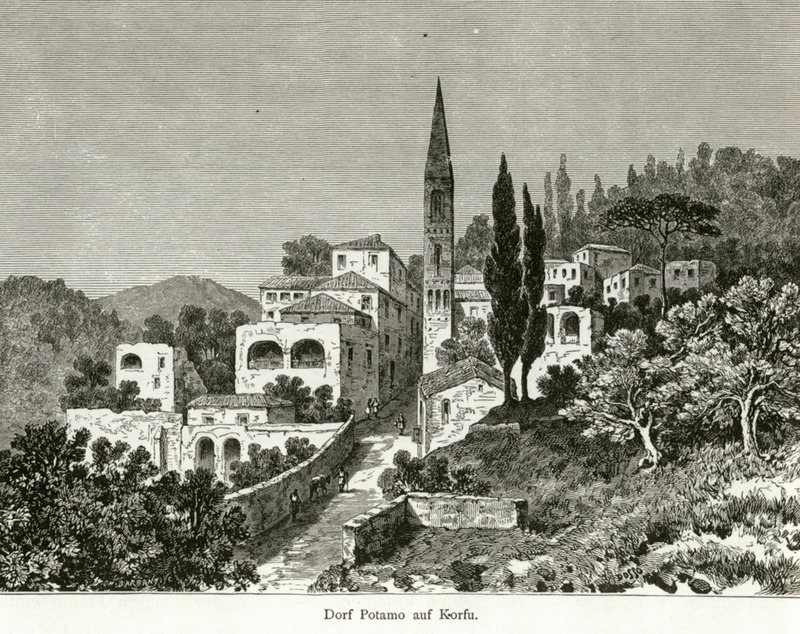 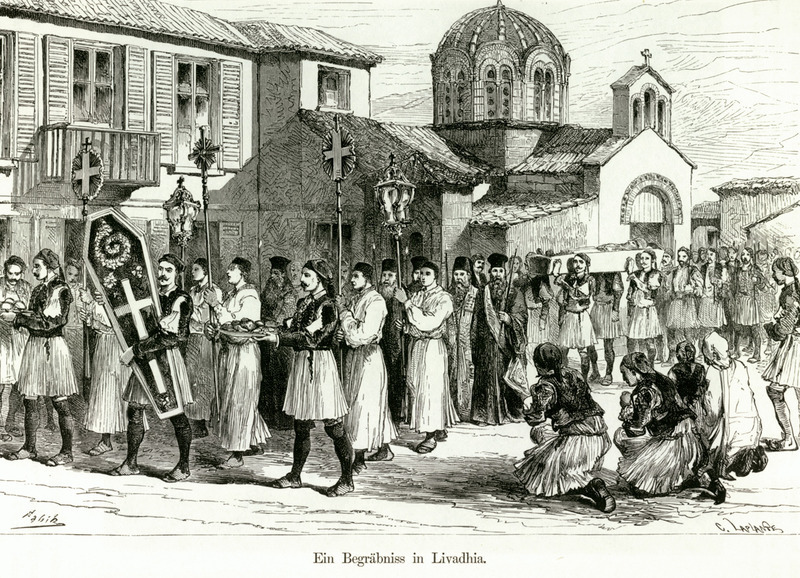 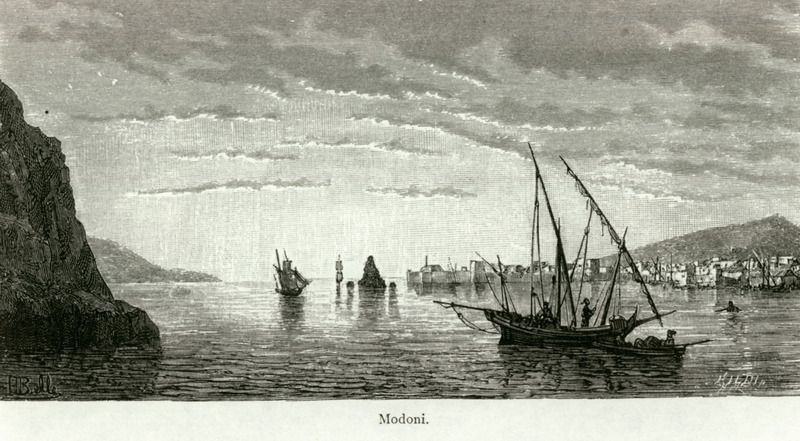 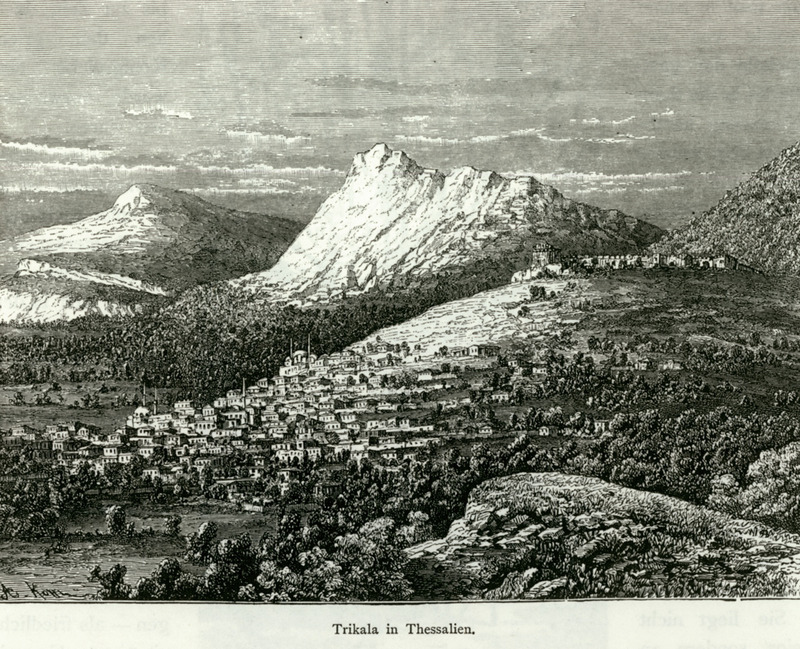 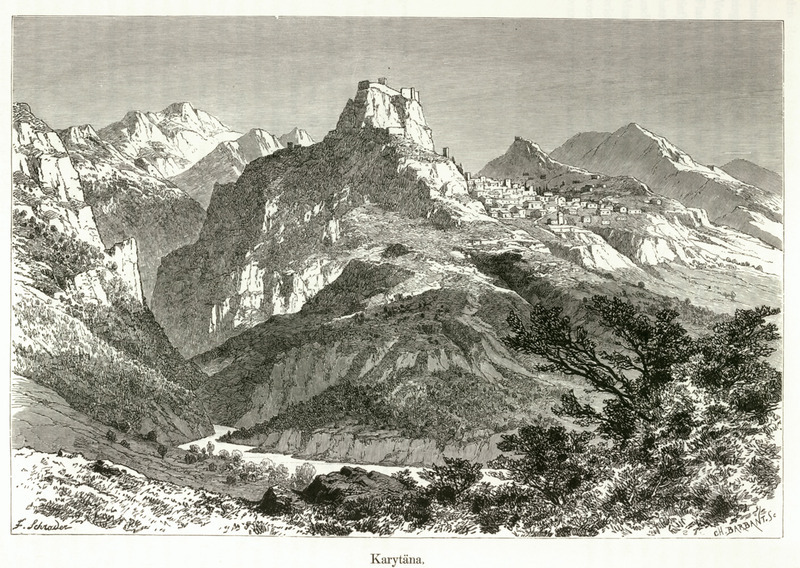 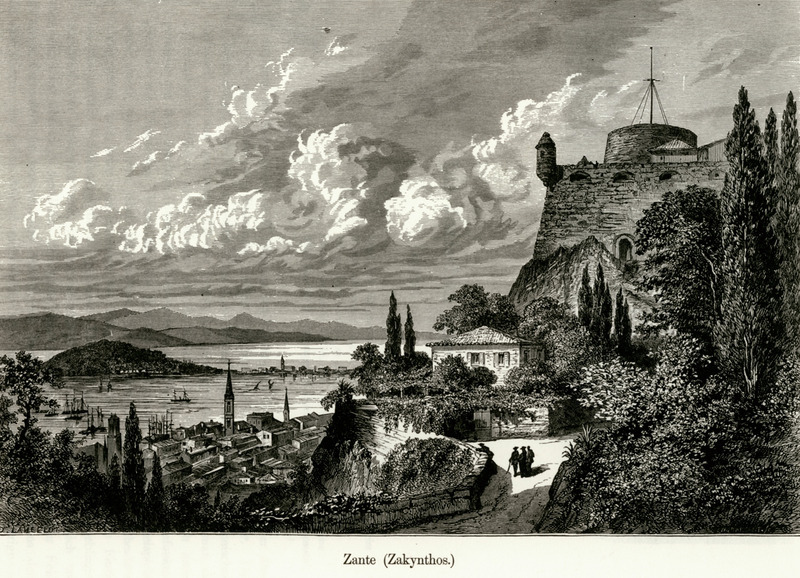 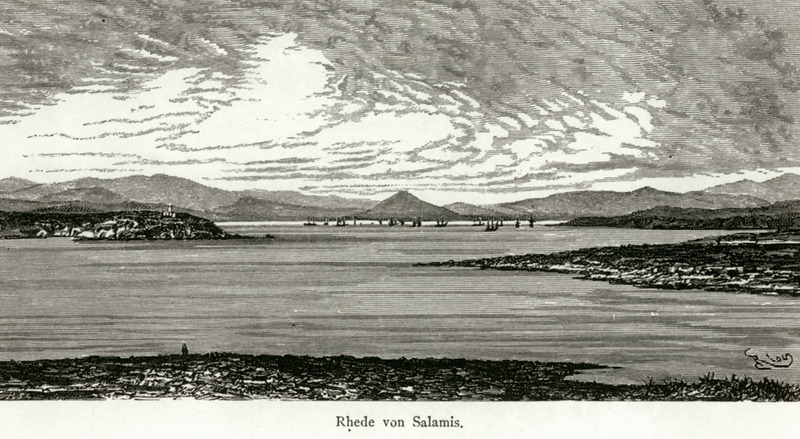 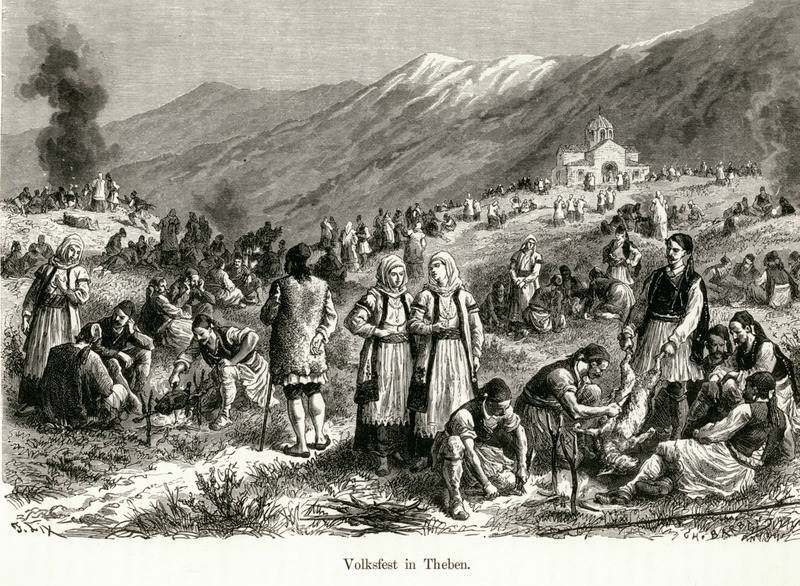 Sözkonusu yayın dışında Yunanistan'la ilgili bir de Rehber yayınladı (1890). 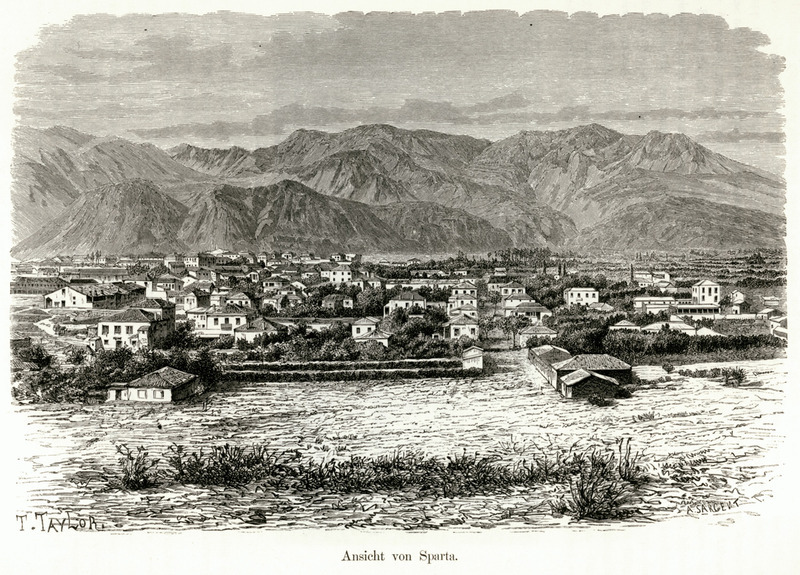 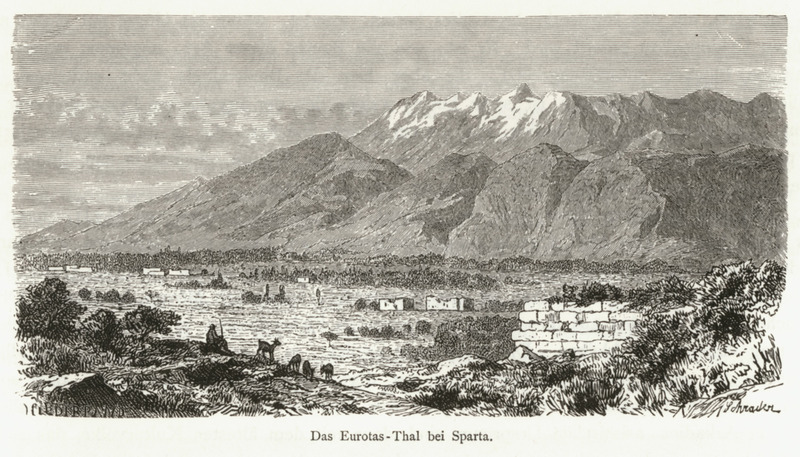 Yunanistan seyahati betimlemesi Atina ve Attika'dan başlayıp Peloponez'le devam eder [Korint, Argolida (Arhos ve çevresi), İsparta, Messini, Arkadya, İlia (Elis), Ahaia]. 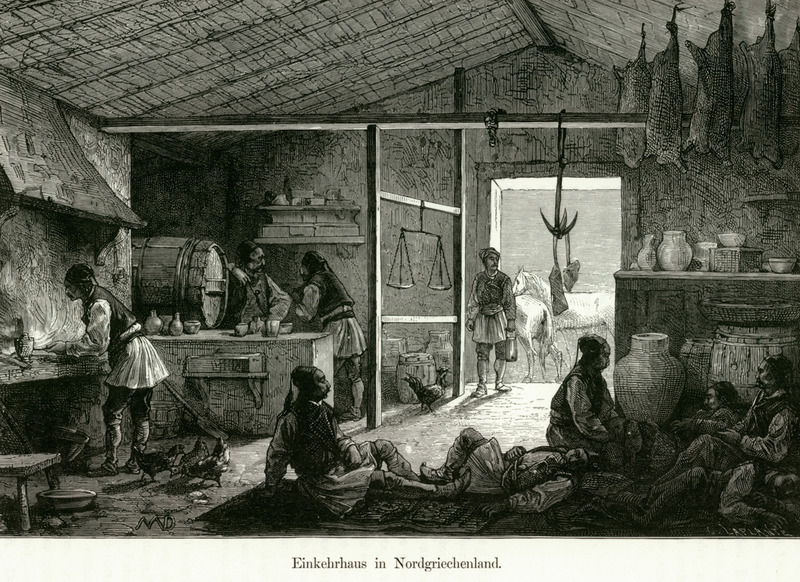 Gine Atina'dan yola çıkarak Schweiger Lerchenfeld Beotia, Fokida, Lokrida, Fthiotida'yı gezer, Aetolia, Akarnania ve Epir bölgelerine devam eder, oradan Tesalya'ya gelir. 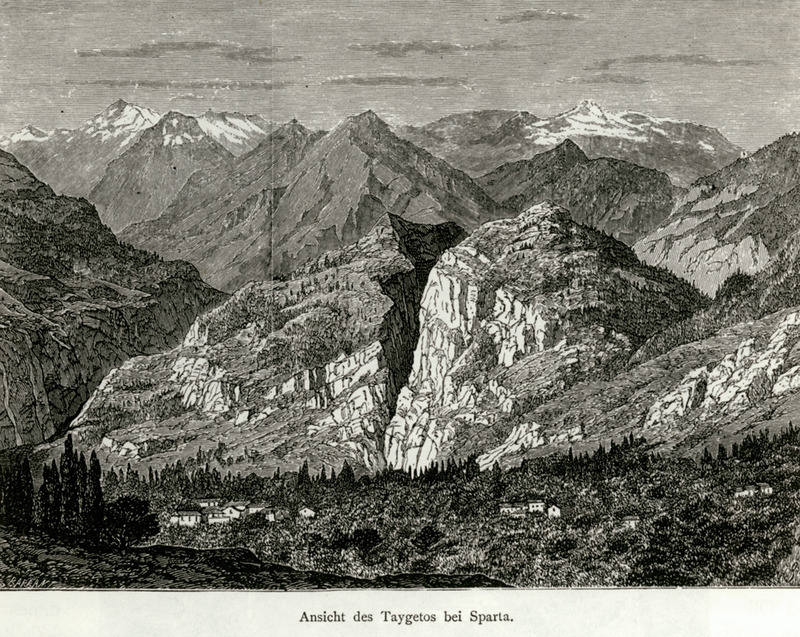 Gezgin yazar Volos'tan Sporad adalarına ve Eğriboz'a geçer, yolculuk nihayet İyon adalarında son bulur. 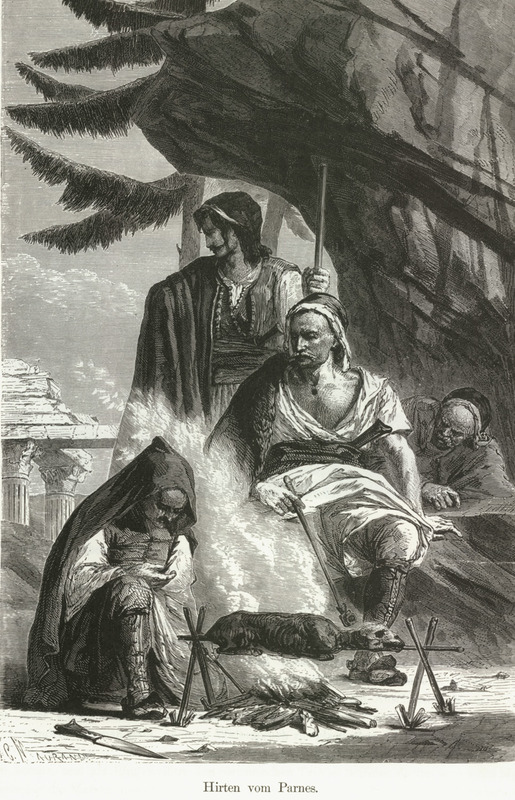 Kitap metinlerden bağımsız olan dekor amaçlı 60 adet gravür ve ayrıca metin içerisinde sözkonusu yerler ve anıtlara ilişkin daha küçük boyutta 140 tane gravürle tamamlanmakta. 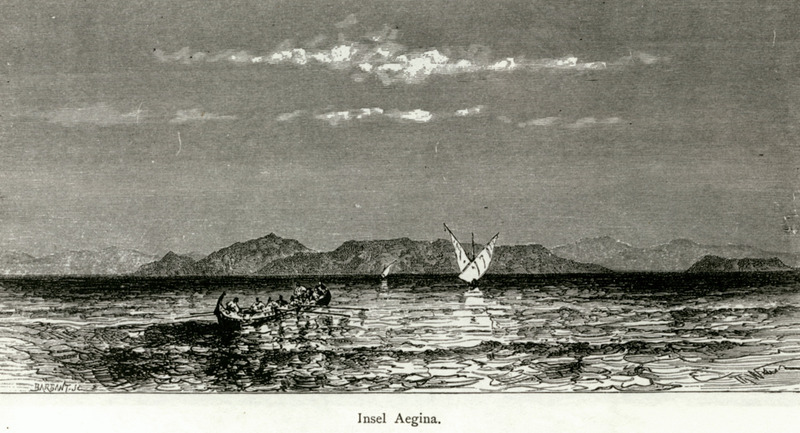 Yerler ve insanlar hakkında verilen bilgiler hem tarihî hem çağdaş olaylara ilişkin. 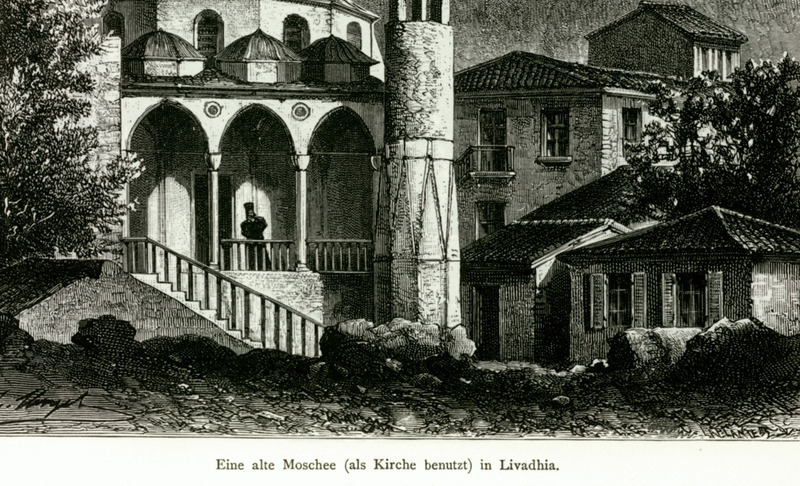 Bunlar kâh romantik kâh eleştirel bir tarzla betimlenmekte. 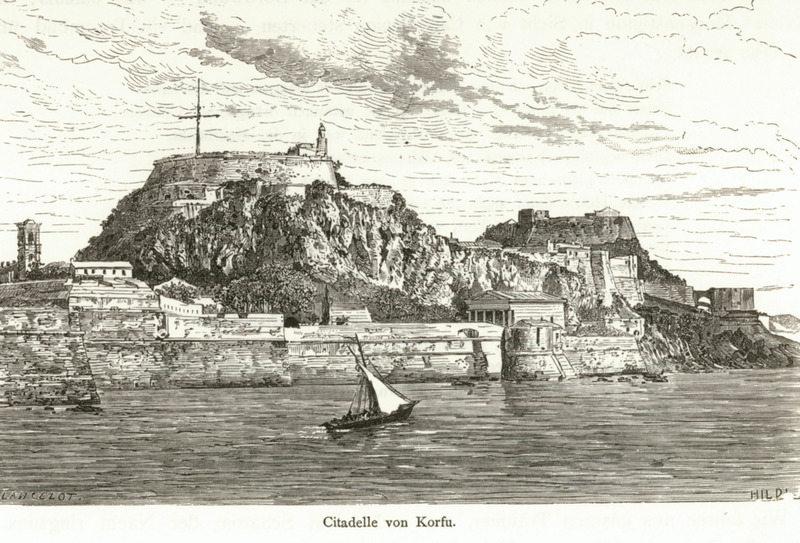 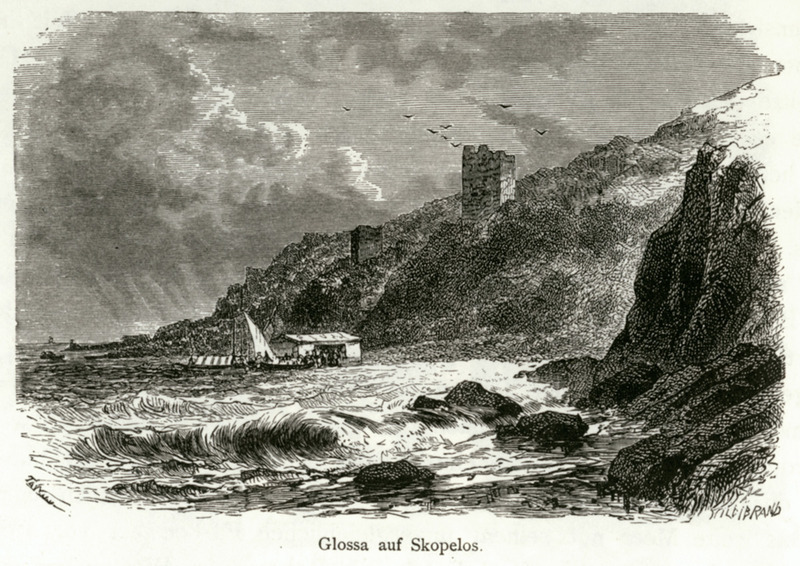 The medieval castle of Kea island. 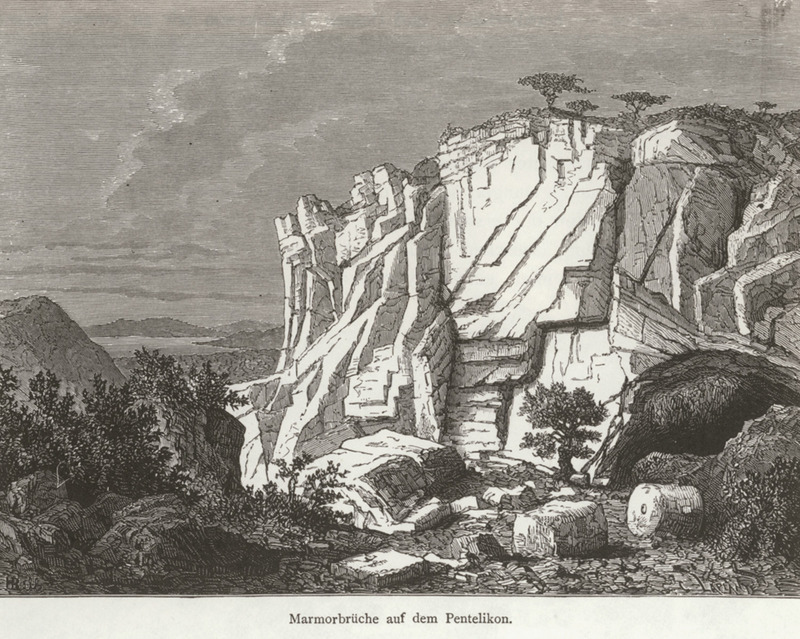 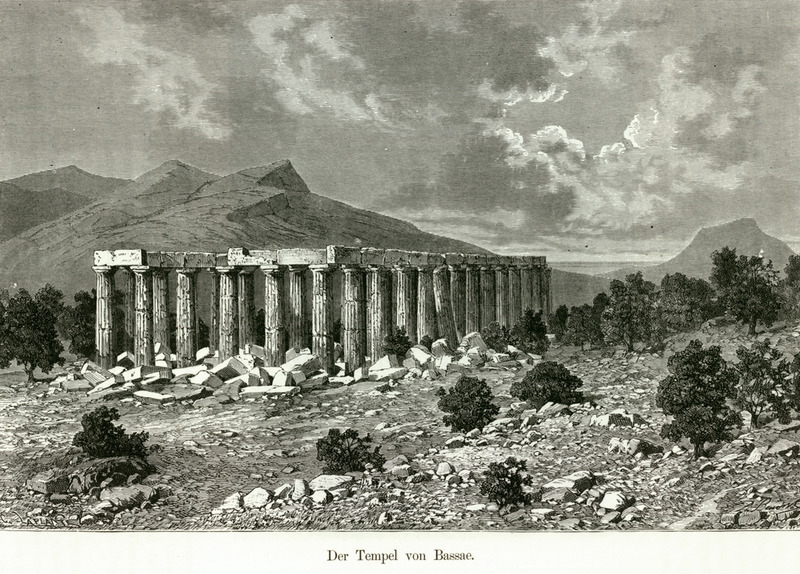 Ruins of the Temple of Zeus in Nemea. 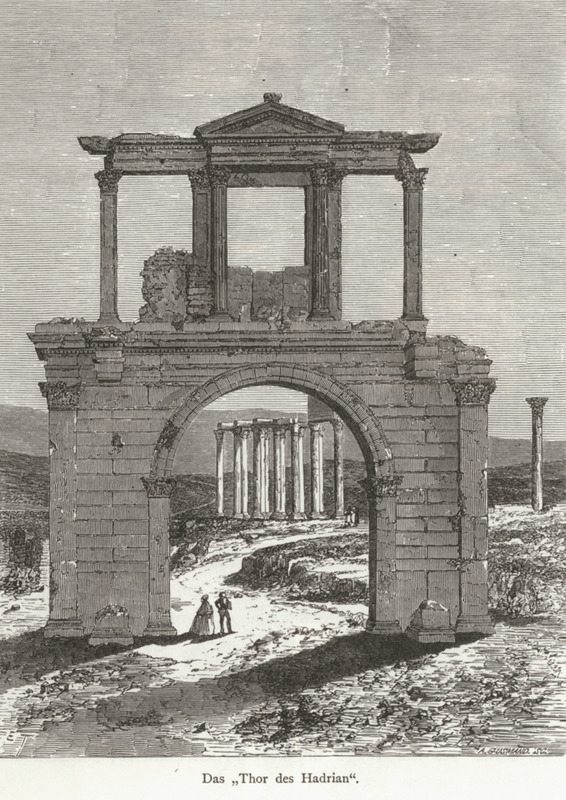 The Arcadian Gate of ancient Messene. 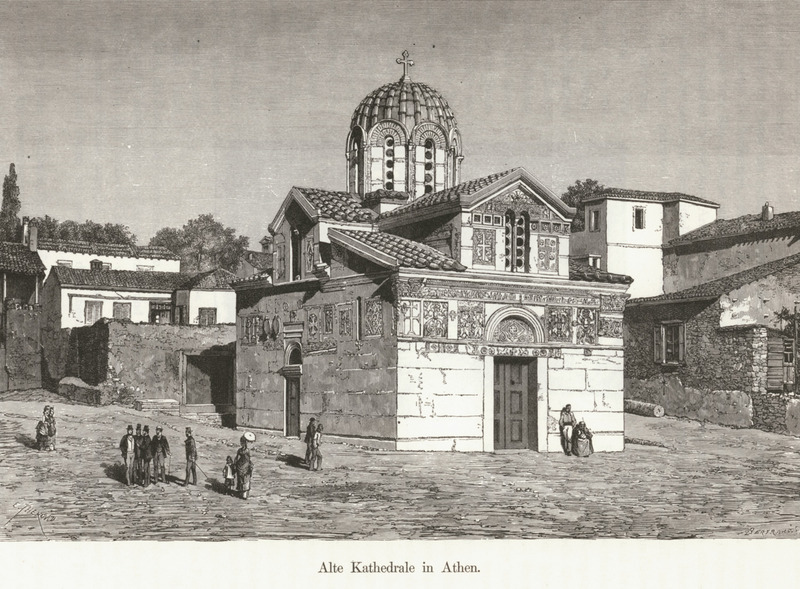 The church of Hagia Samarina in Androusa. 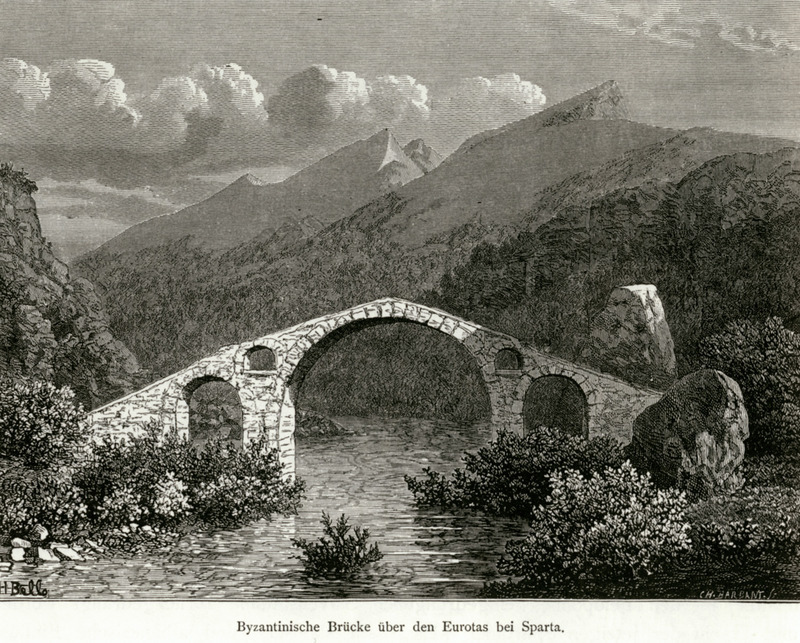 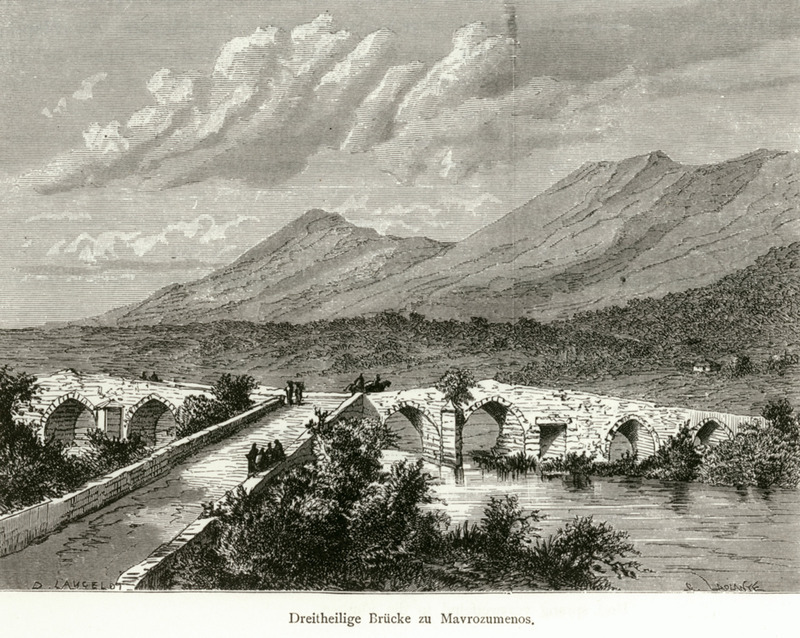 Bridge over Neda river, on the road to Phigaleia. 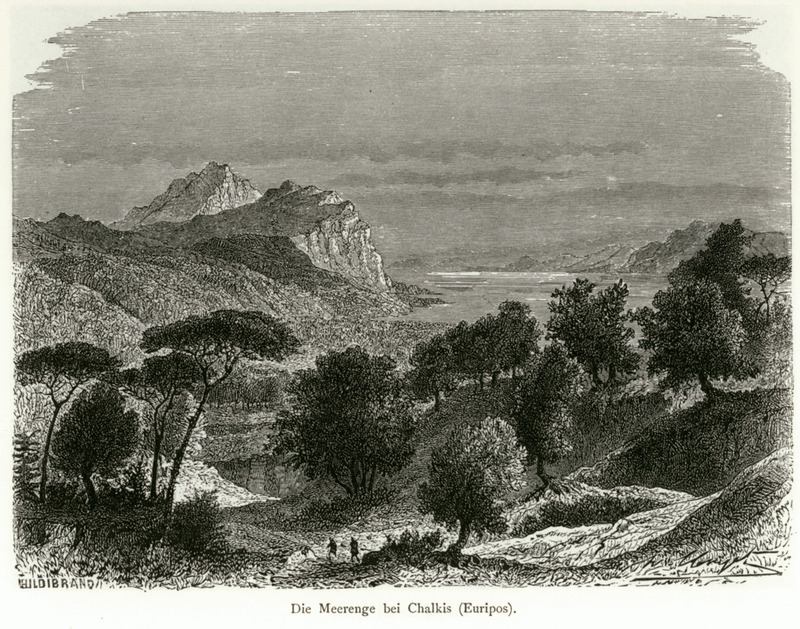 View of the valley of Neda. 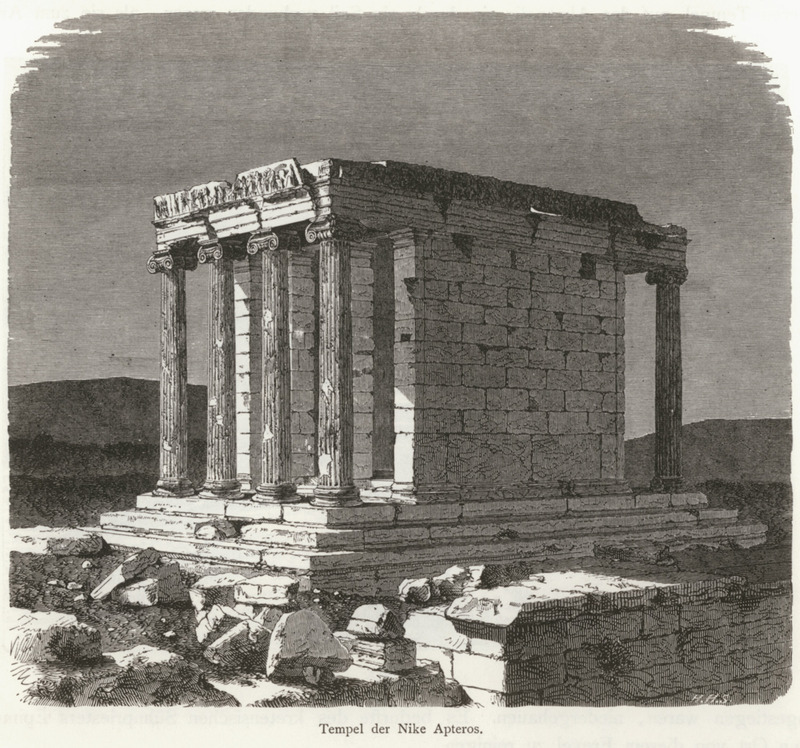 The Temple of Apollo Epicurius in Bassae (Phigaleia). 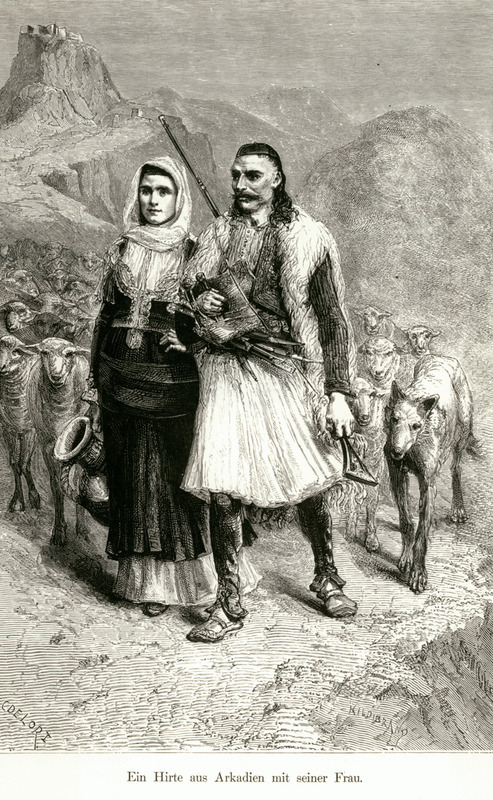 Married couple of shepherds from Arcadia. 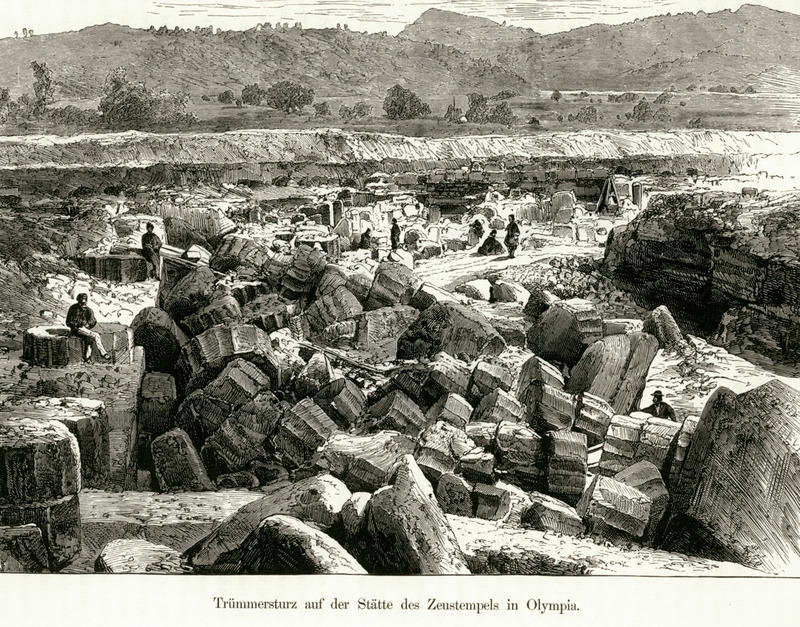 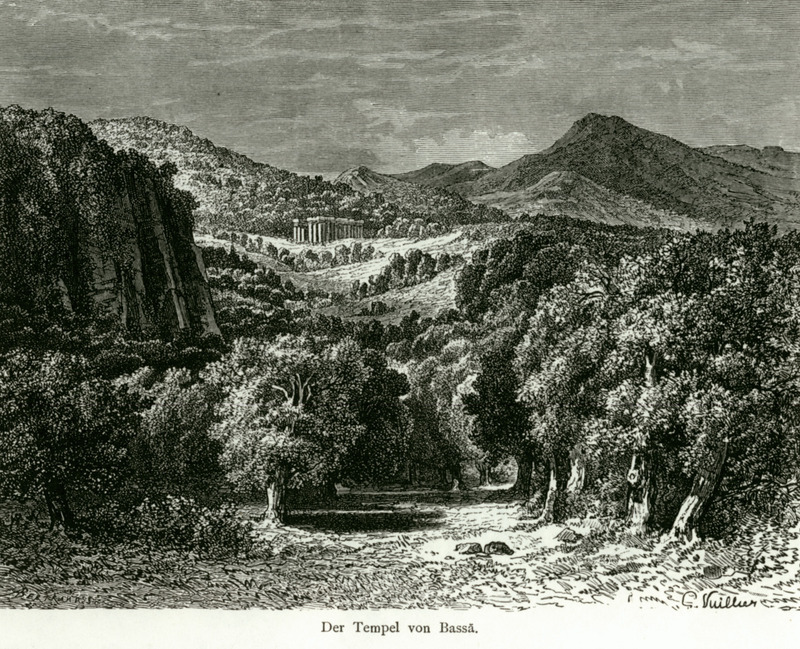 Ruins on the site of the Temple of Zeus in Olympia. 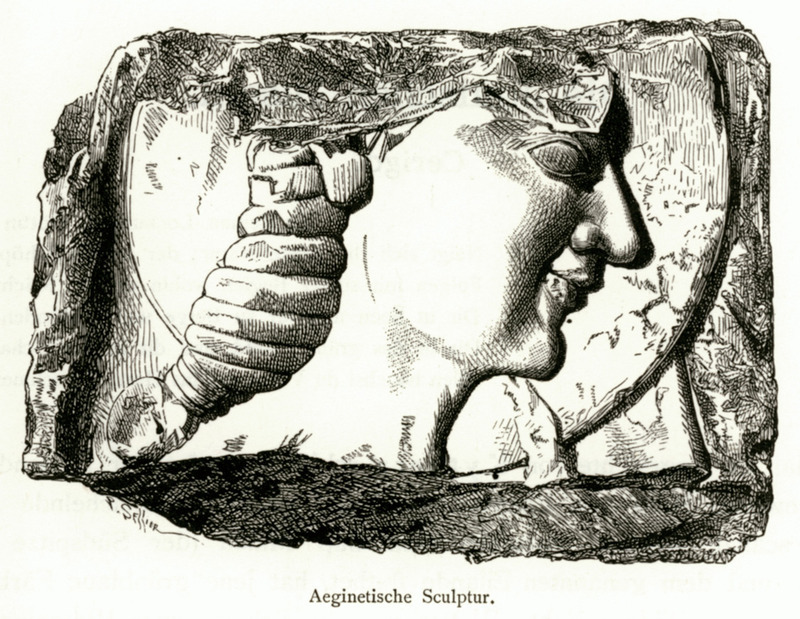 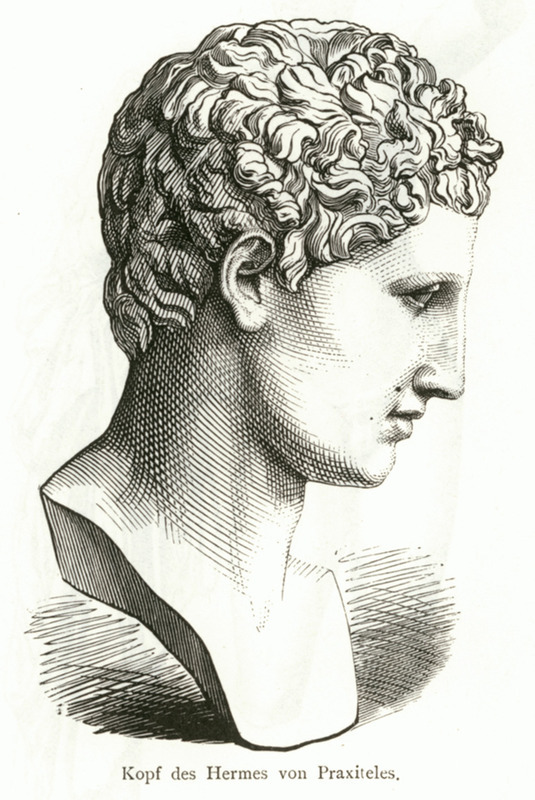 The head of Hermes of Praxiteles. 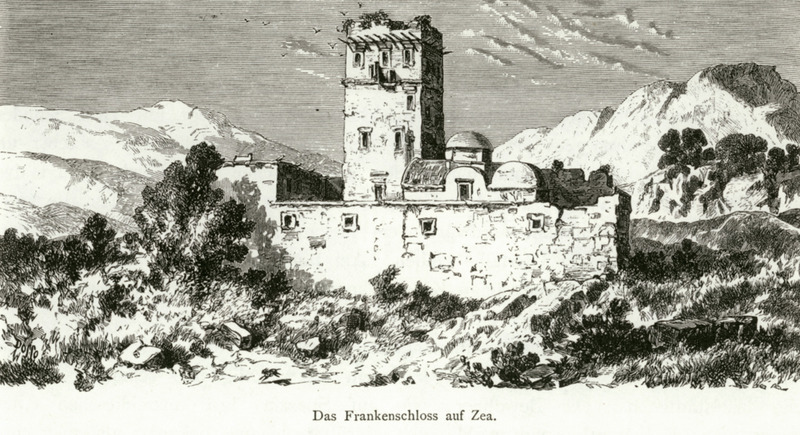 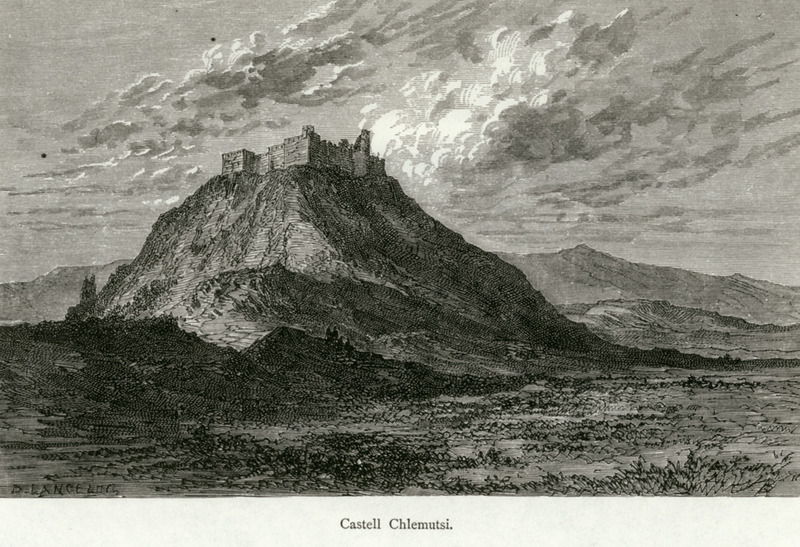 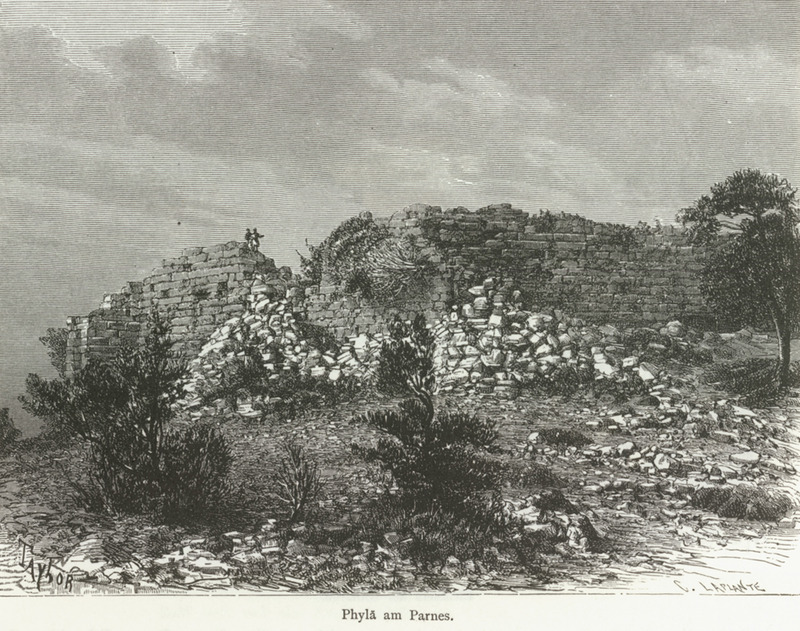 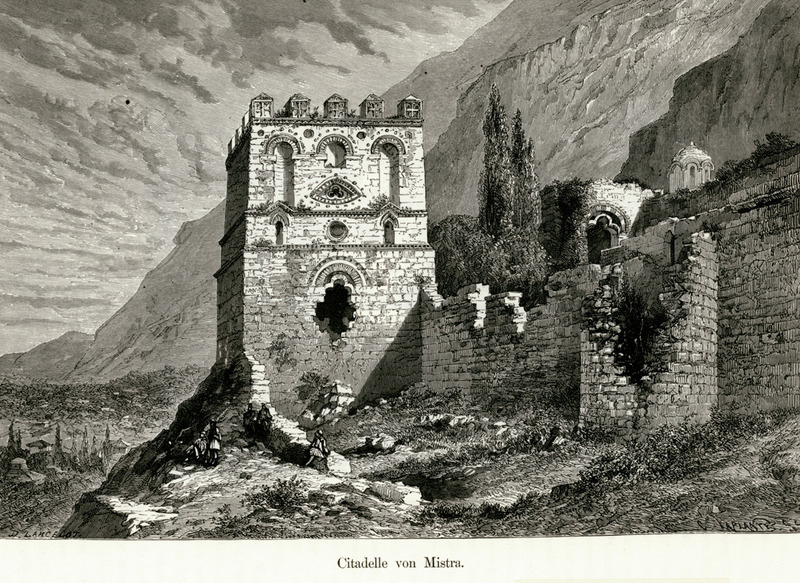 The castle of Cyllene or Chlemoutsi. 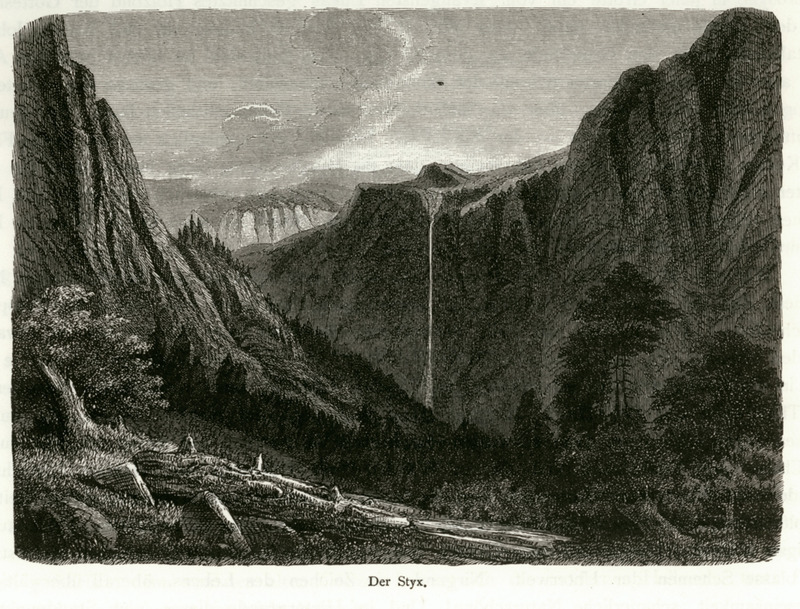 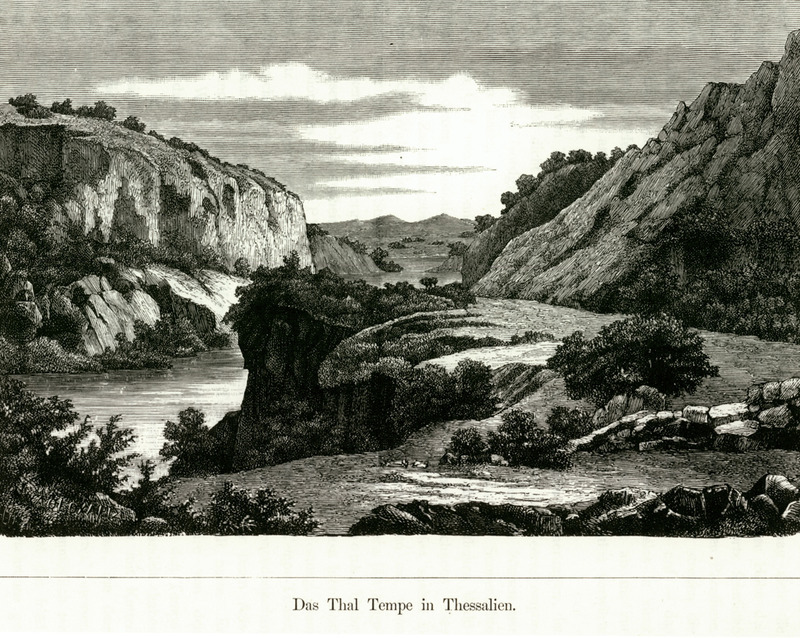 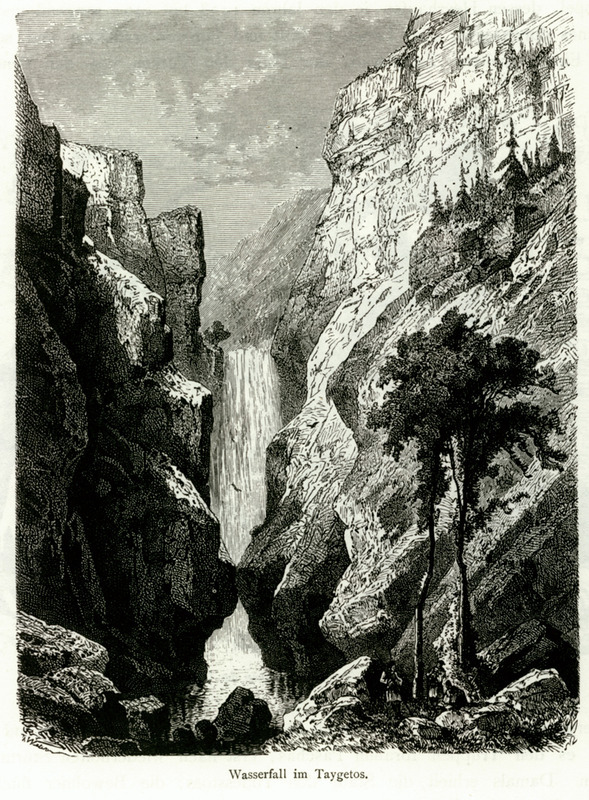 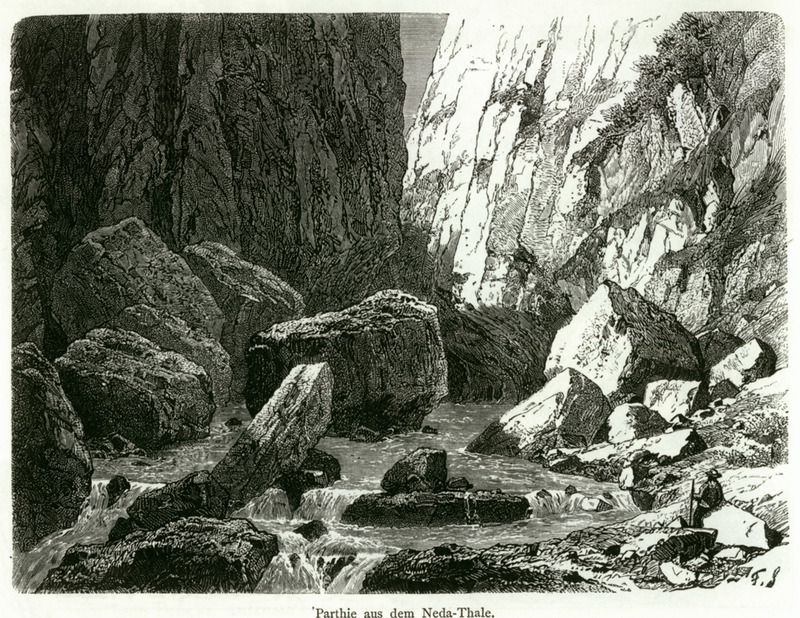 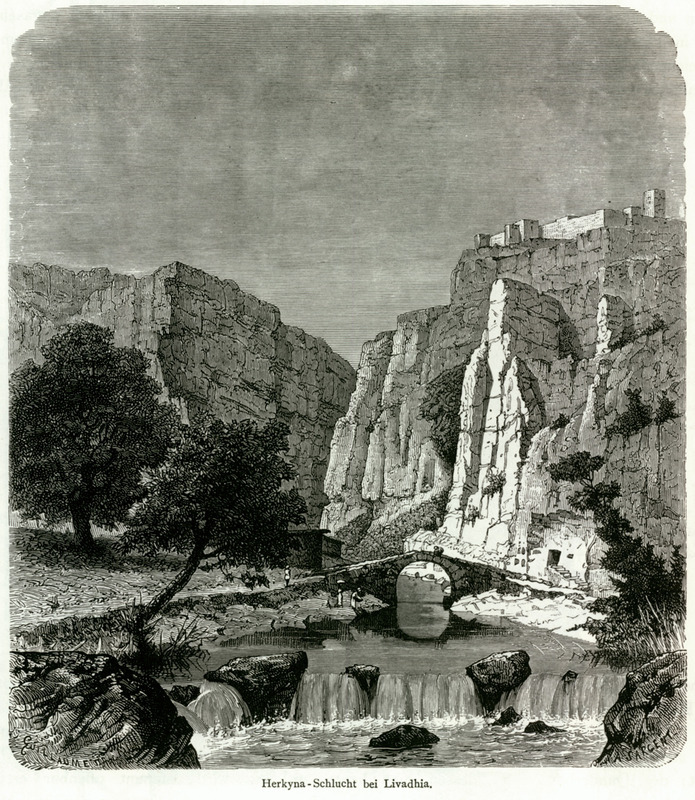 The waterfalls of Styx in the Peloponnese. 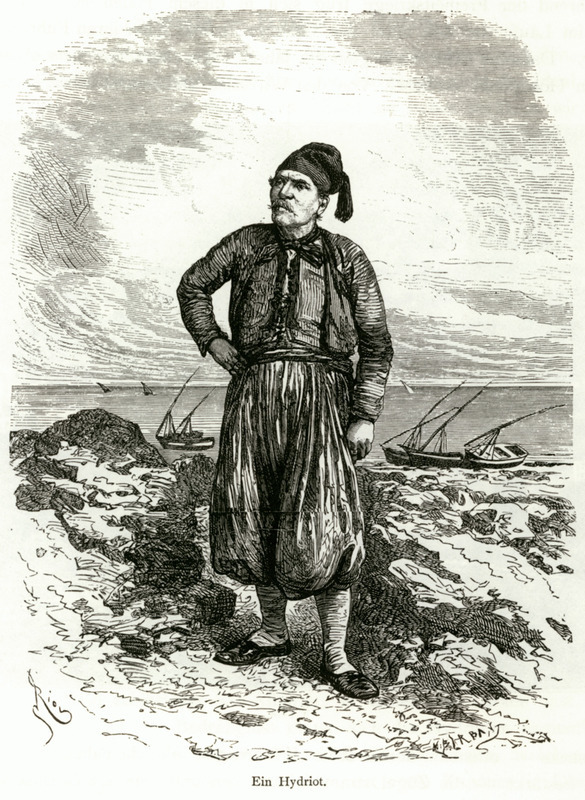 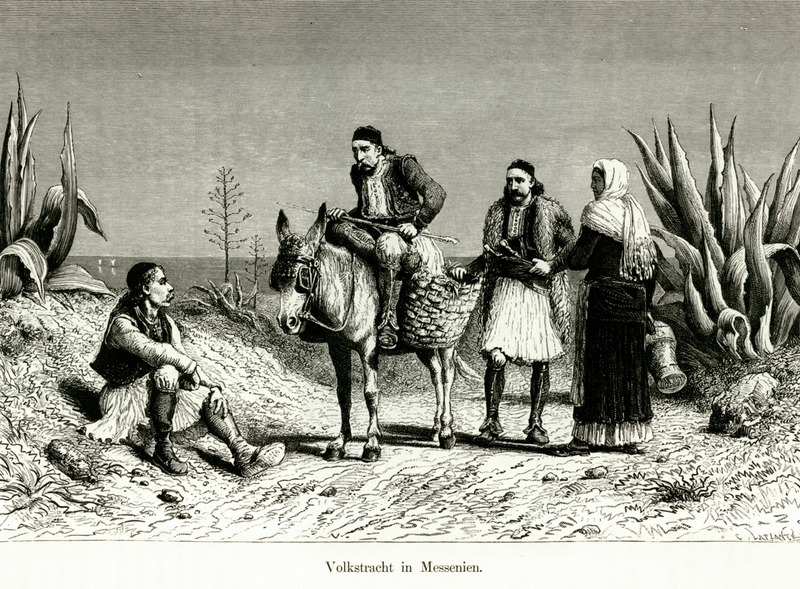 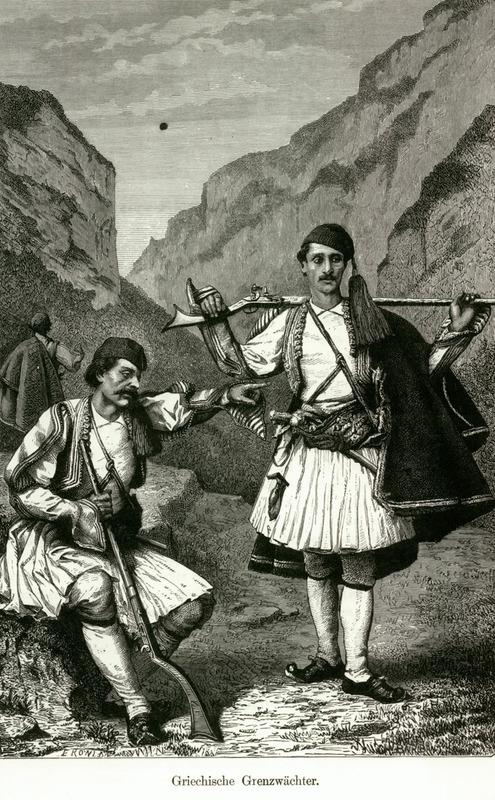 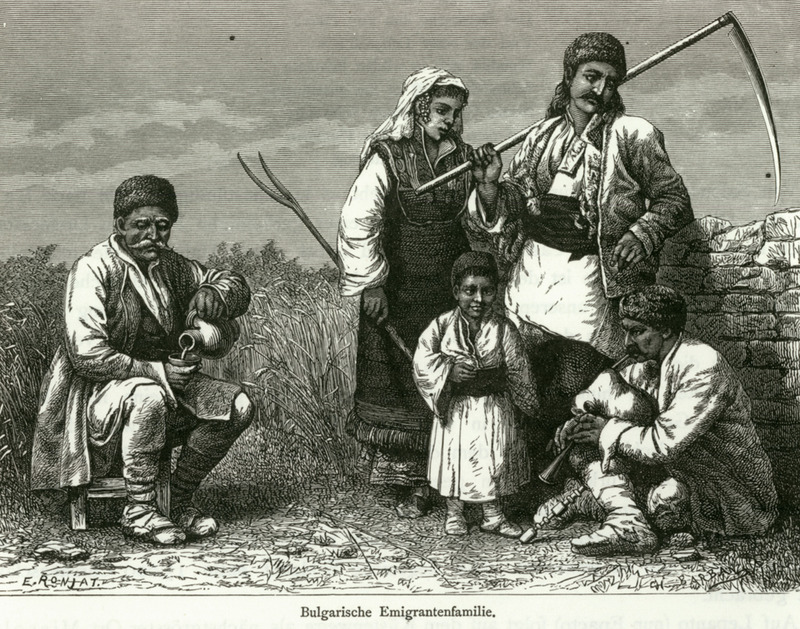 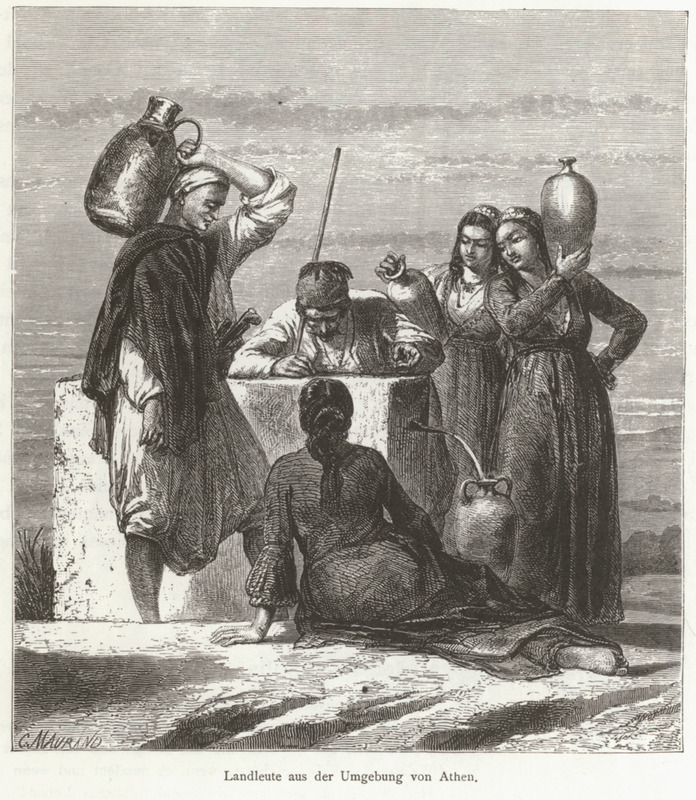 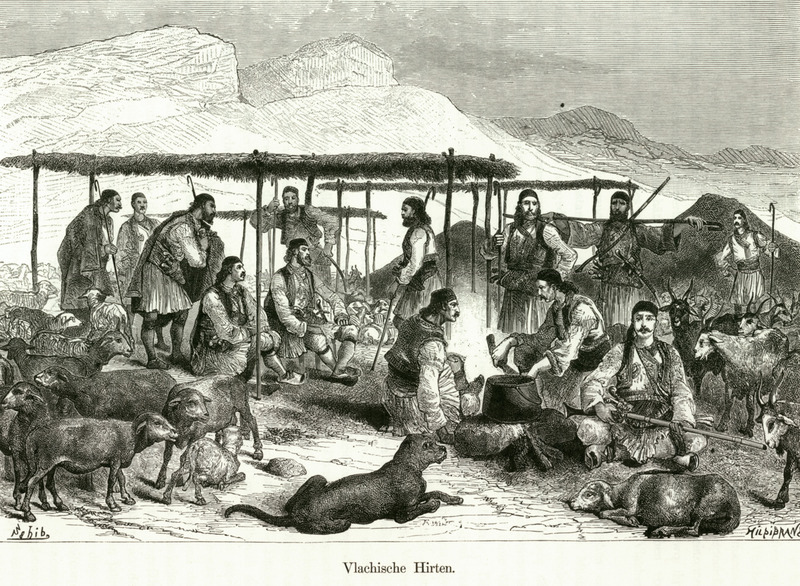 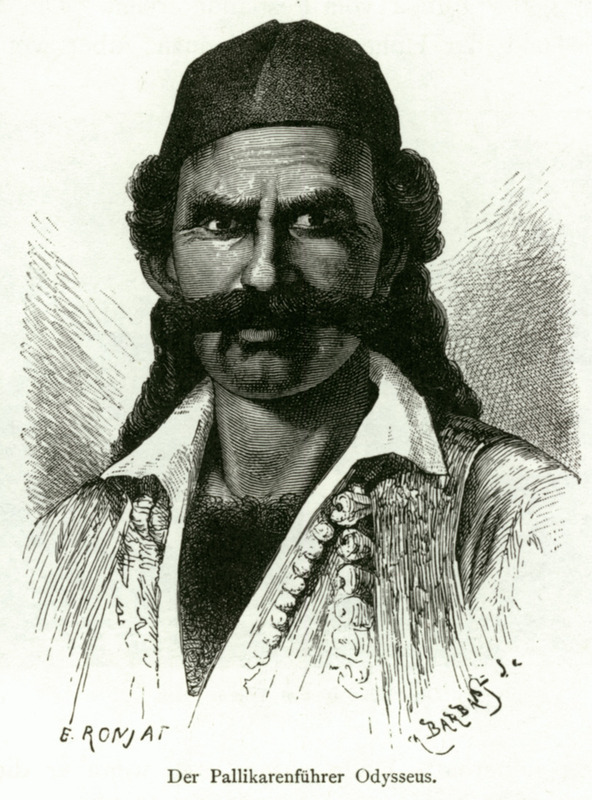 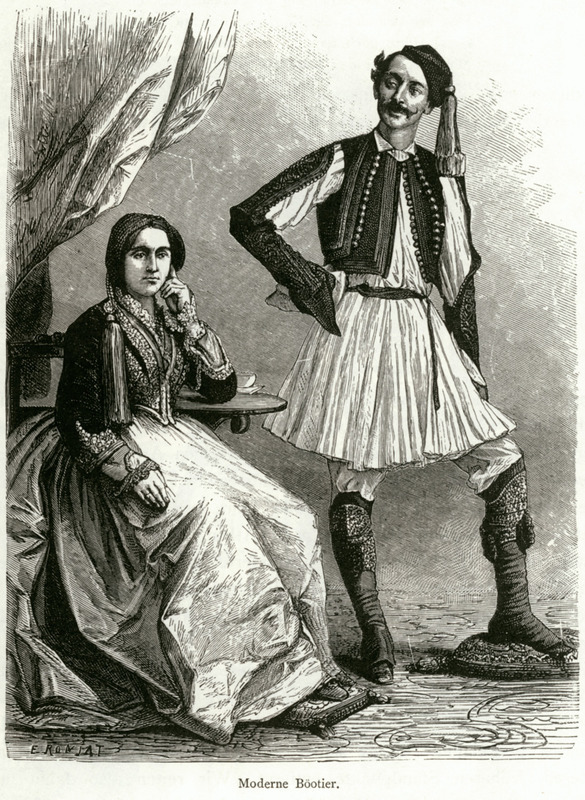 Natives of Boeotia, second half of the 19th century. 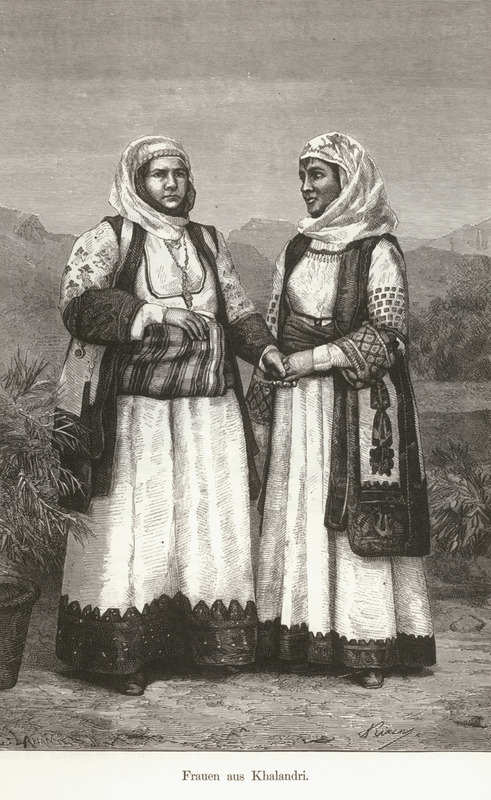 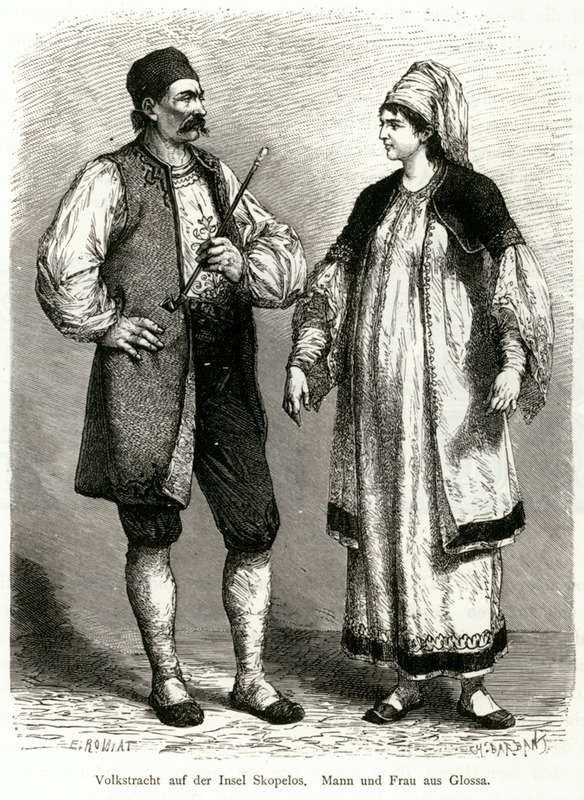 Inhabitants of Vilia in traditional costumes. 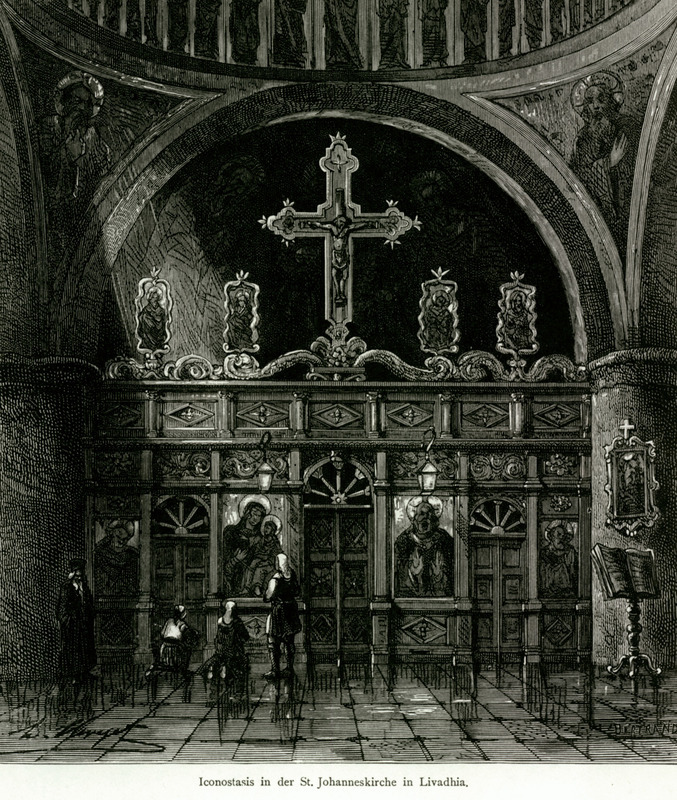 Iconostasis of the church of Agios Ioannis in Livadeia. 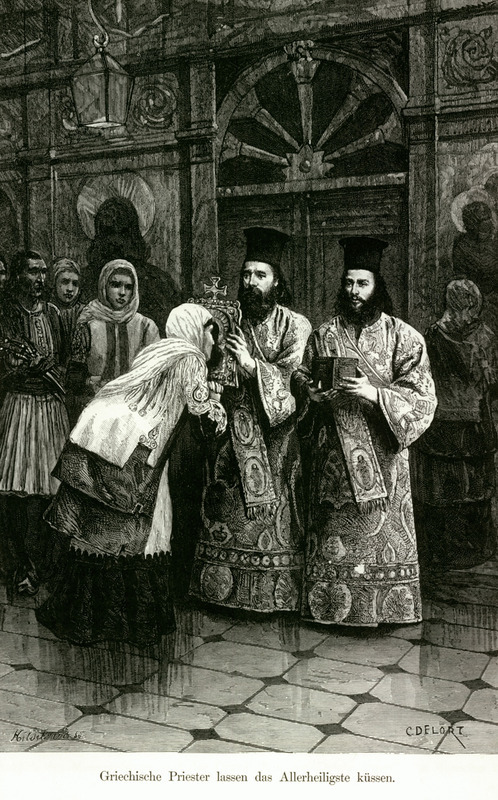 Churchgoers kissing a holy icon. 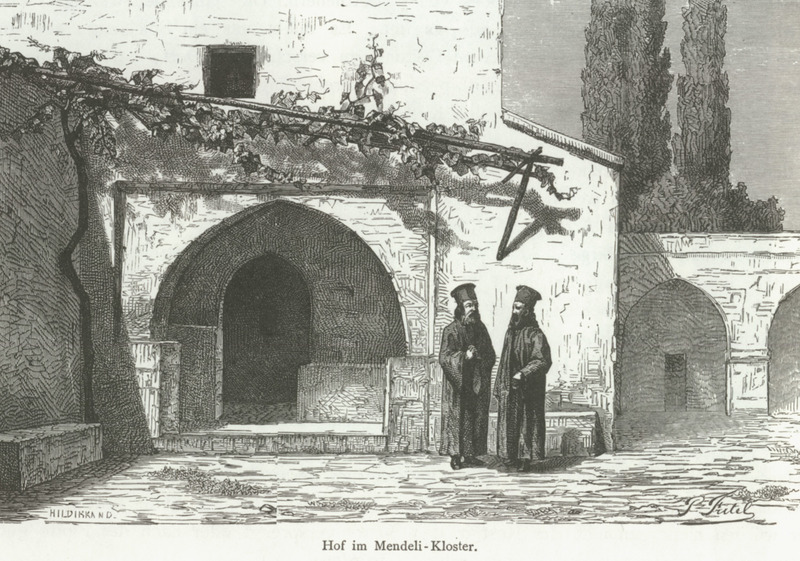 The court of Hosios Loukas monastery in Steiri. 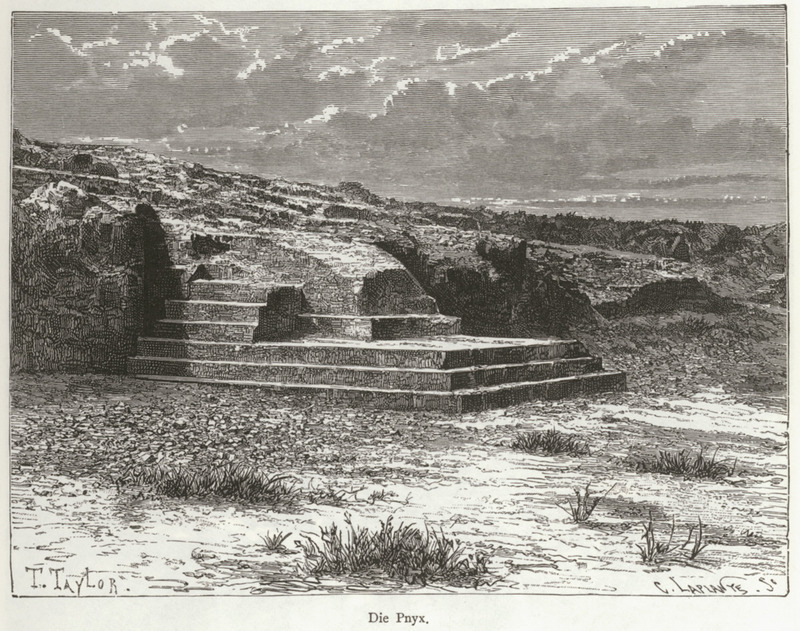 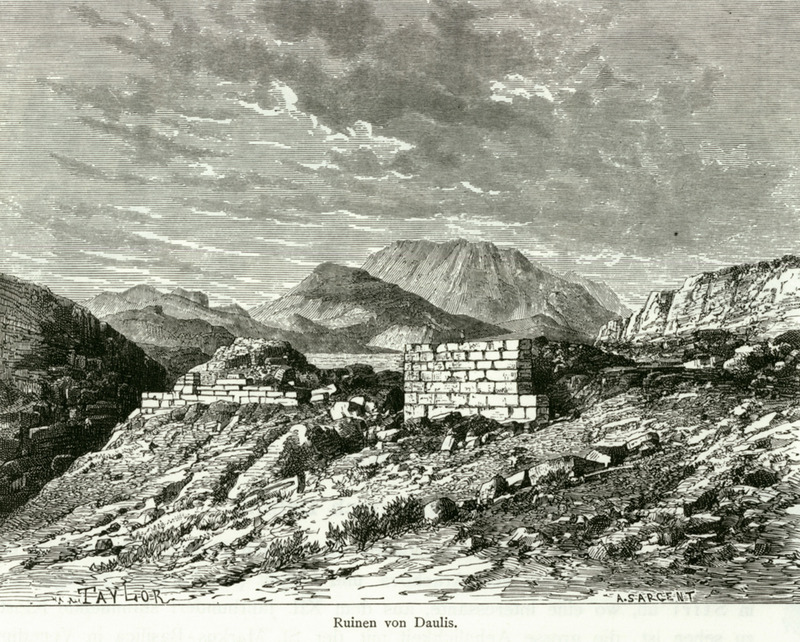 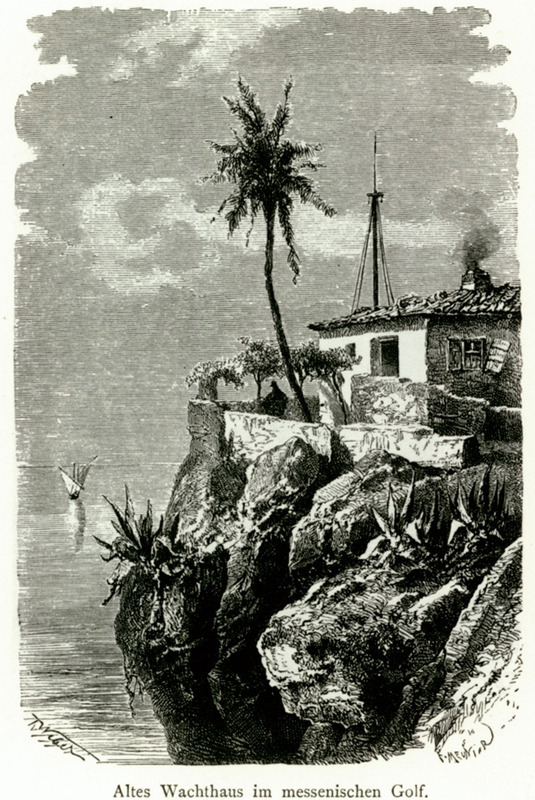 The remains of ancient Dauleia. 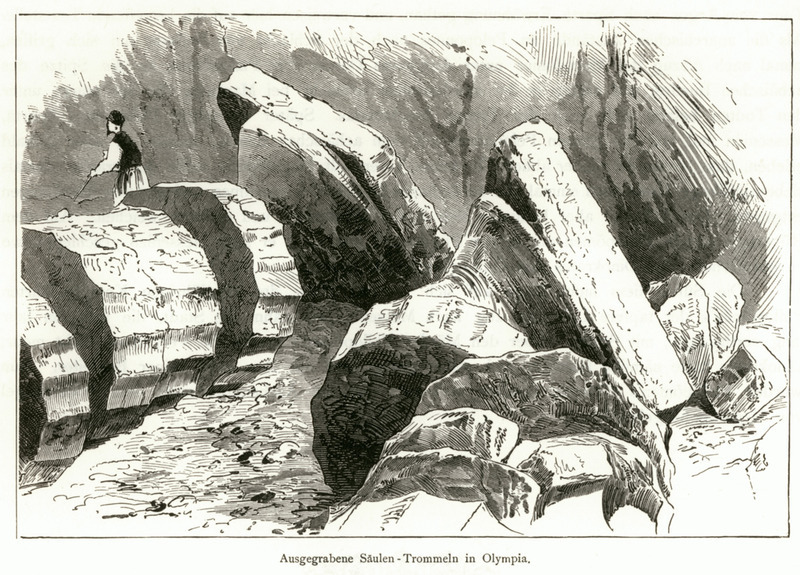 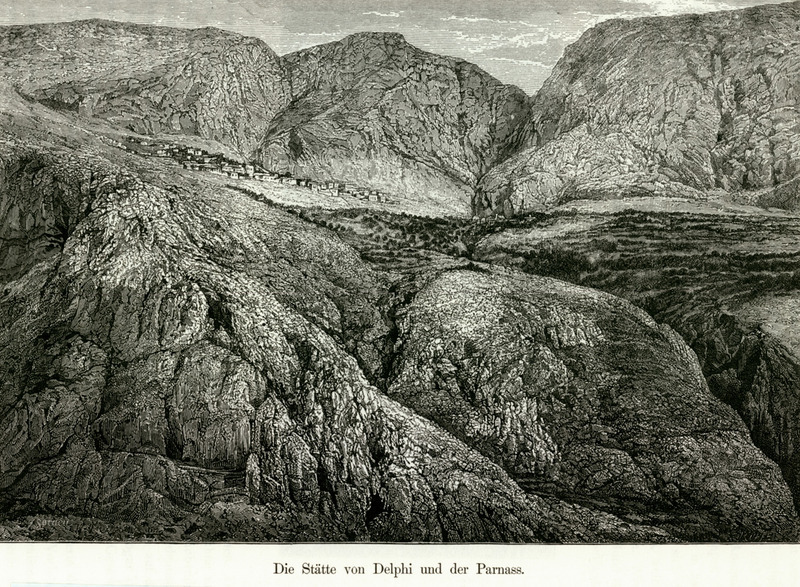 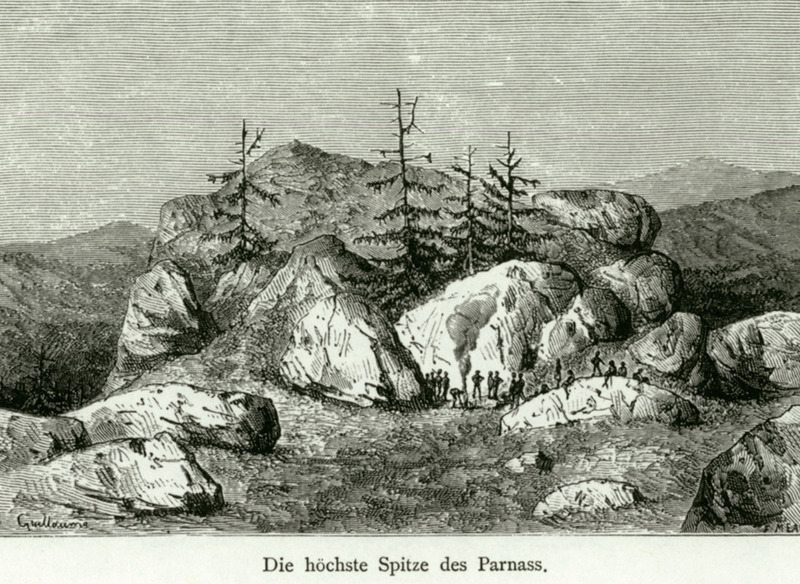 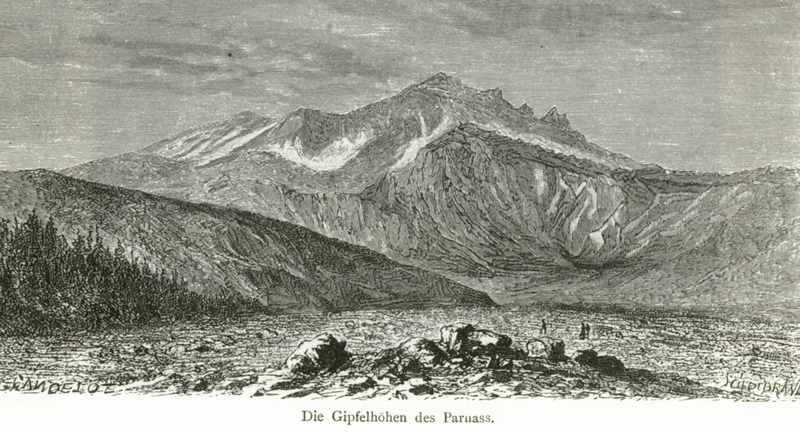 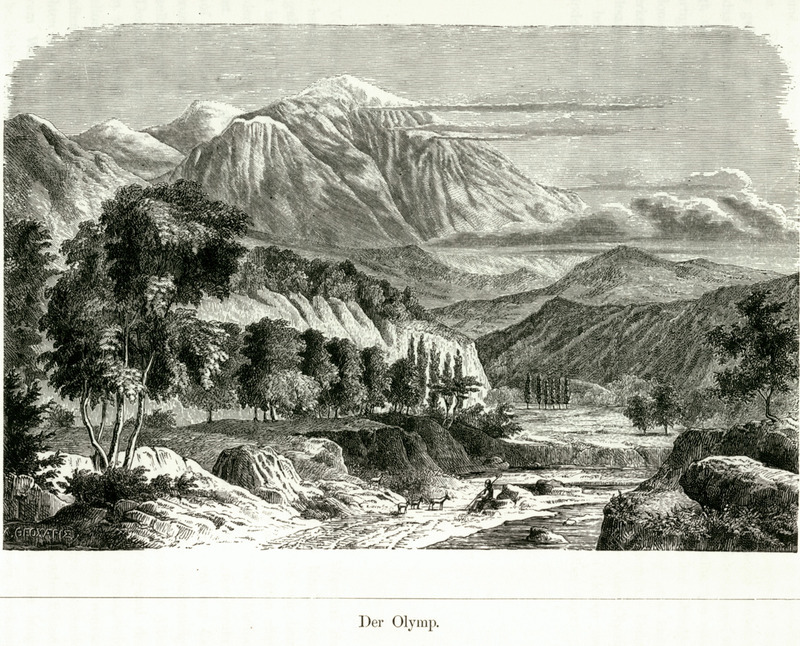 The summits of Mount Parnassus. 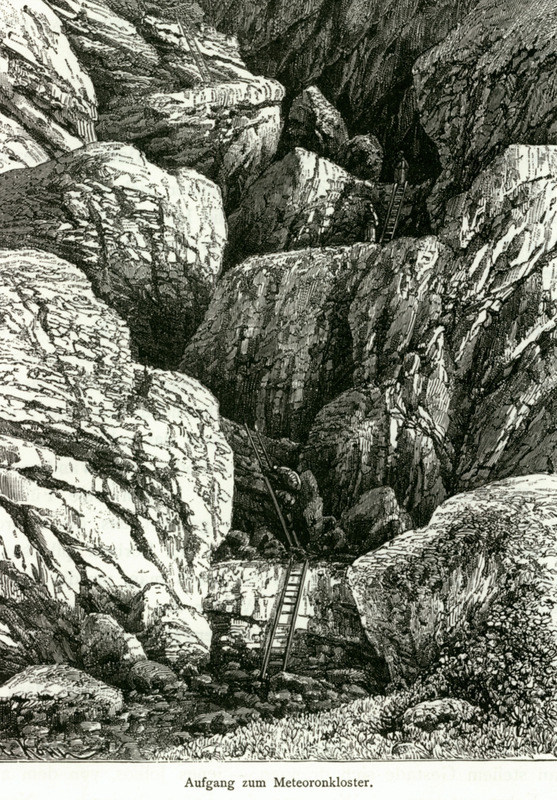 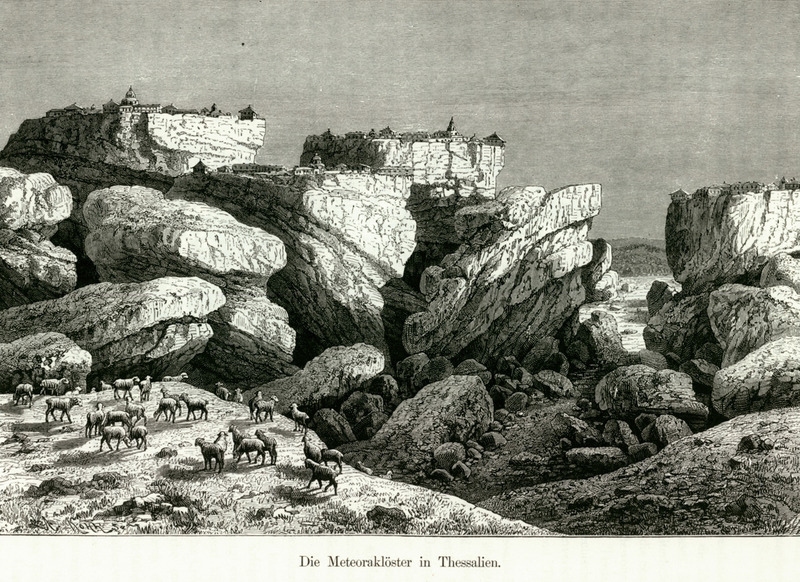 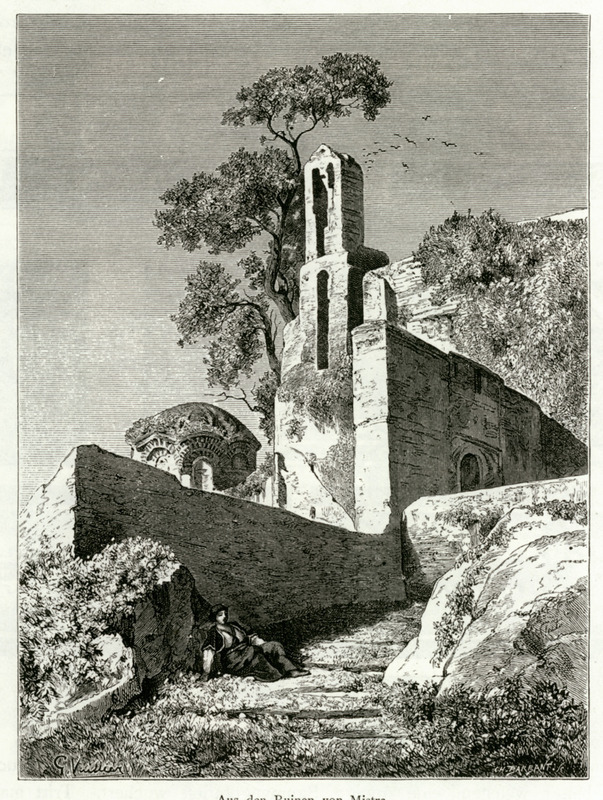 The ascent to the monastery of Great Meteoron. 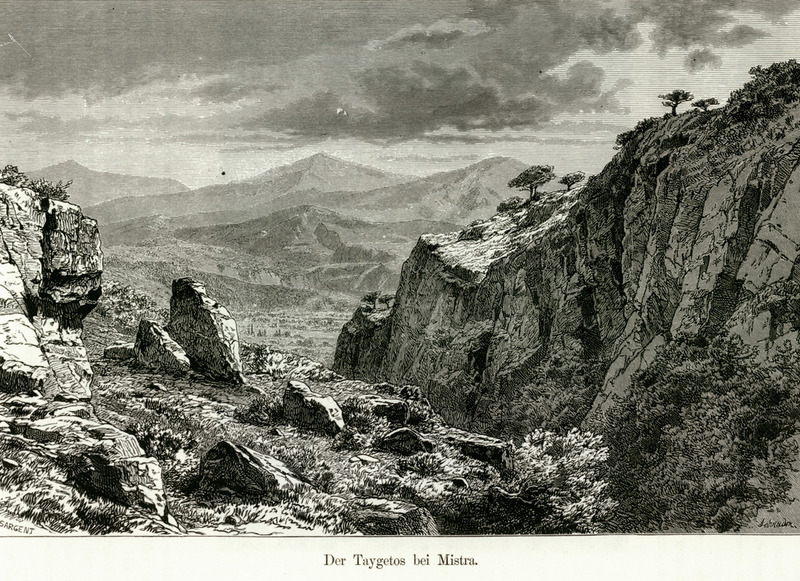 Meteora. 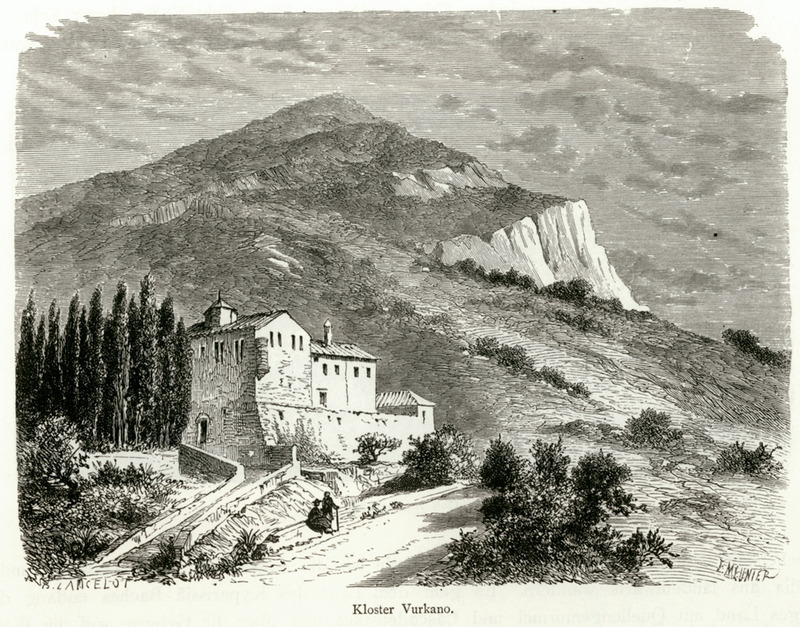 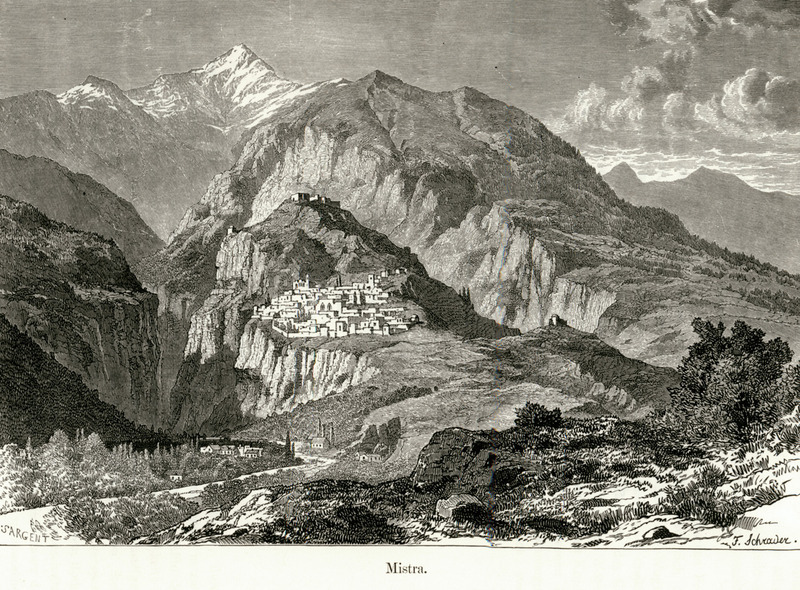 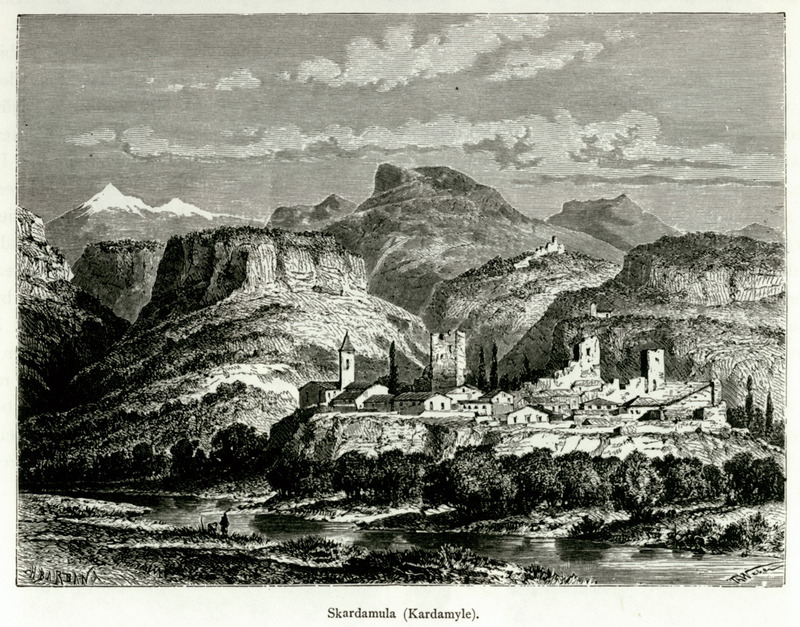 View of Varlaam and Great Meteoron monasteries. 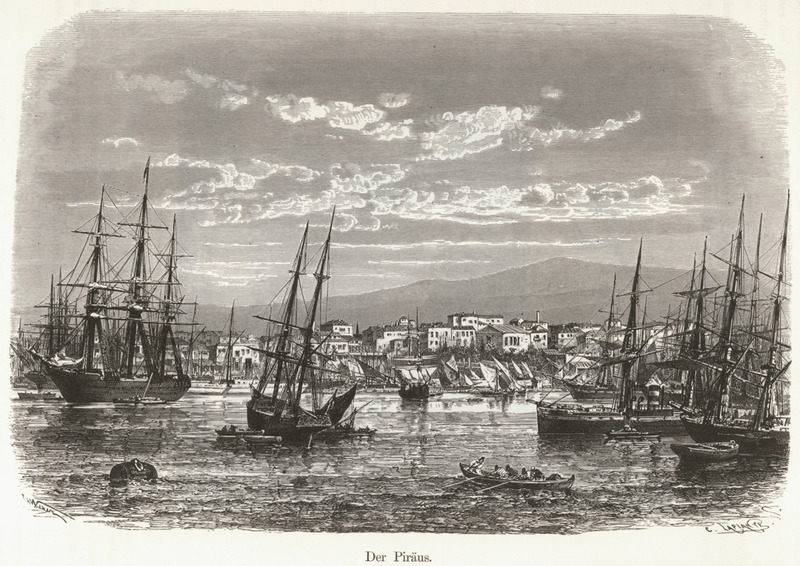 The harbour of Panormos on Skopelos. 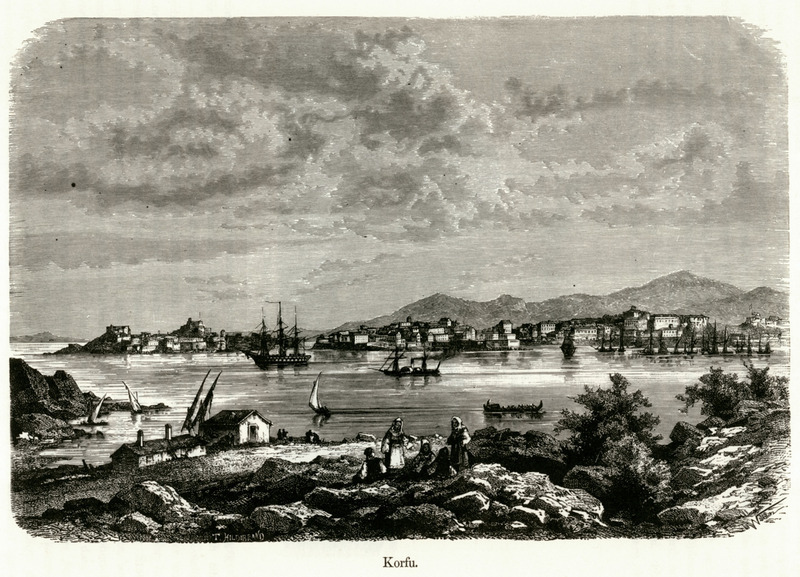 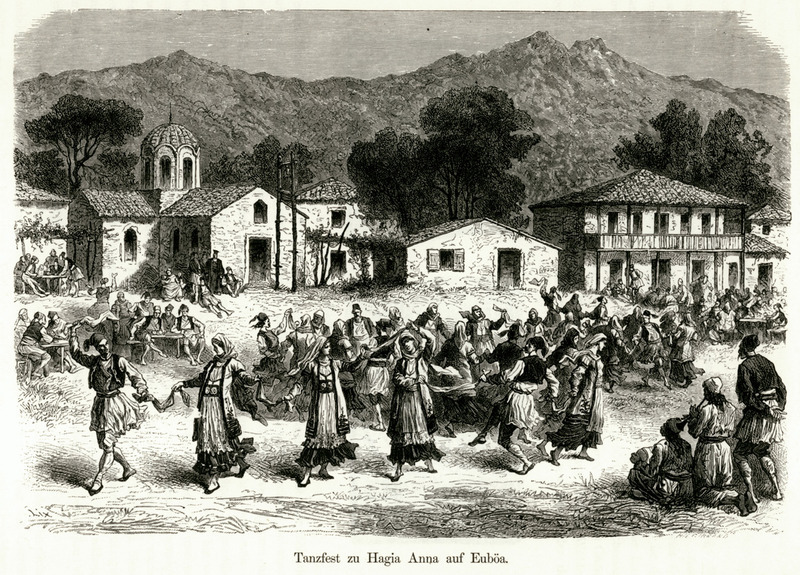 Fair at Agia Anna in Euboea. 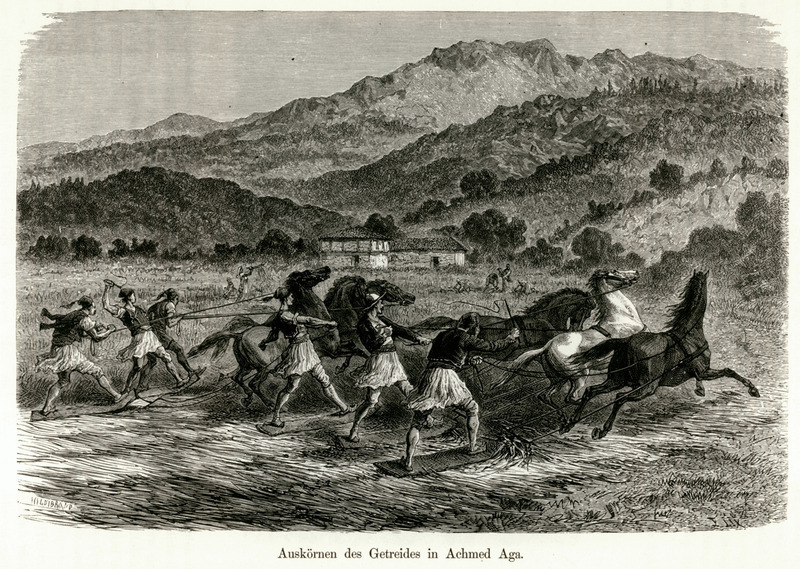 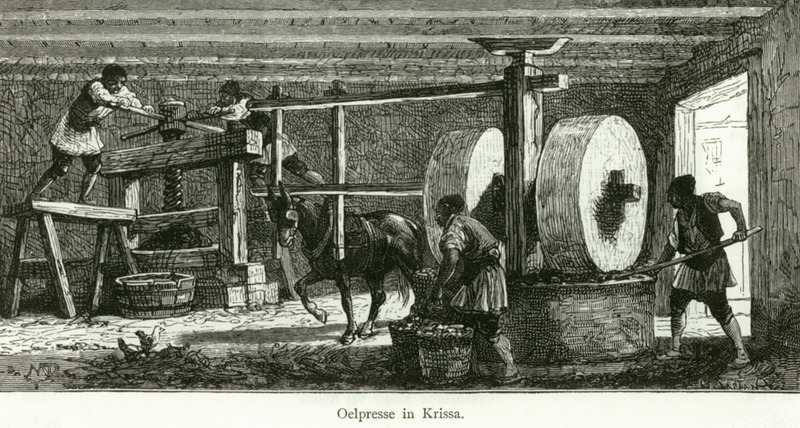 Threshing in the village of Ahmet Aga (Prokopi) in Euboea. 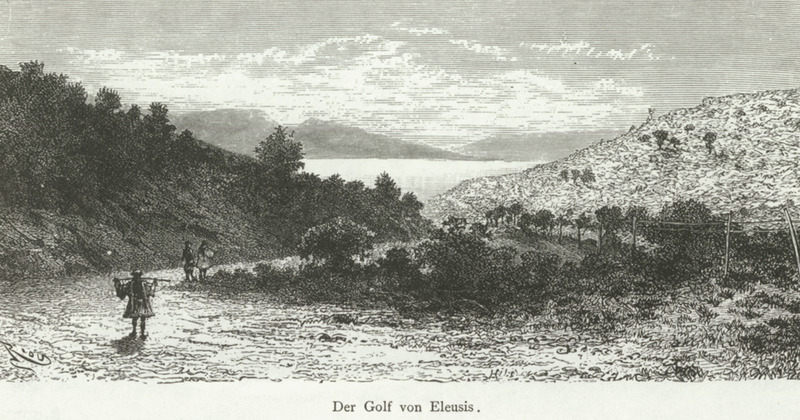 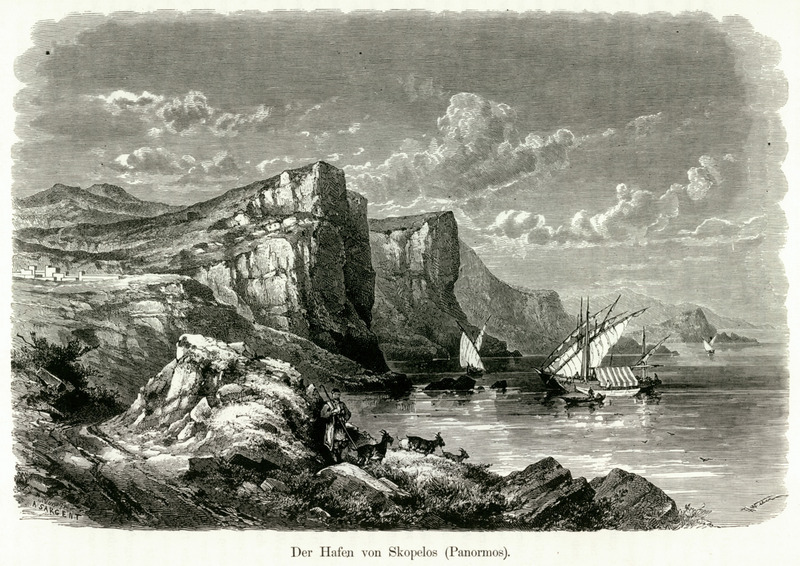 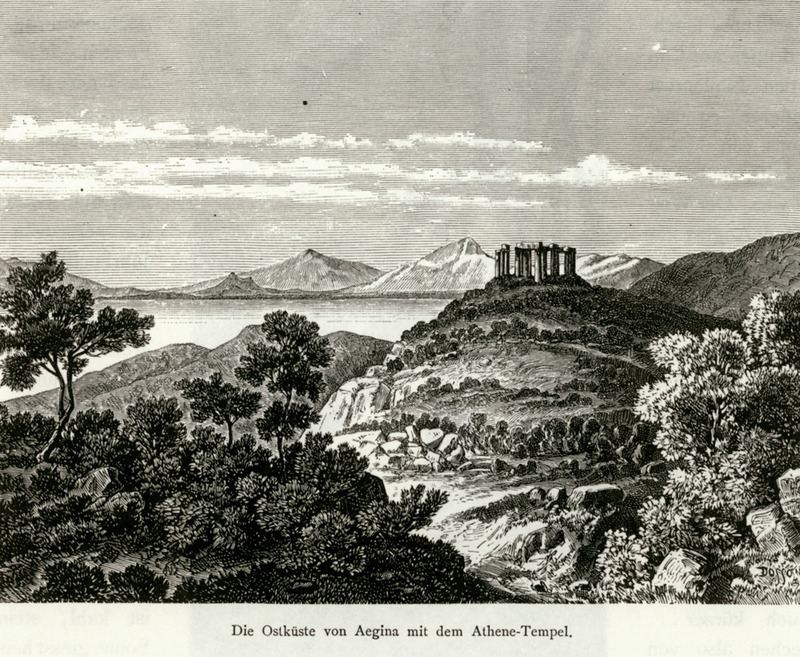 The easter coast of Aegina with the temple of Aphaia. 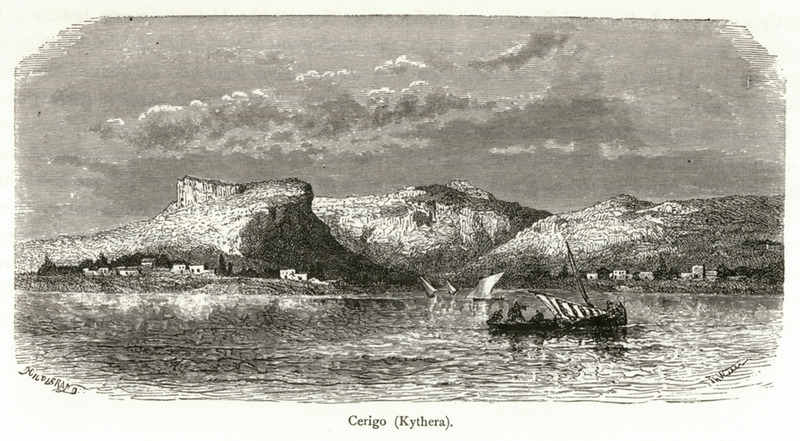 The village of Potamos on Corfu. 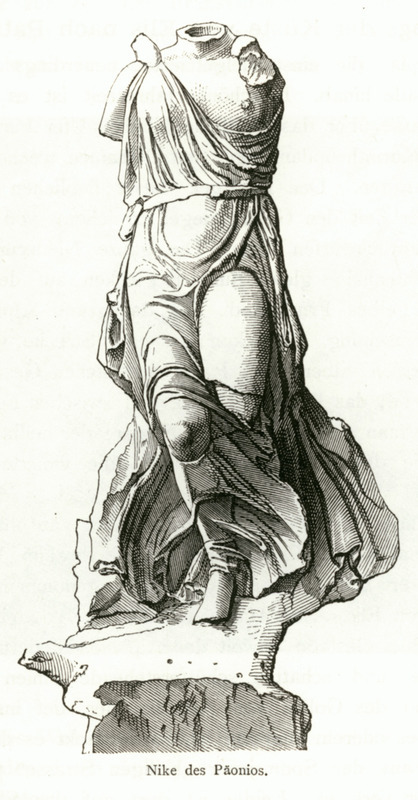 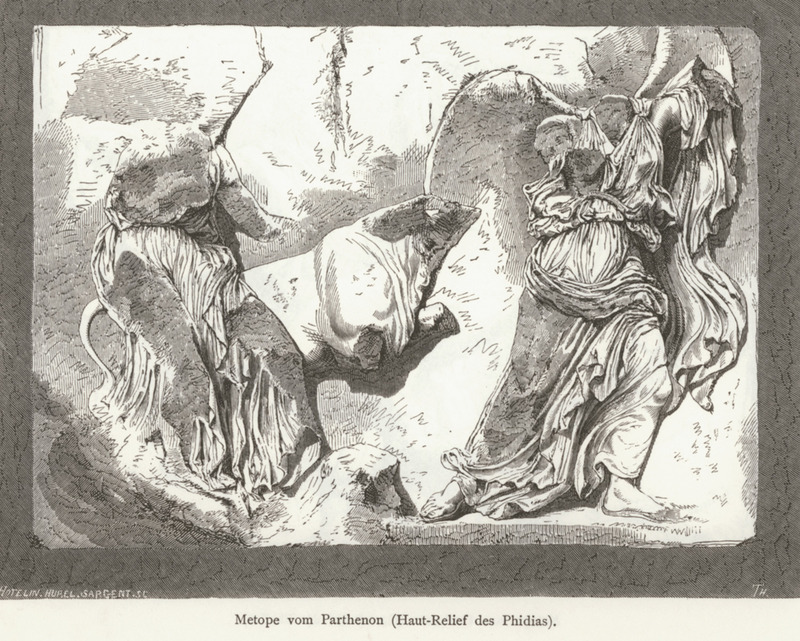 The statue of Nike by Paeonius. 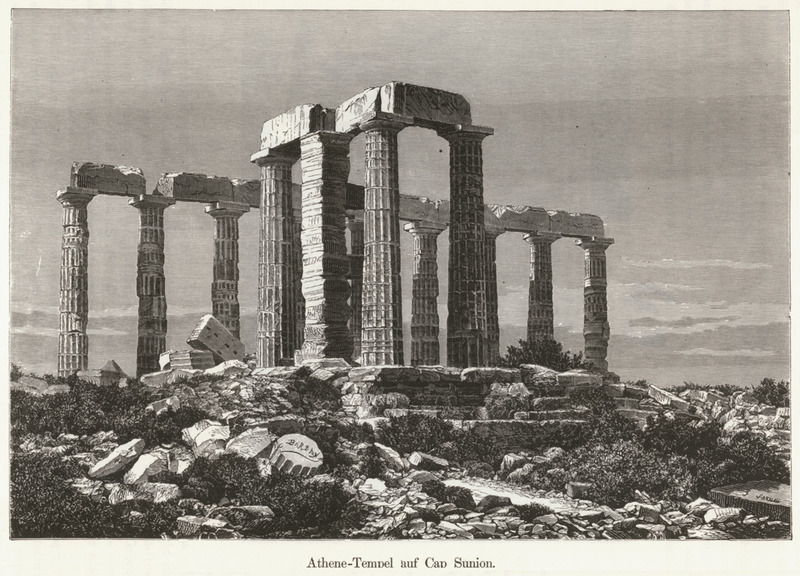 View of Sounion with the Temple of Poseidon. 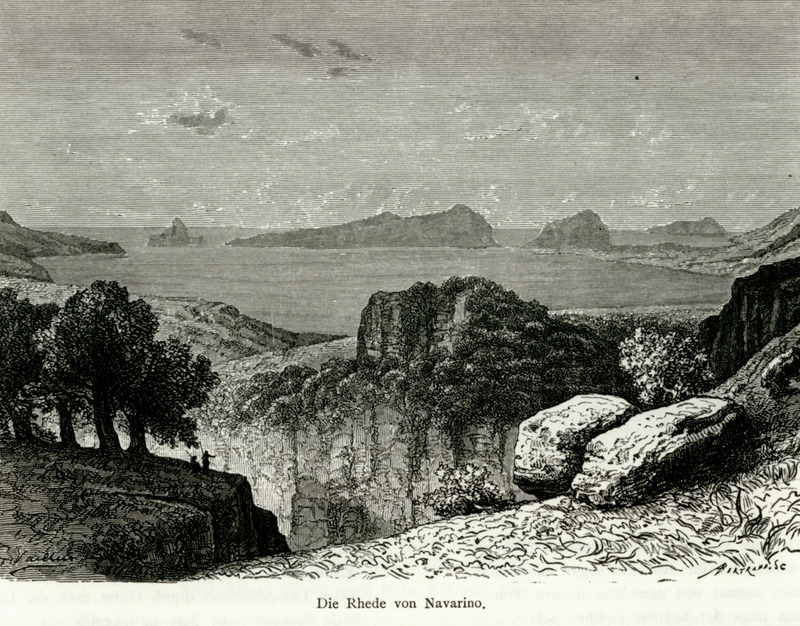 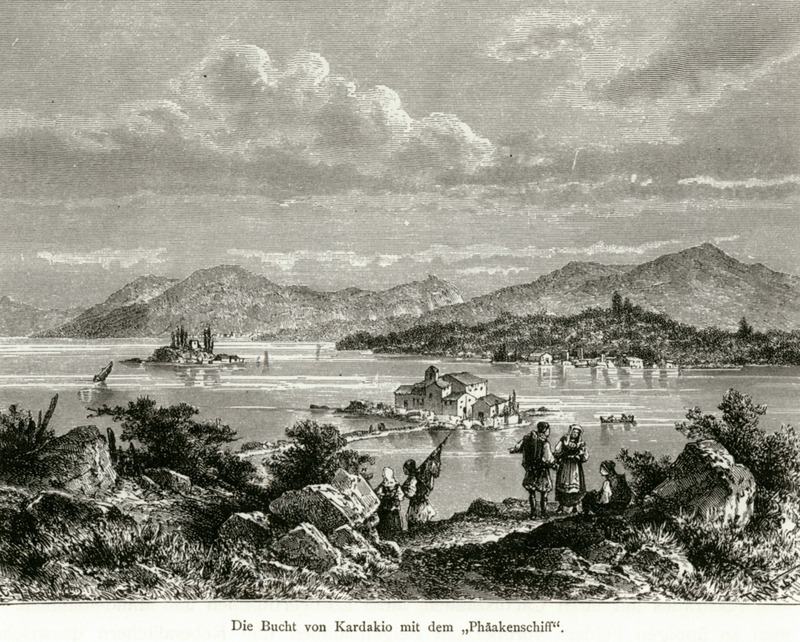 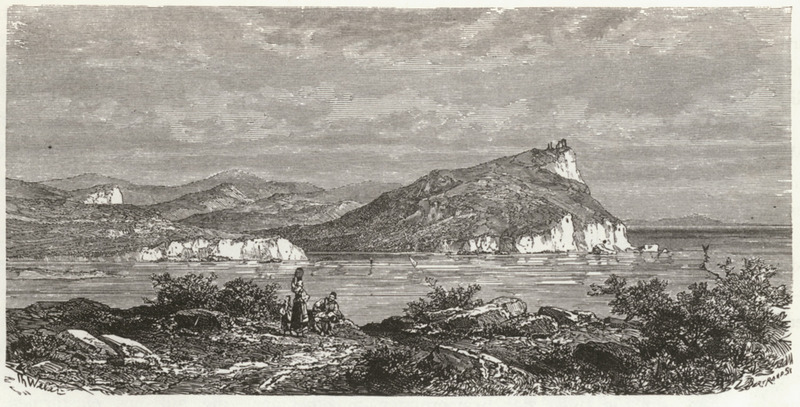 View of Panagia Vlacherna on Pontikonisi islet in Corfu, from the site of Kanoni. 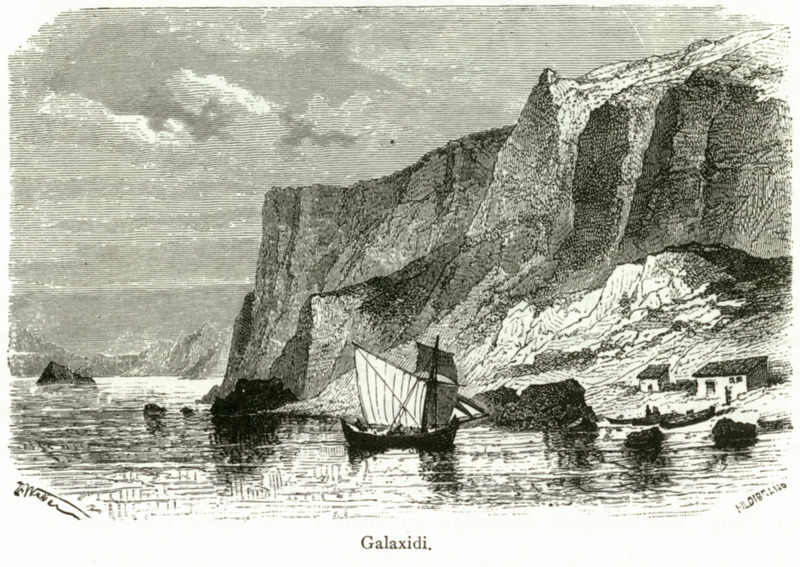 Cape Lefkada on Lefkada island. 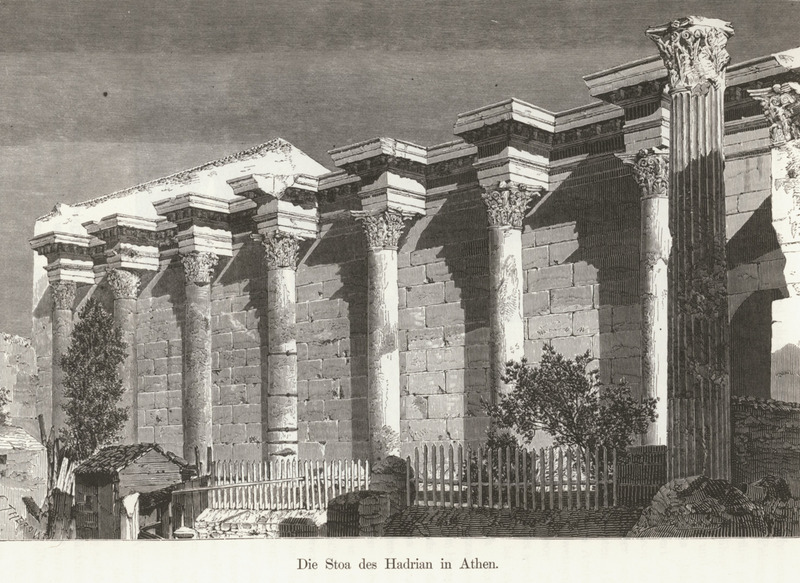 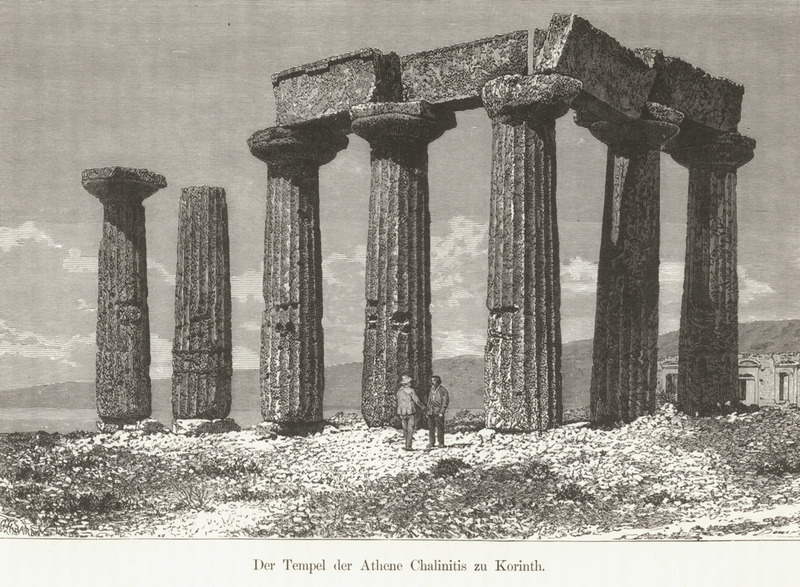 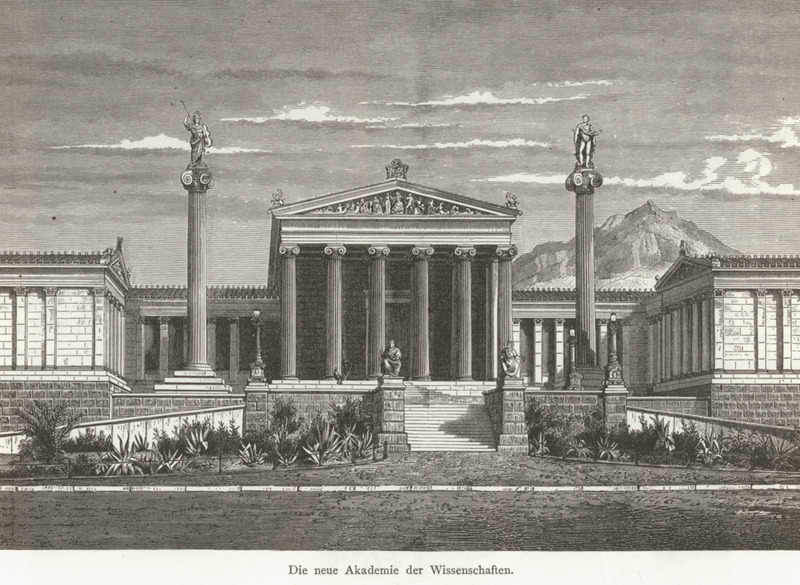 The temple of Aphaia on Aegina. 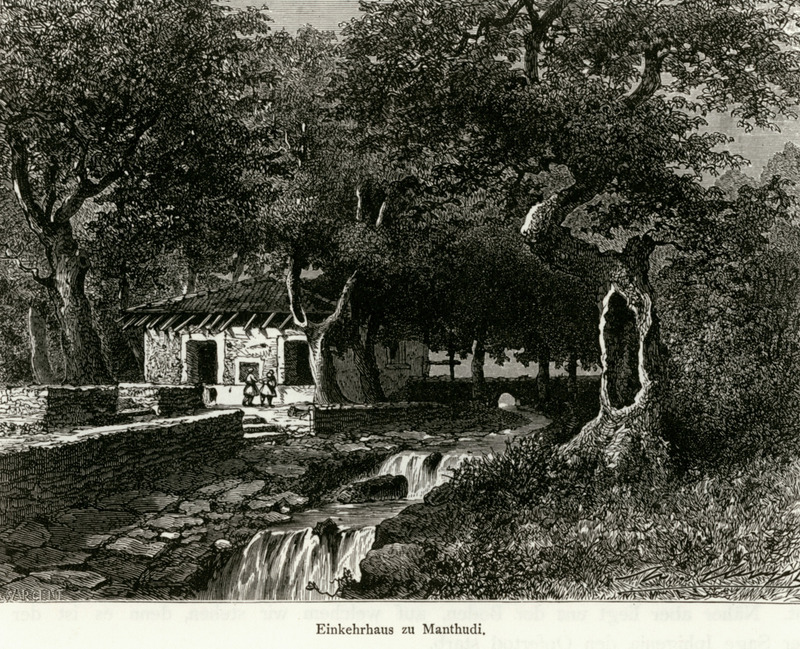 Plane trees in the village of Ahmet Aga (Prokopi) in Euboea. 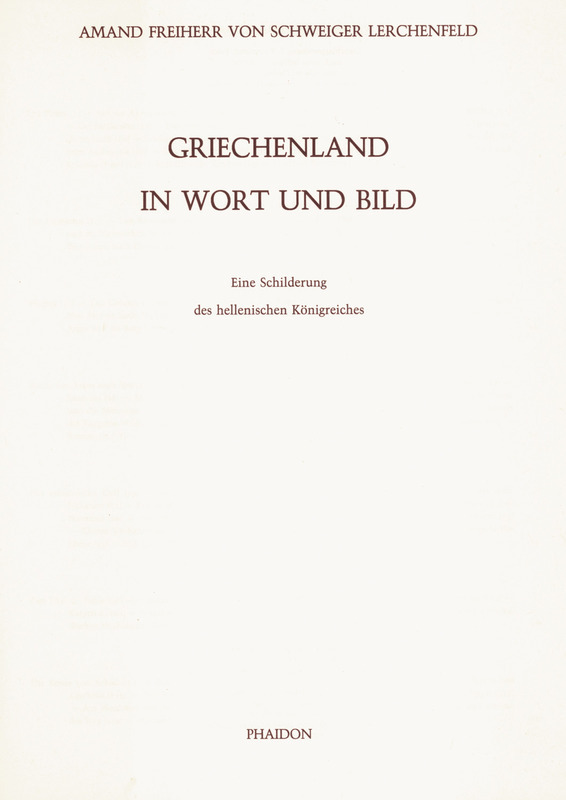 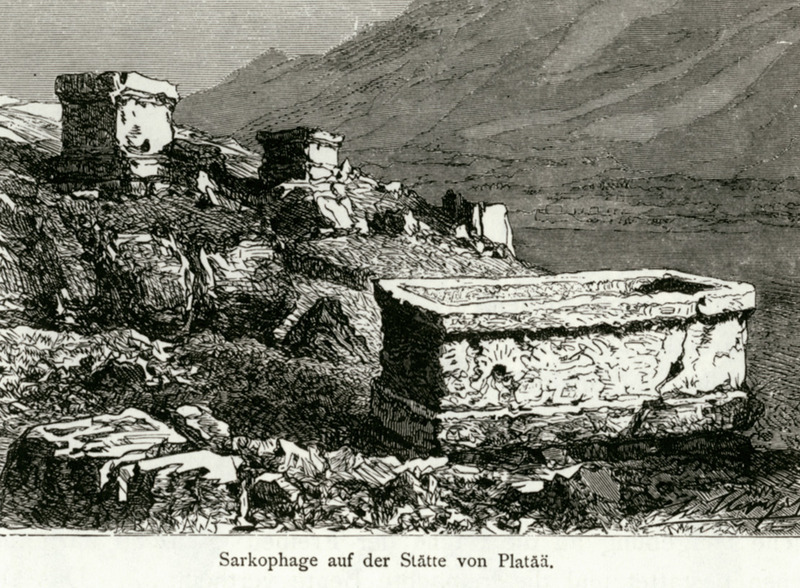 Inscriptions from the Castle of Skopelos. 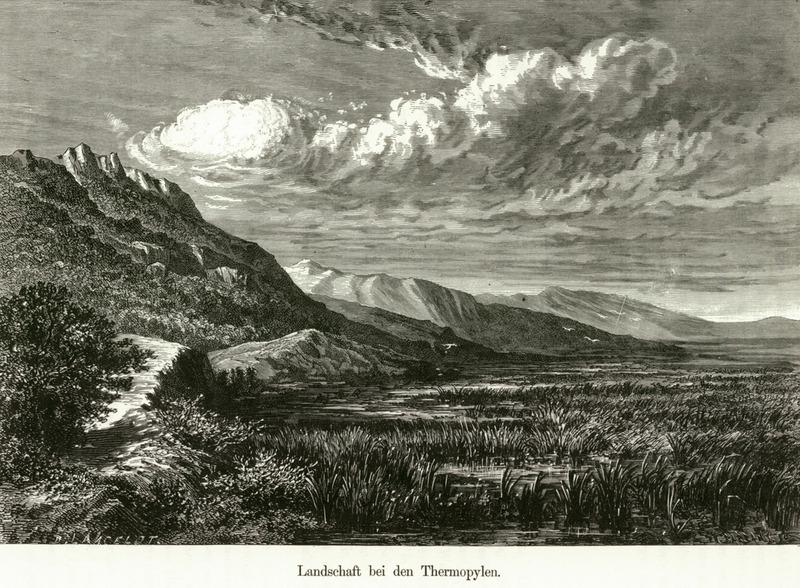 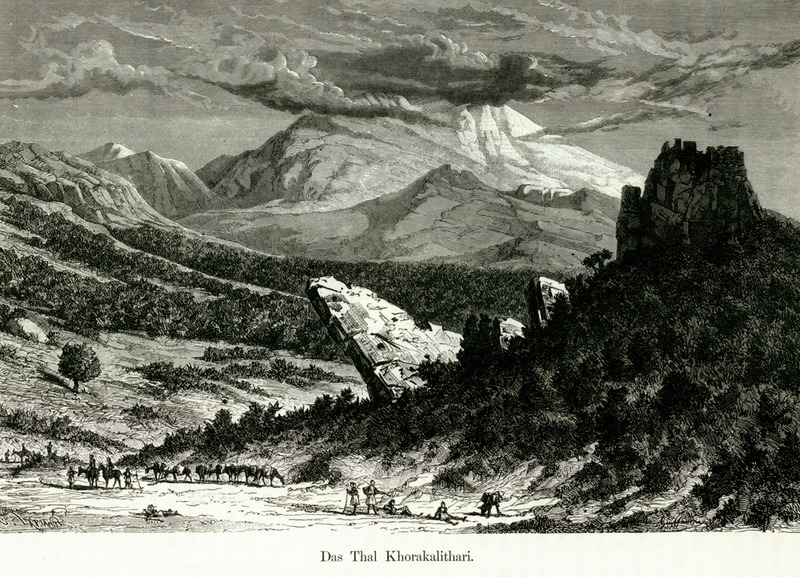 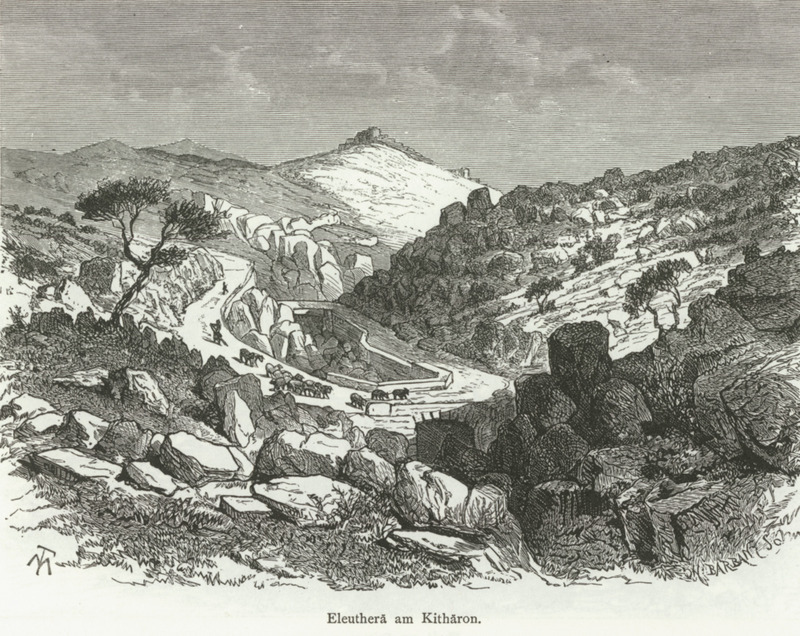 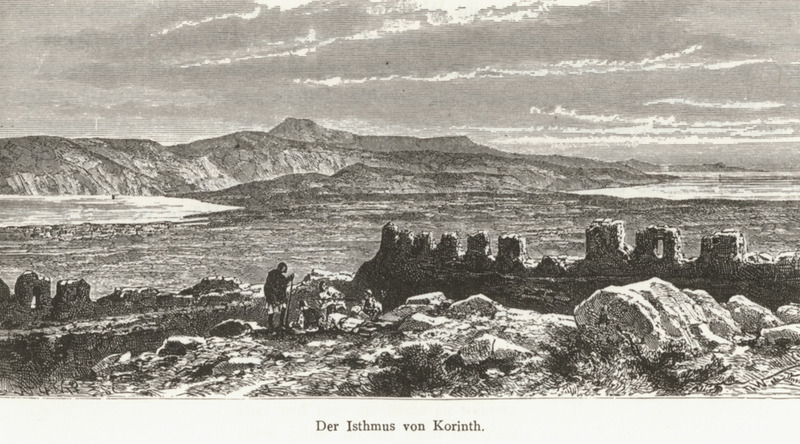 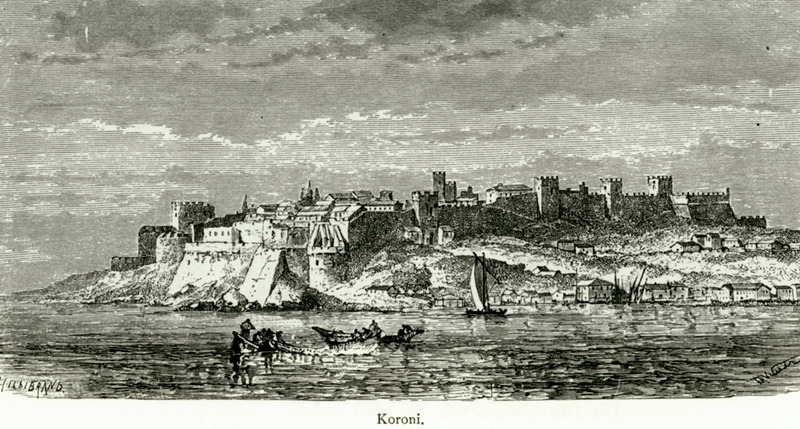 The valley of Koraka Lithari. 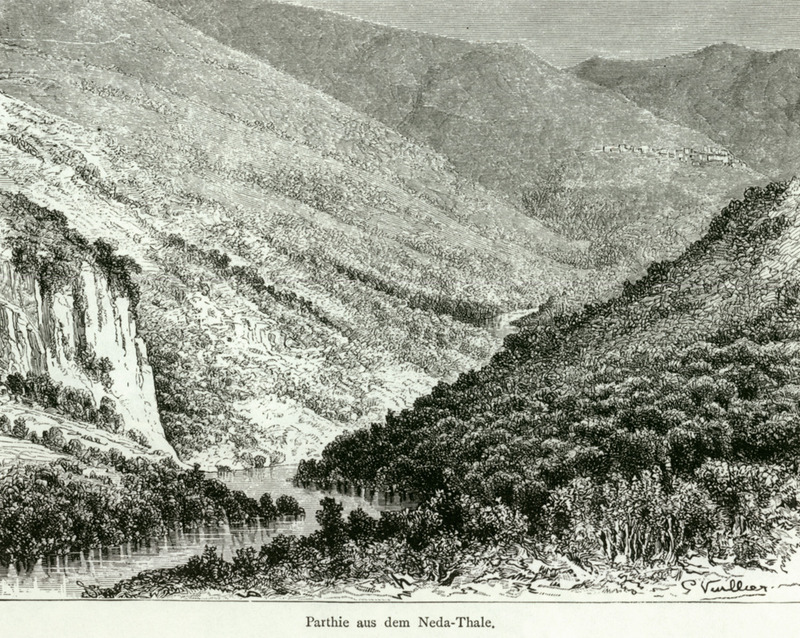 The waterfalls of Herkyna near Livadeia. 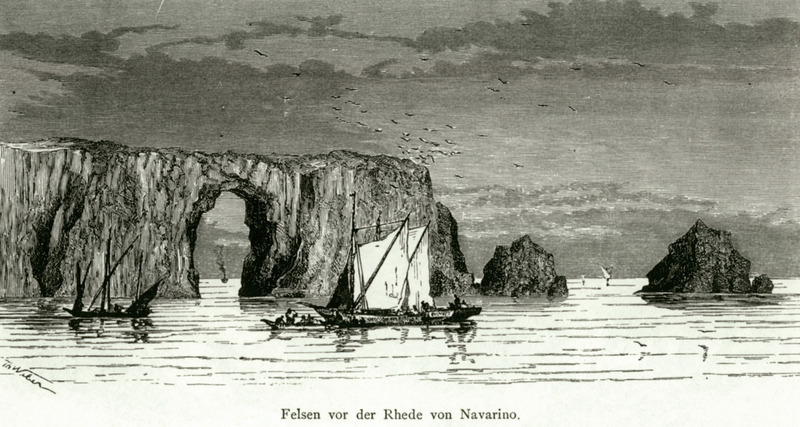 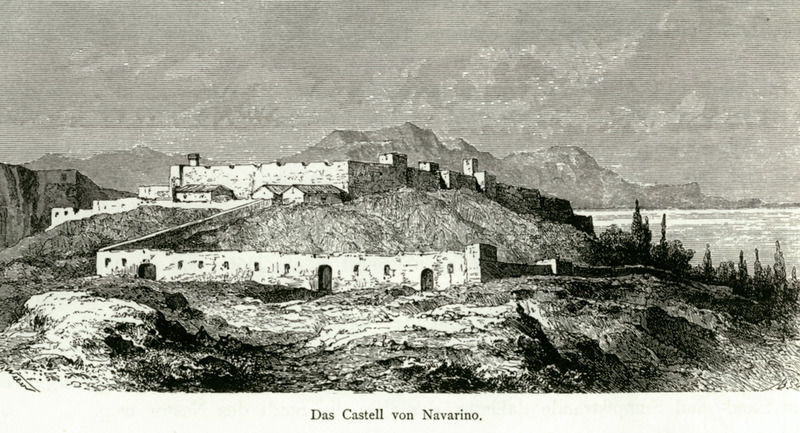 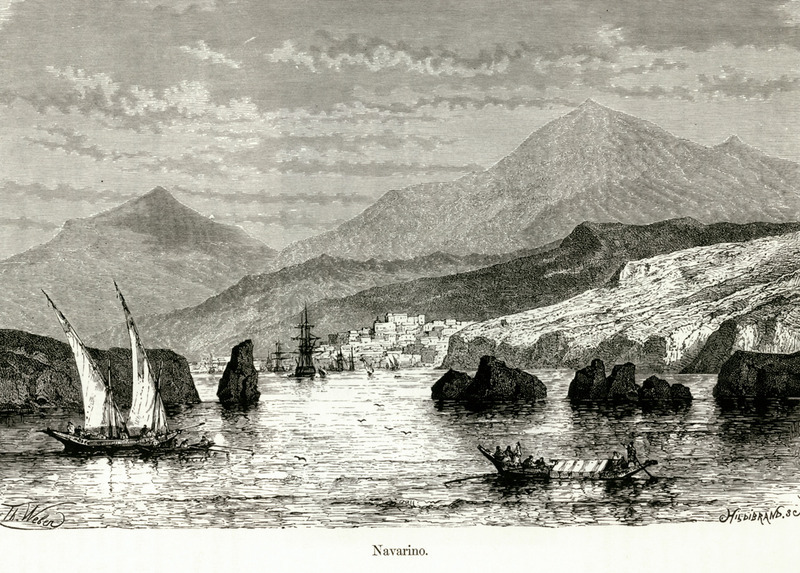 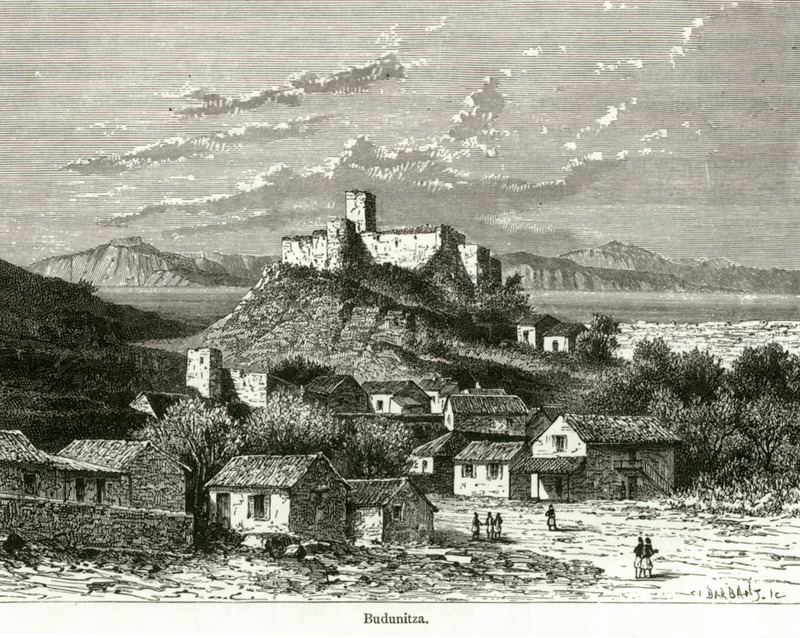 The castle of Livadeia in the background. 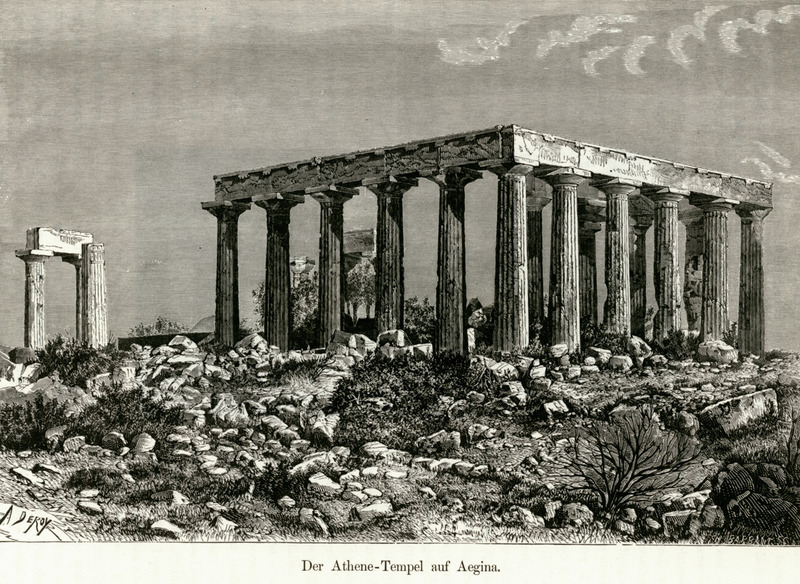 Relies from the Temple of Apollo Epicurius in Bassae (Phigaleia). 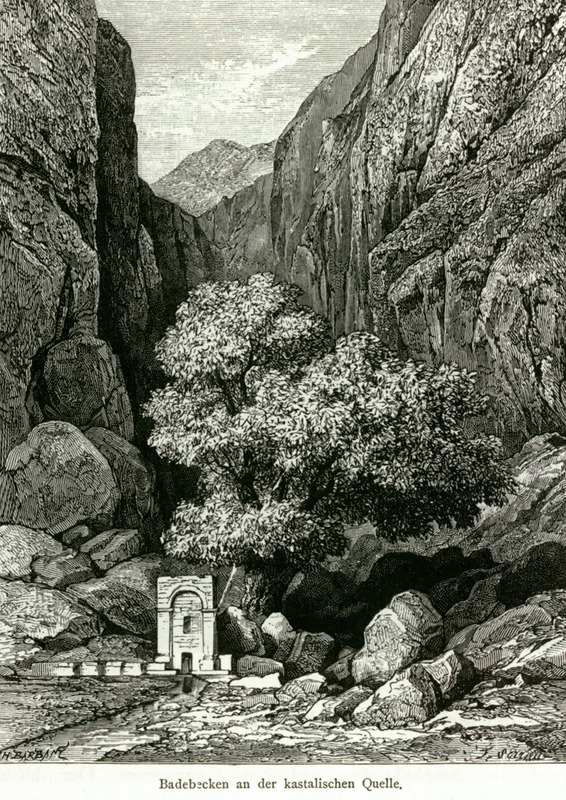 Remains of temple in Mavromati. 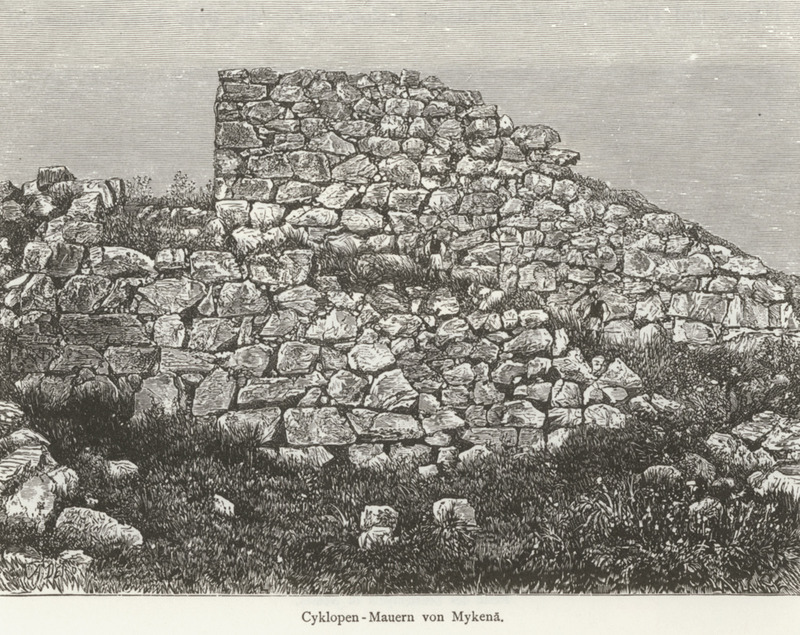 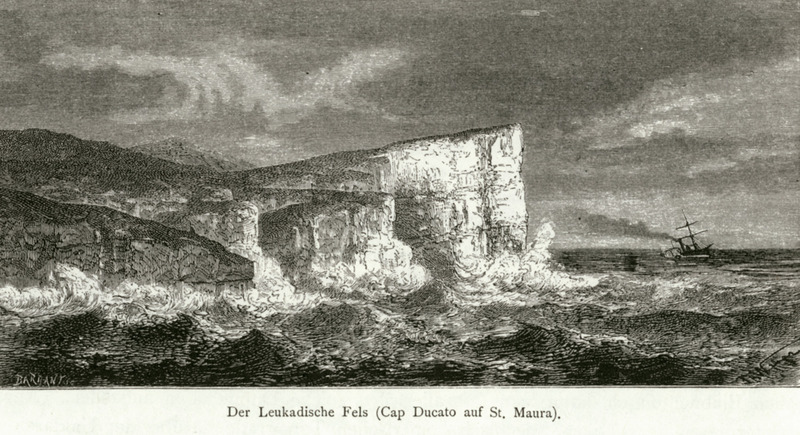 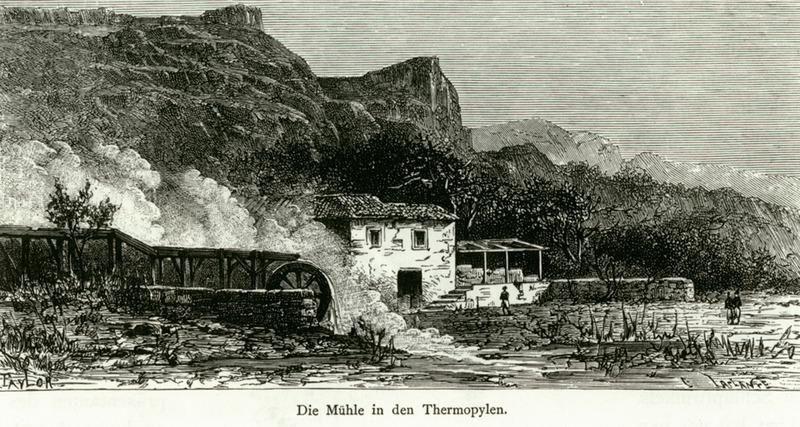 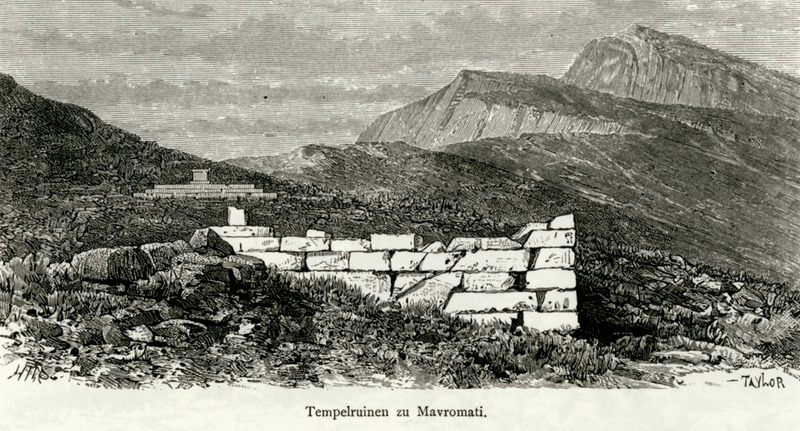 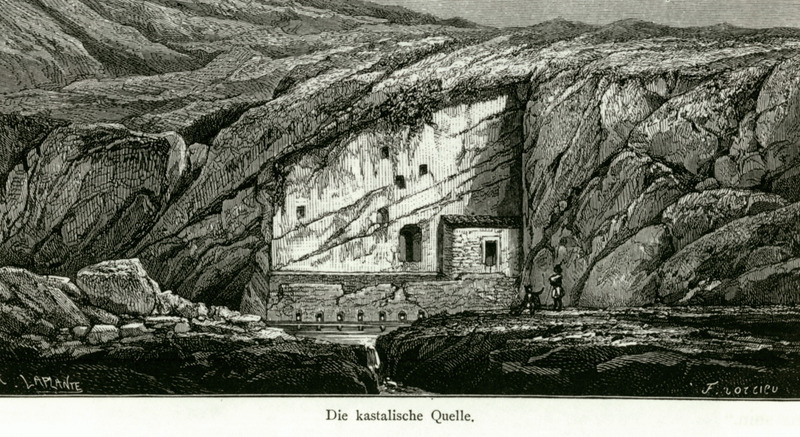 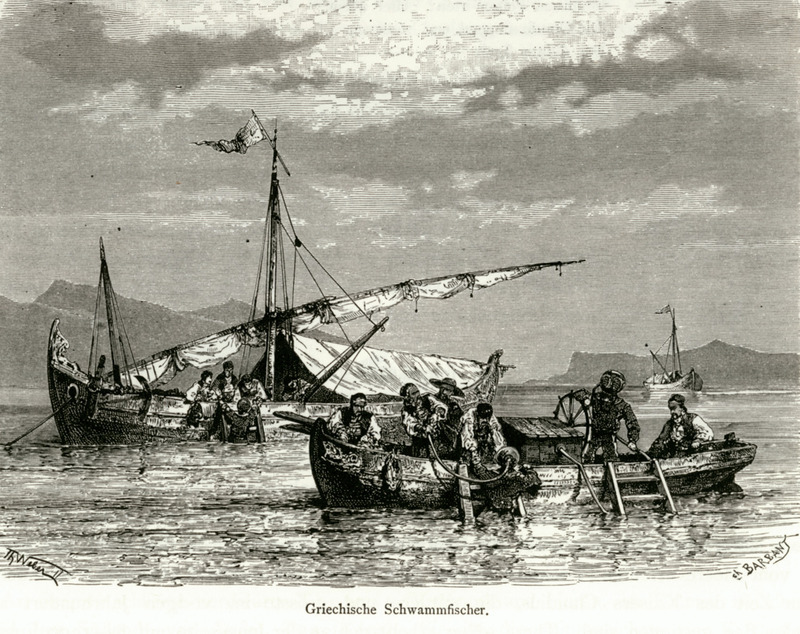 Old guardhoiuse in the Messenian gulf. 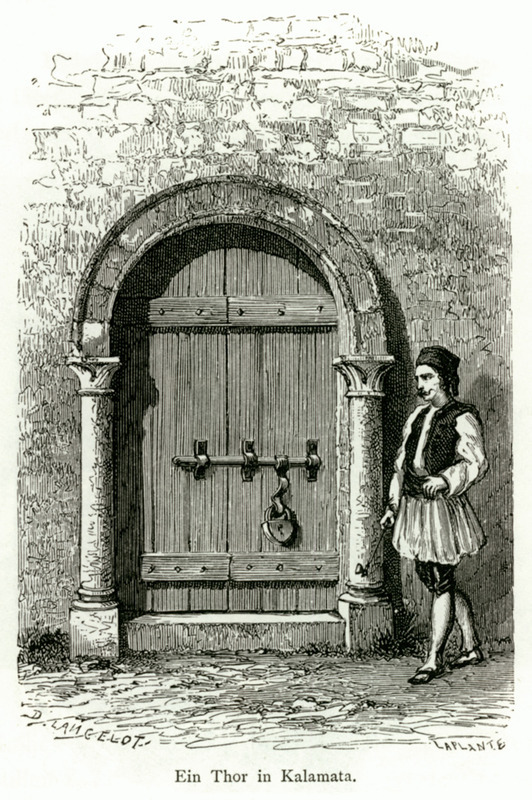 Entrance of house in Kalamata. 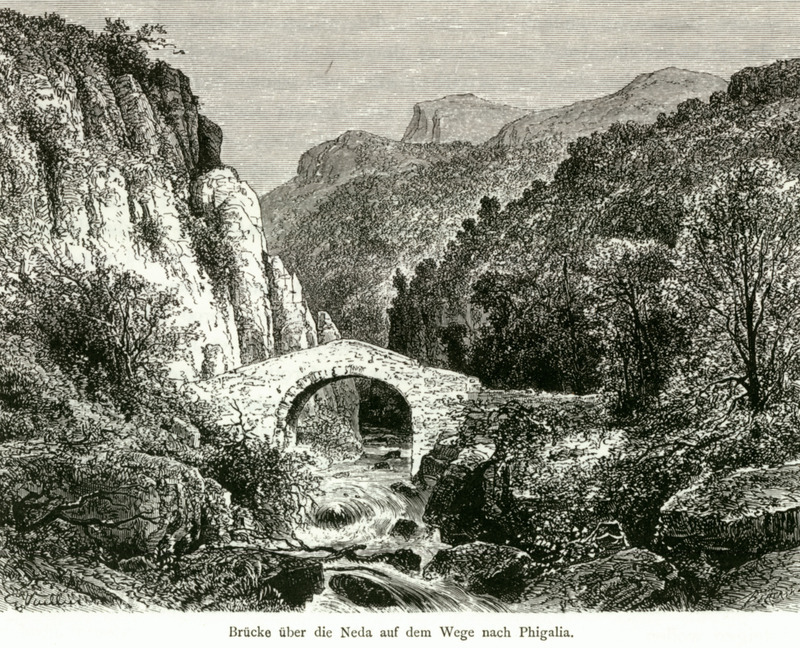 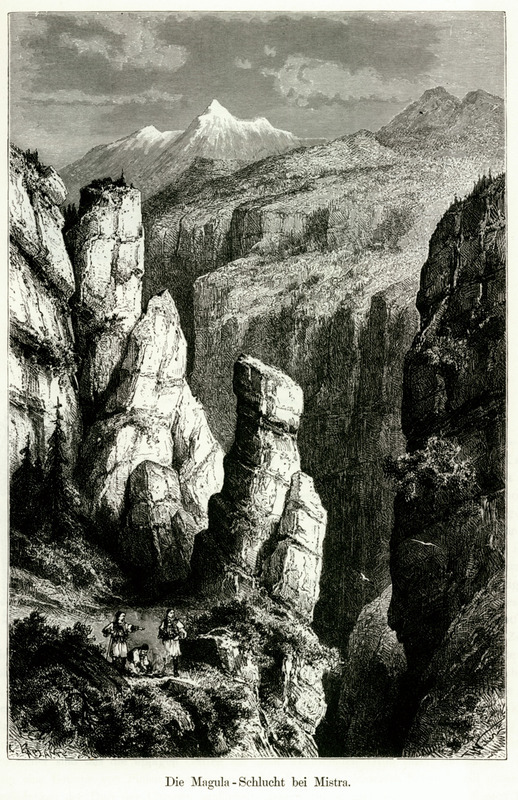 The gorge of Magoula in Mystras. 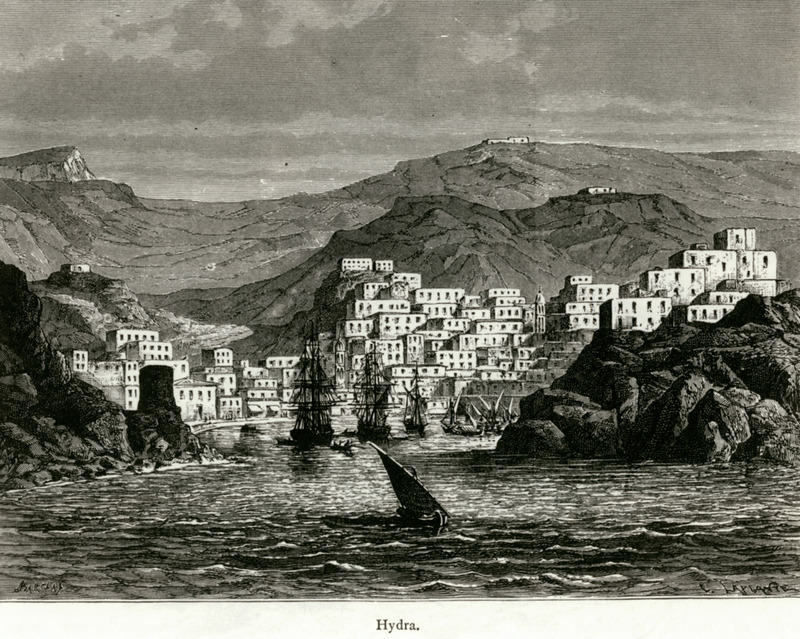 The village of Karadamyli in Mani. 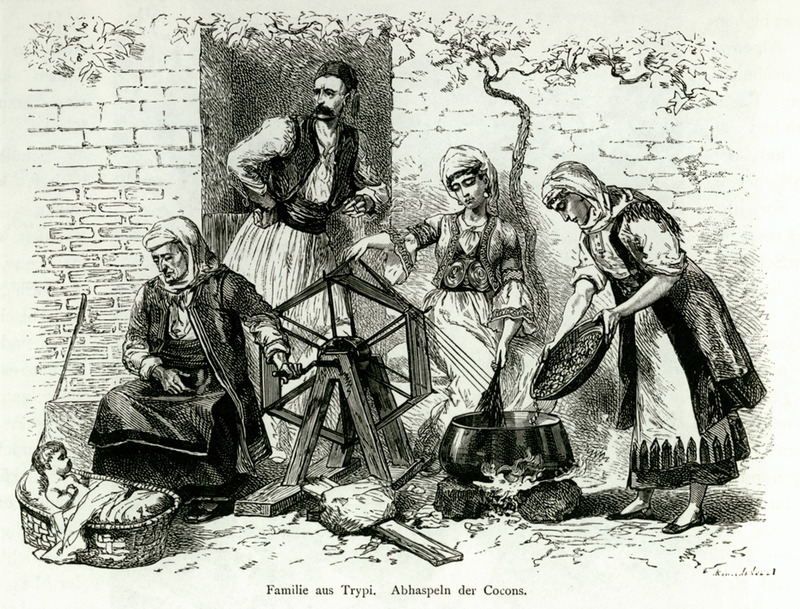 Family from Trypi. 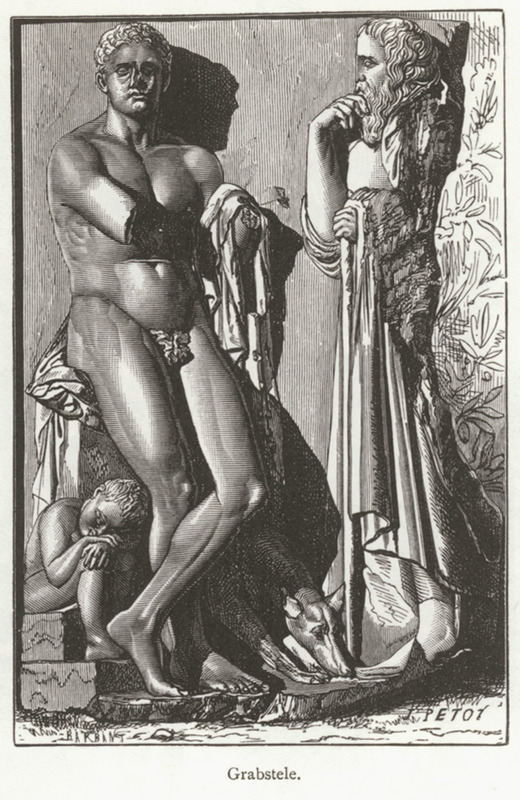 Silk reeling. 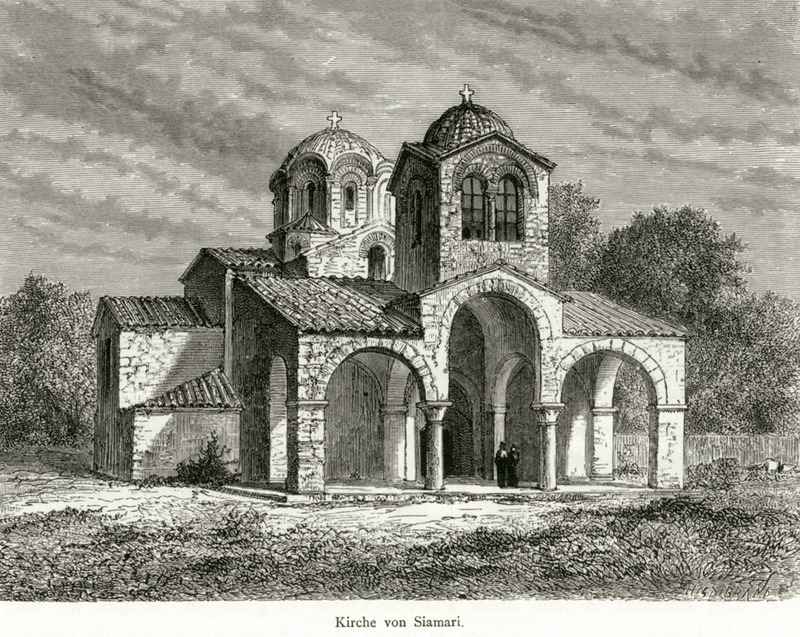 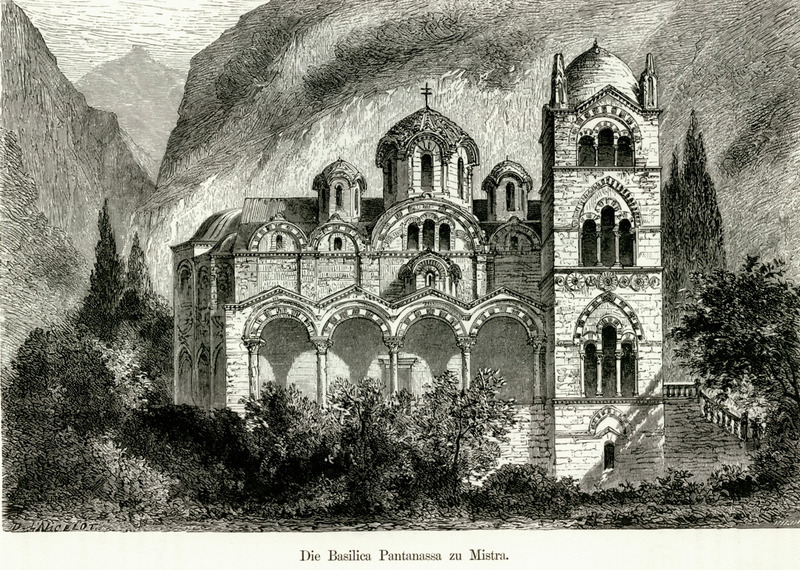 The church of Pantanassa in Mystras. 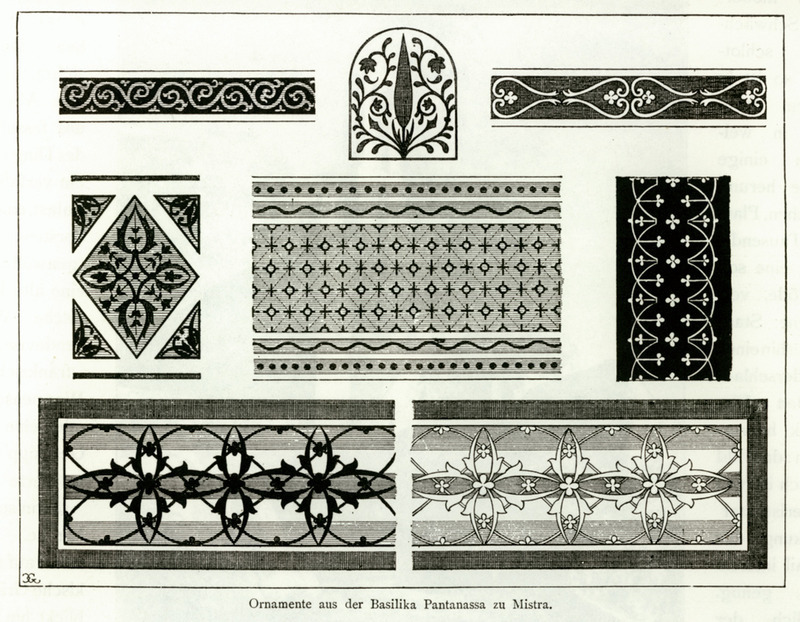 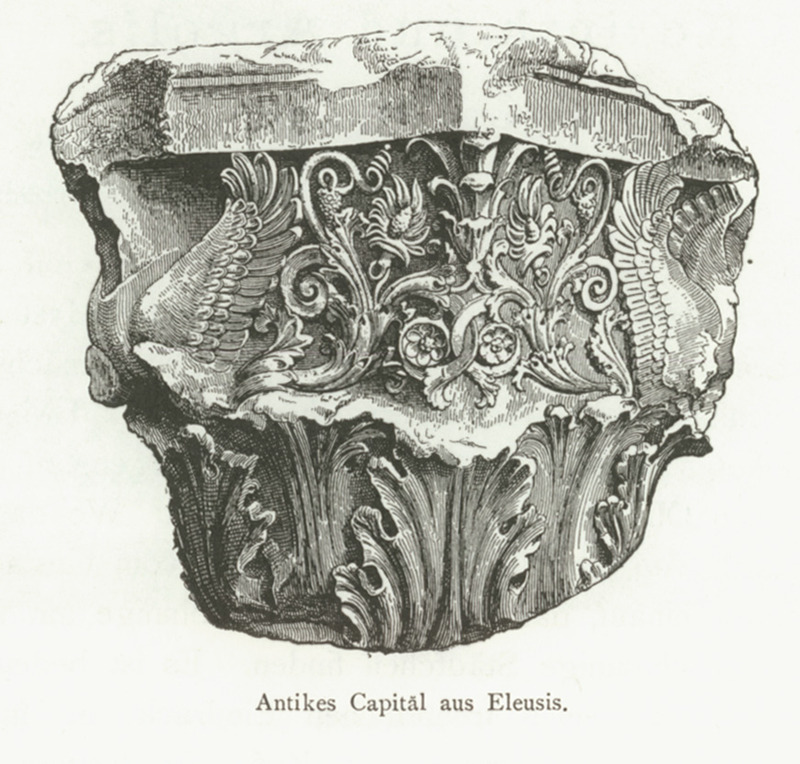 Decorative elements from the katholikon of the church of Pantanassa in Mystras. 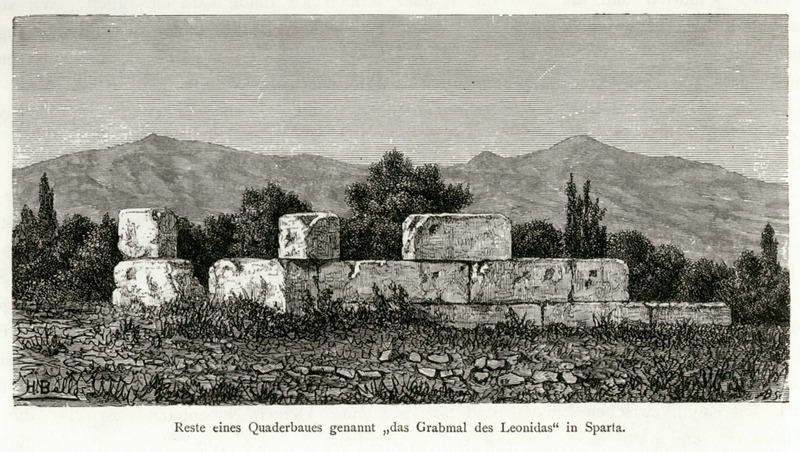 Remains of the monument calld “Tomb of Leonidas” in Sparta. 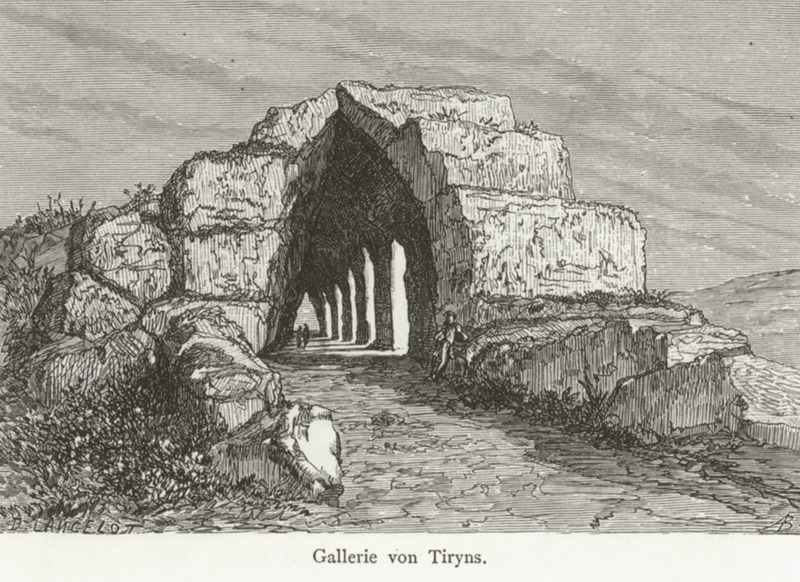 Masonry tunnel in the palace of Tiryns. 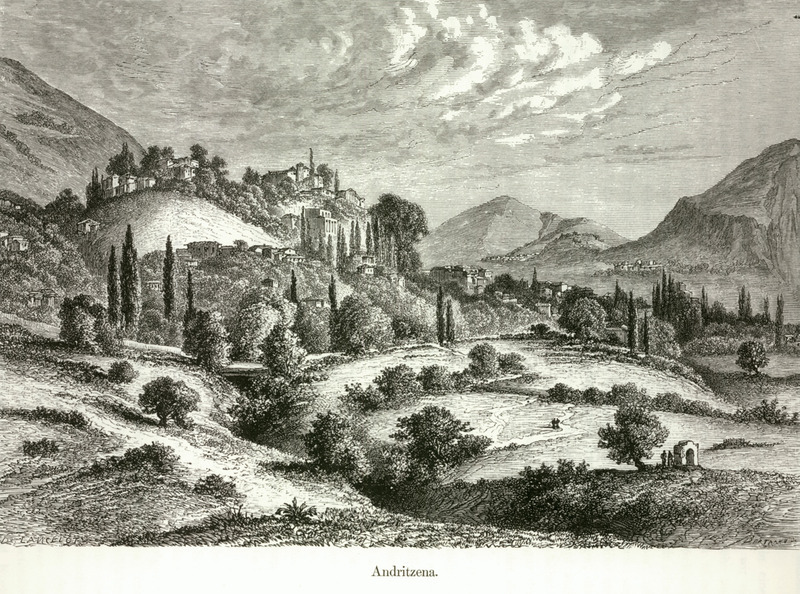 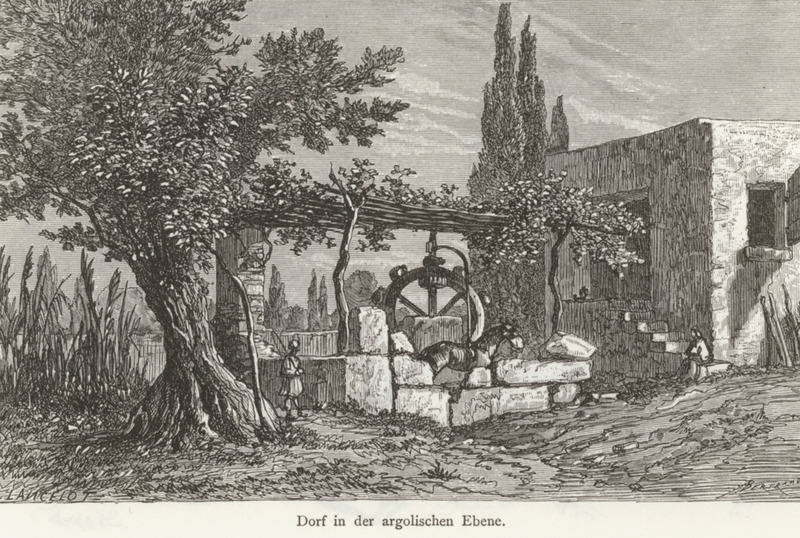 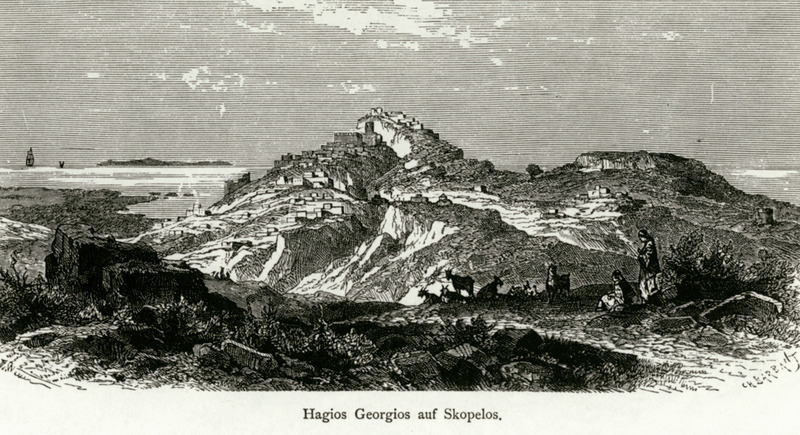 Village in the plain of Argolis. 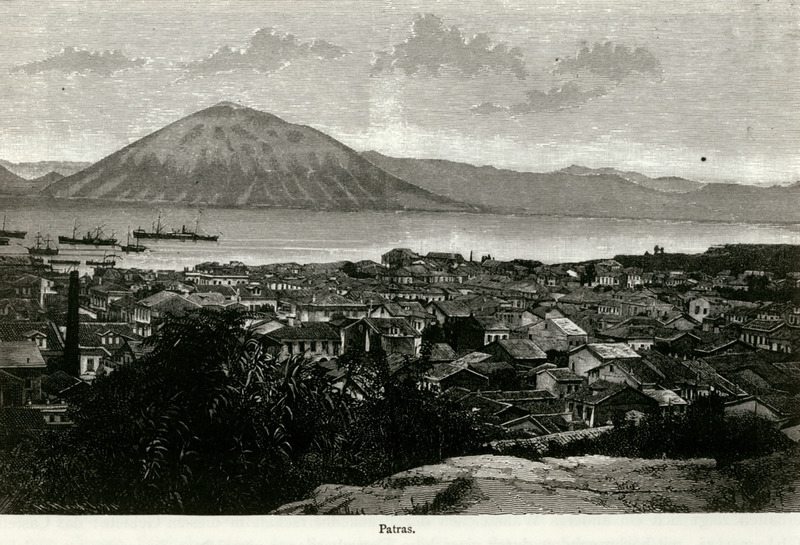 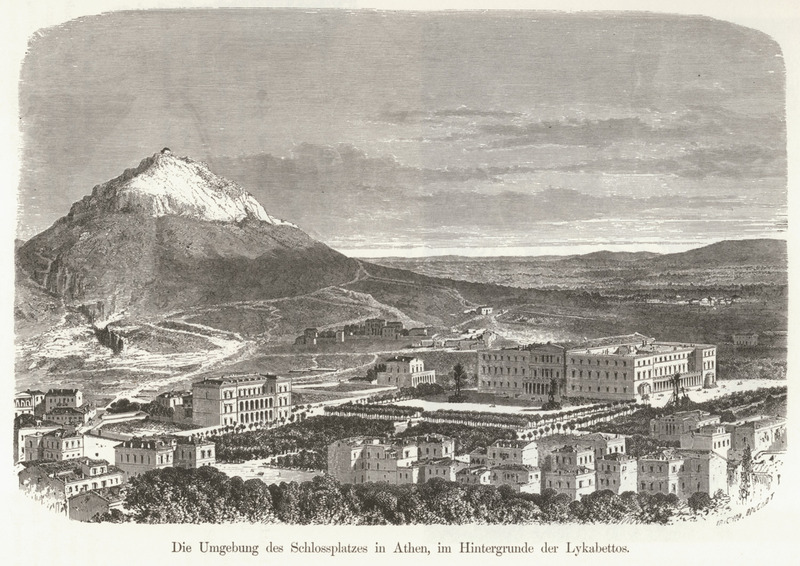 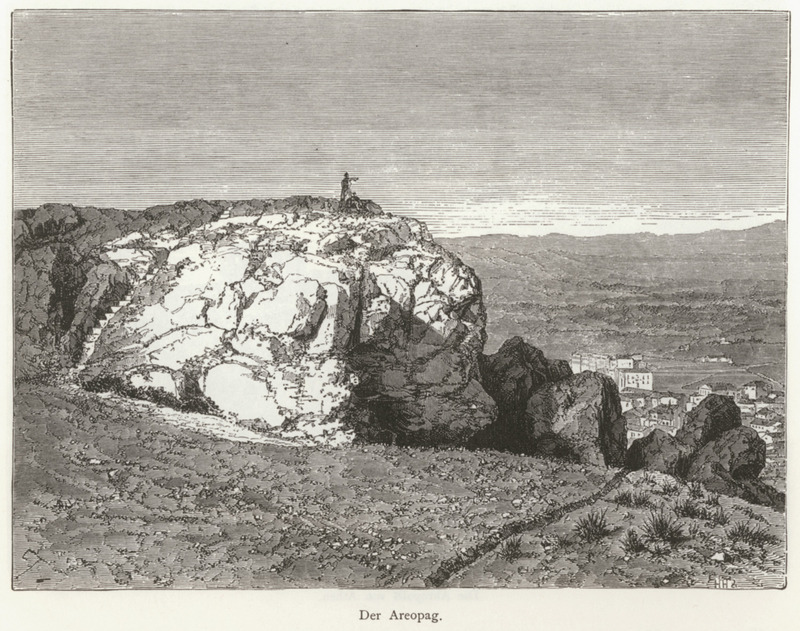 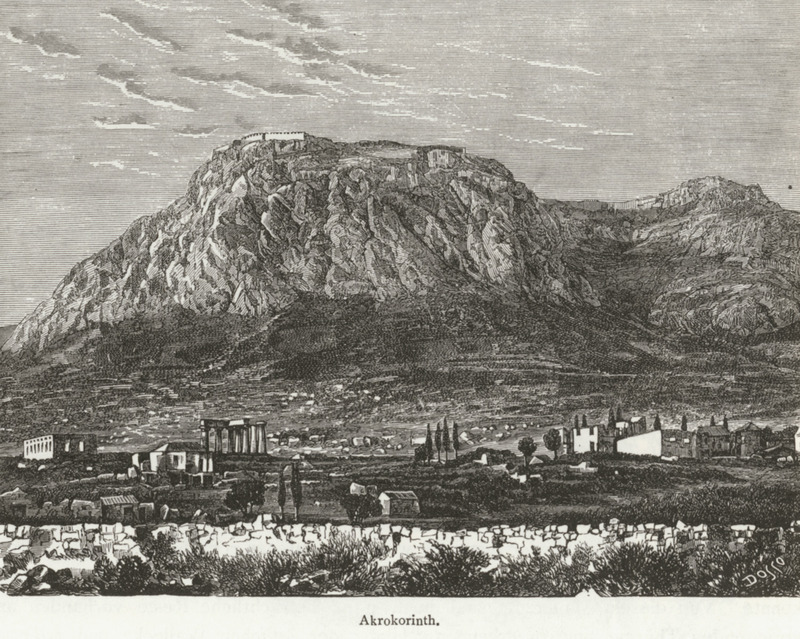 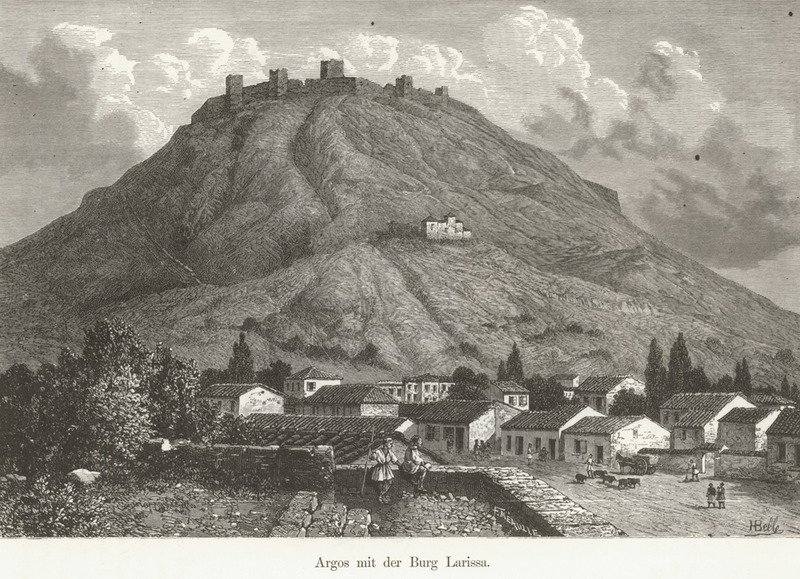 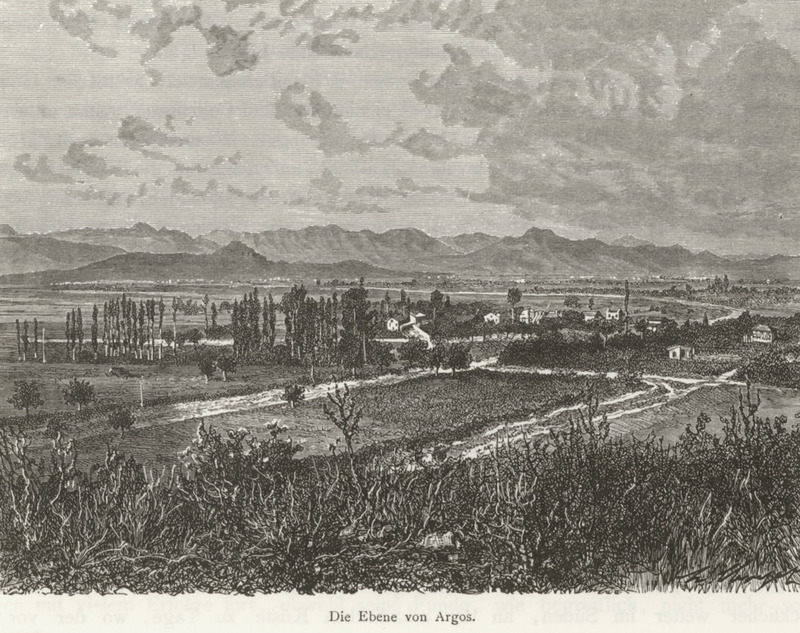 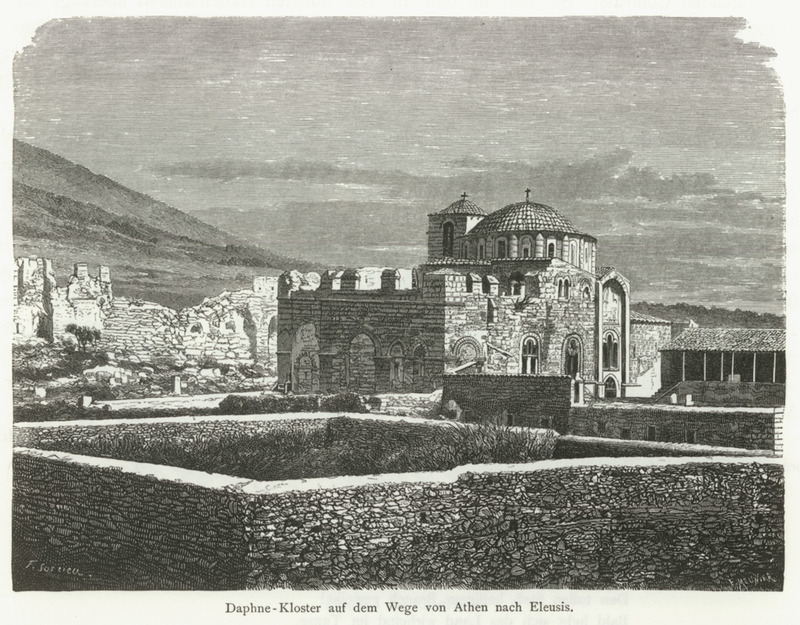 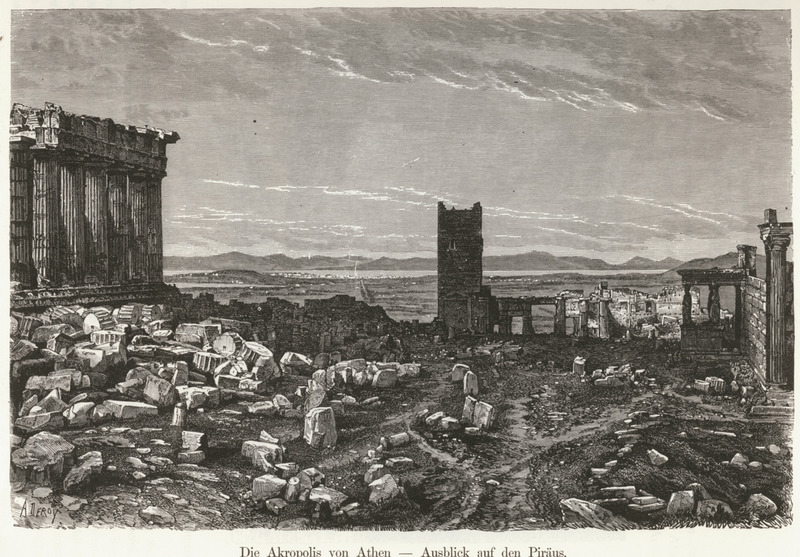 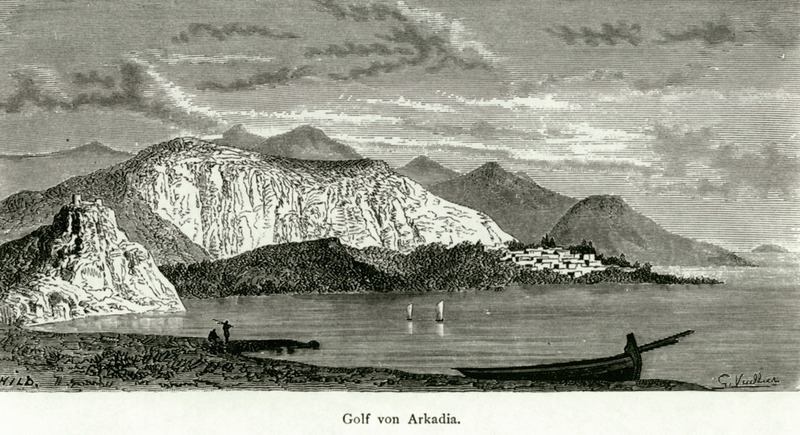 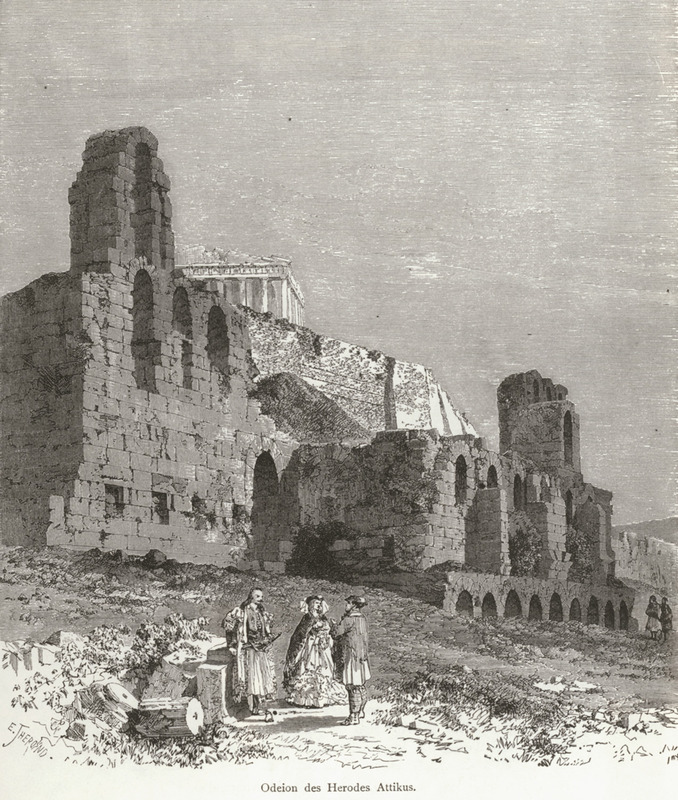 Argos and the acropolis of Larissa. 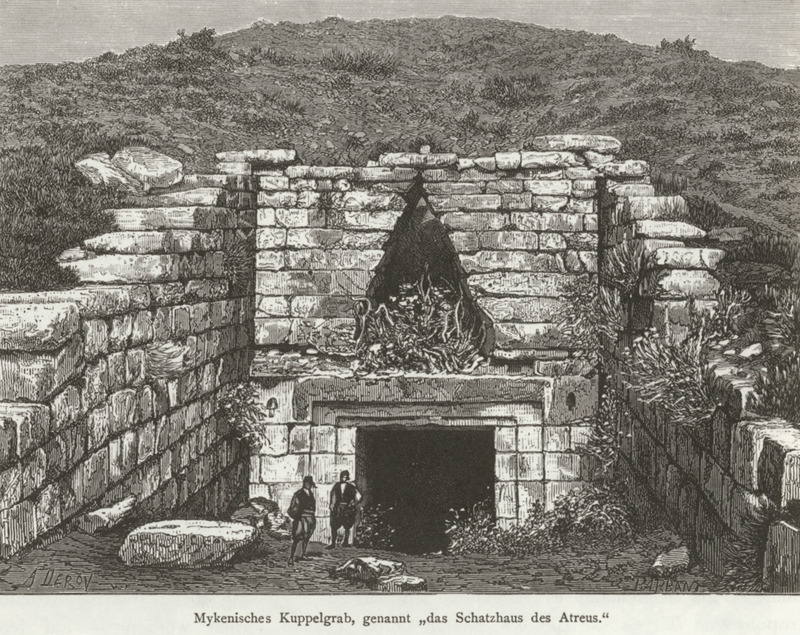 The tholos tomb known as Treasury of Atreus in Mycenae. 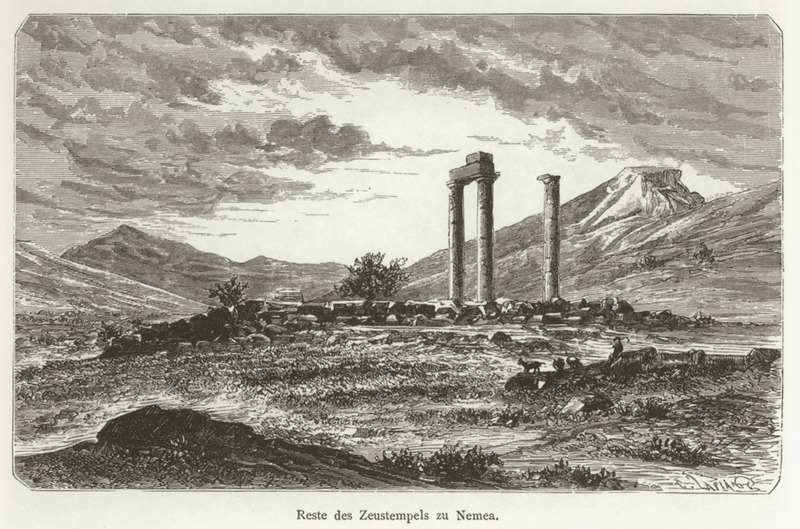 Remains of the Temple of Zeus in Nemea. 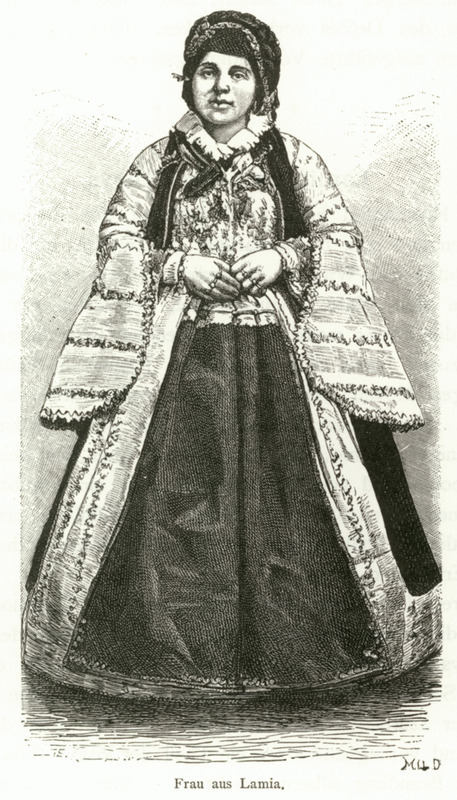 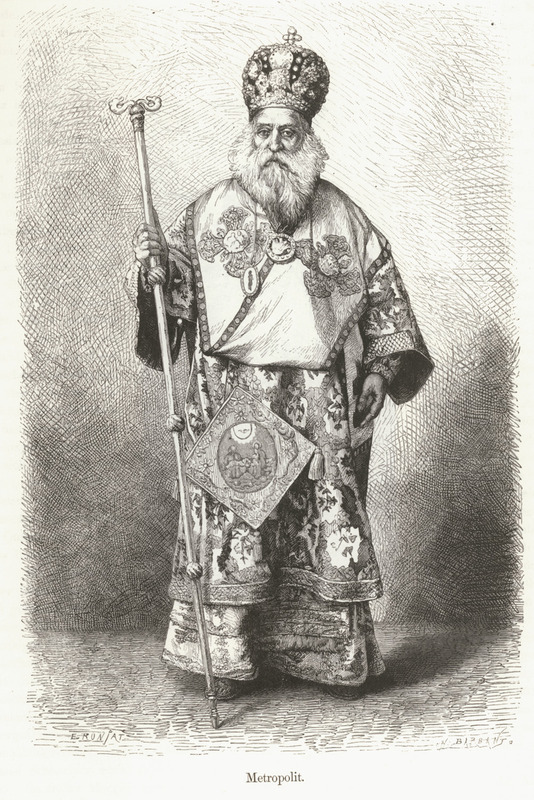 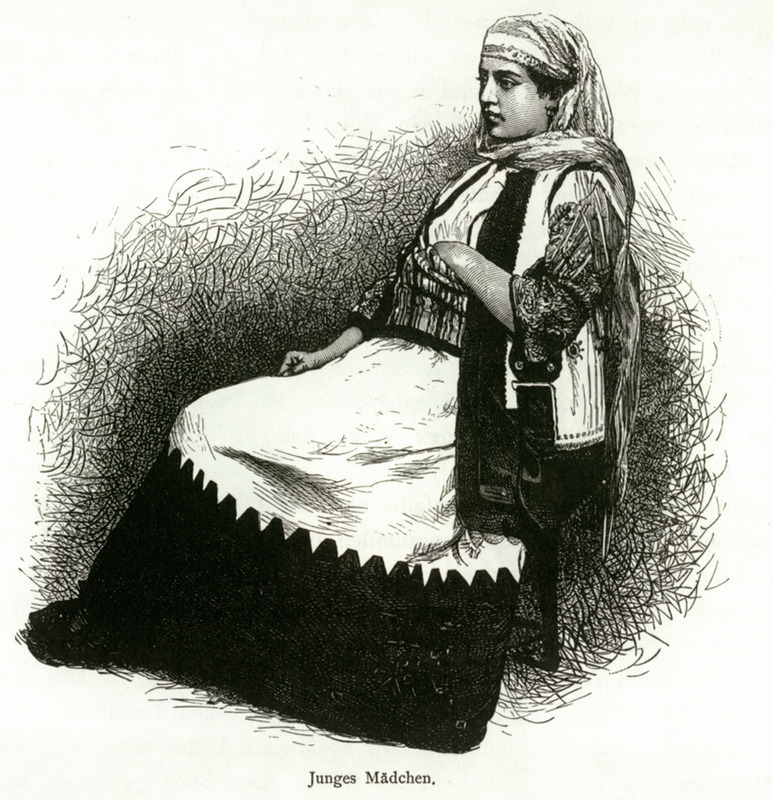 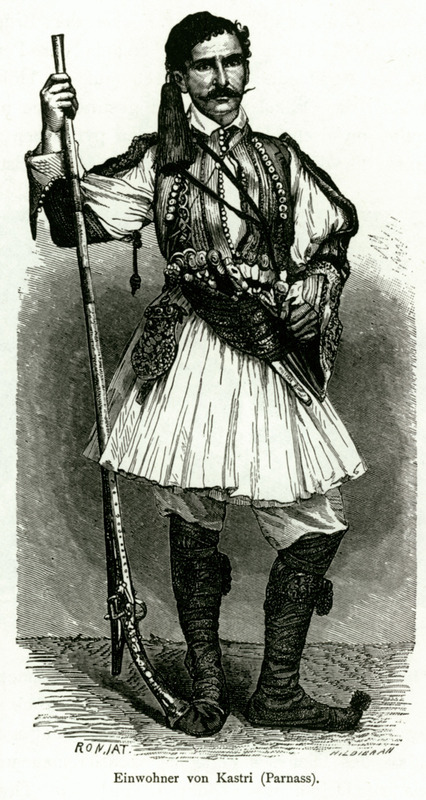 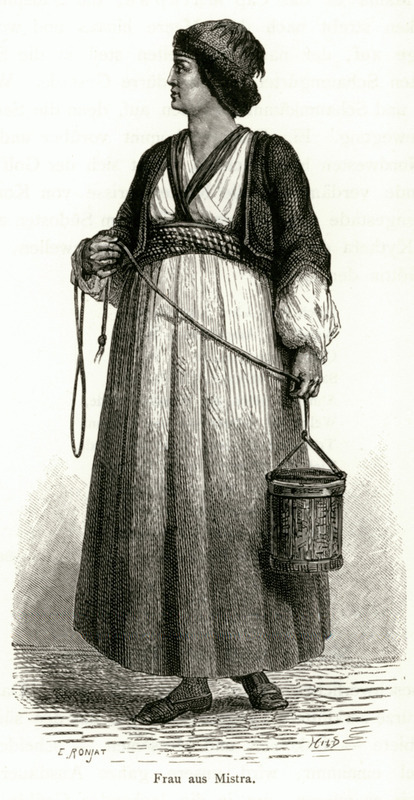 Traditional costume of the village of Agios Vasileios. 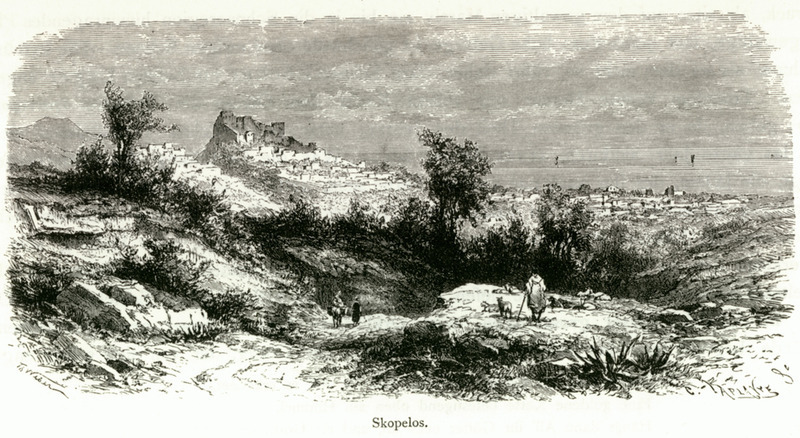 The site of ancient Sicyon. 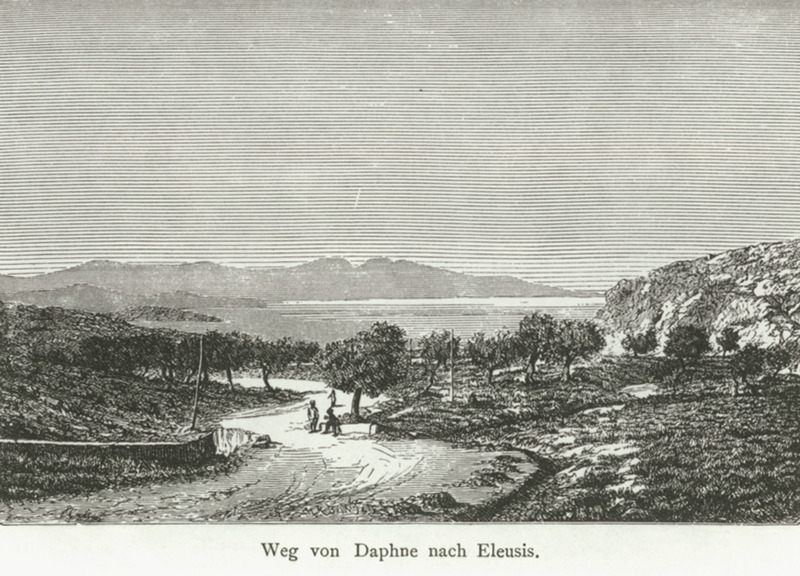 The route from Daphni to Eleusis. 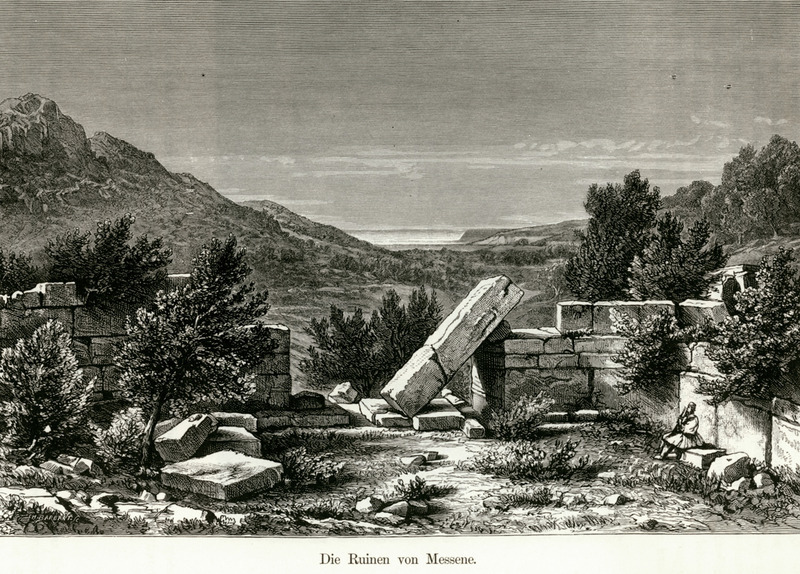 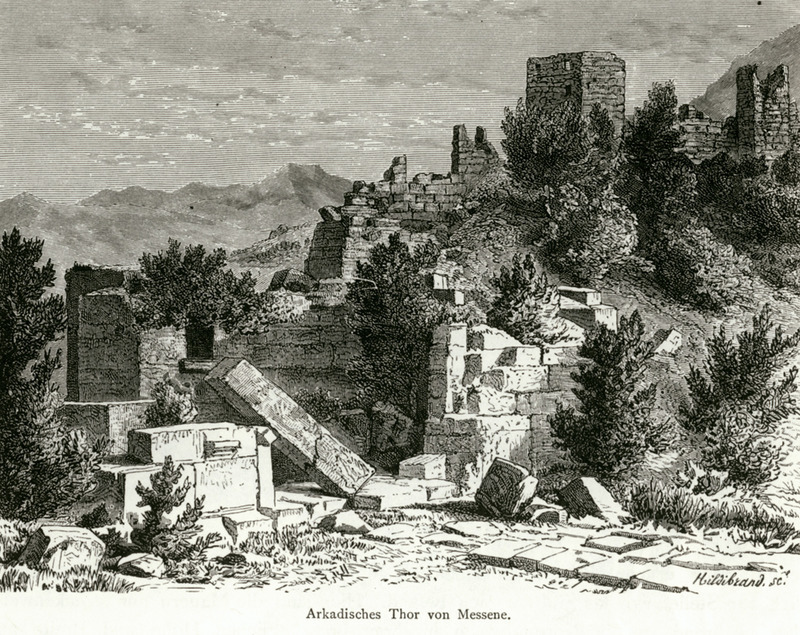 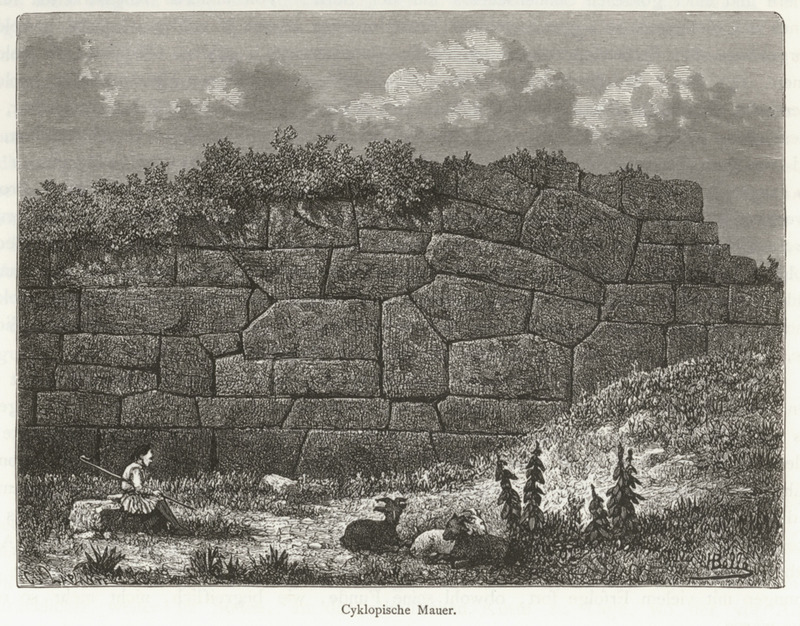 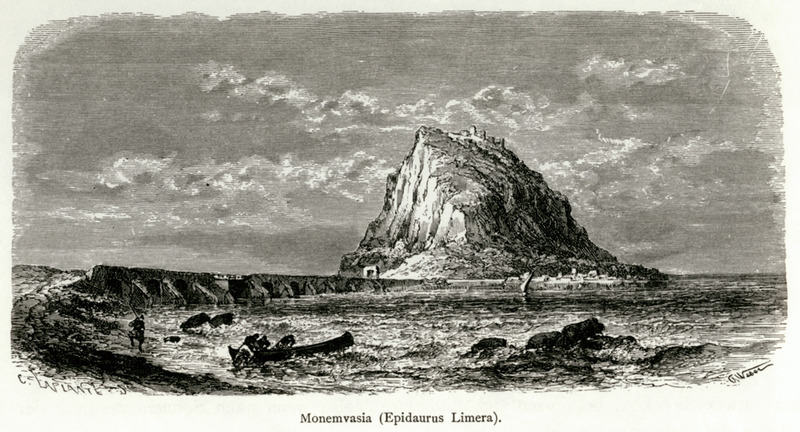 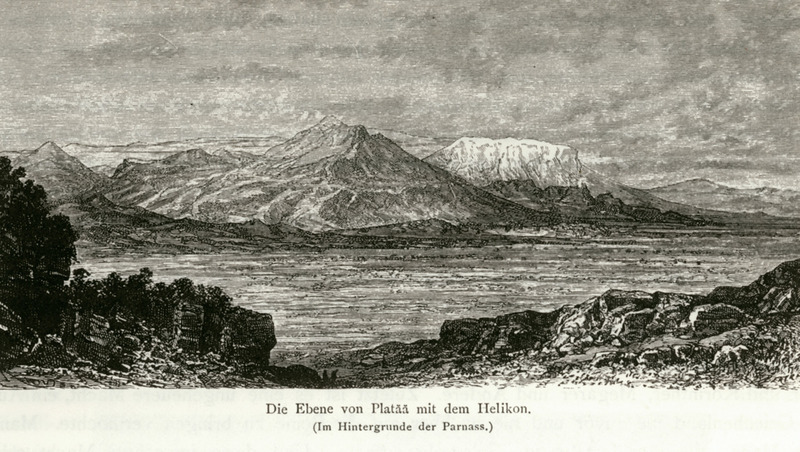 Remains of the ancient city of Eleutherae on Mount Cithaeron. 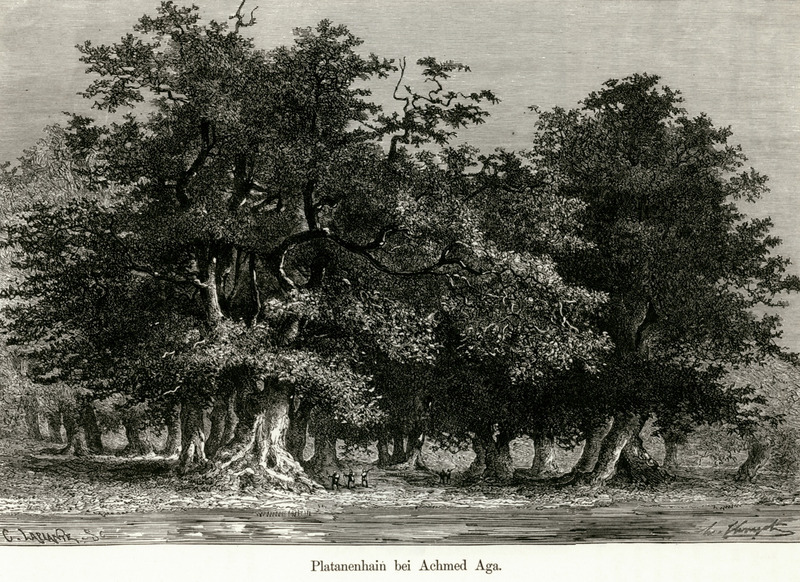 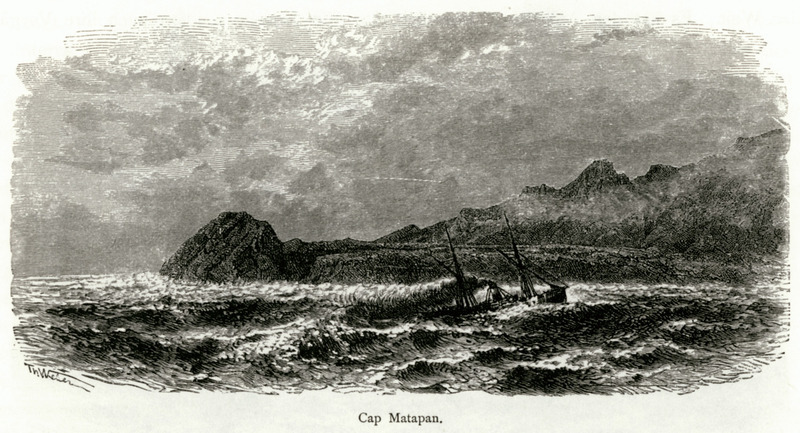 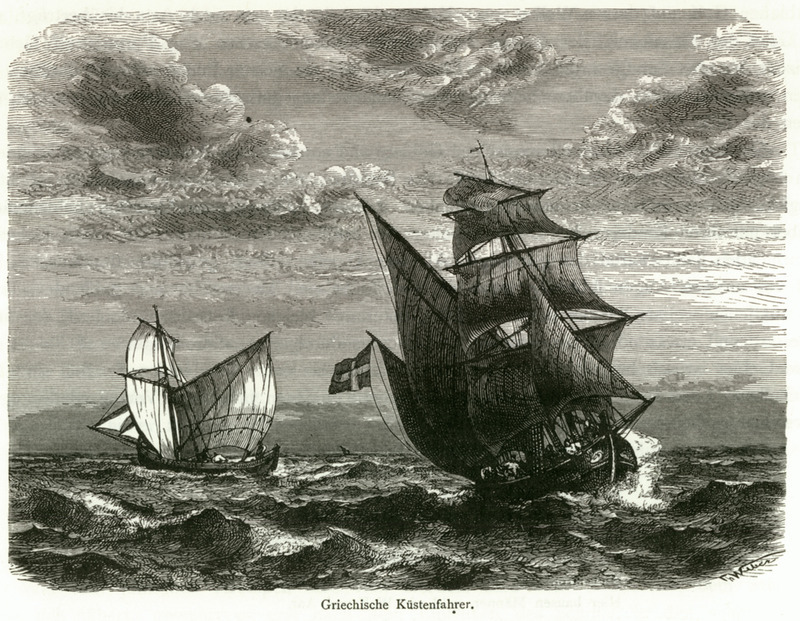 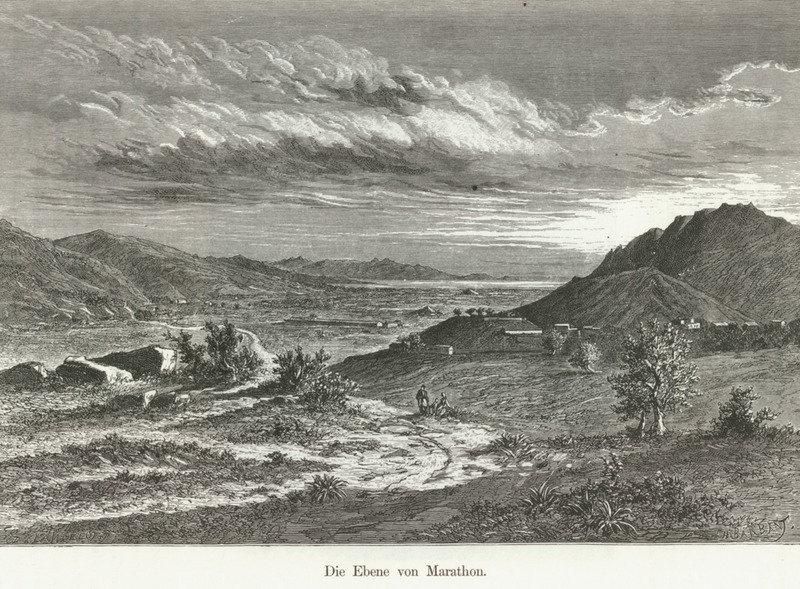 The battlefield of Marathon plain. 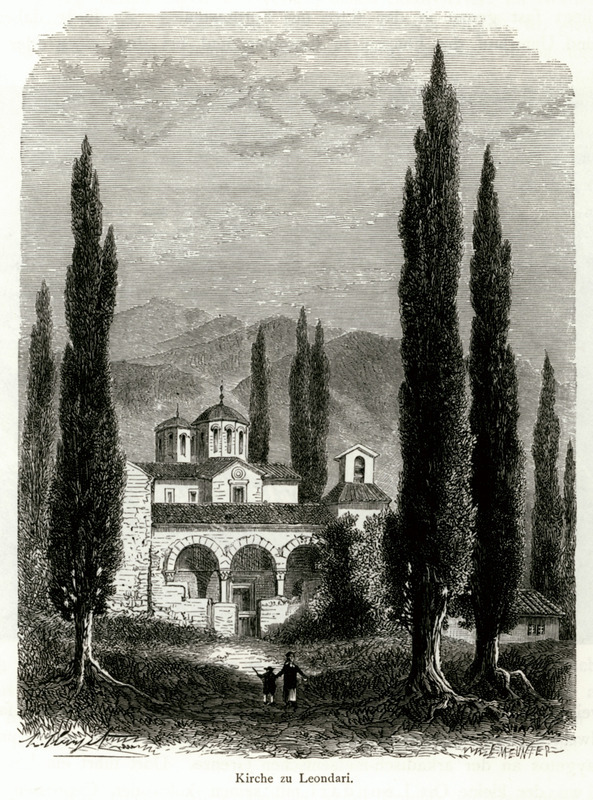 The monastery of Hagioi Asomatoi. 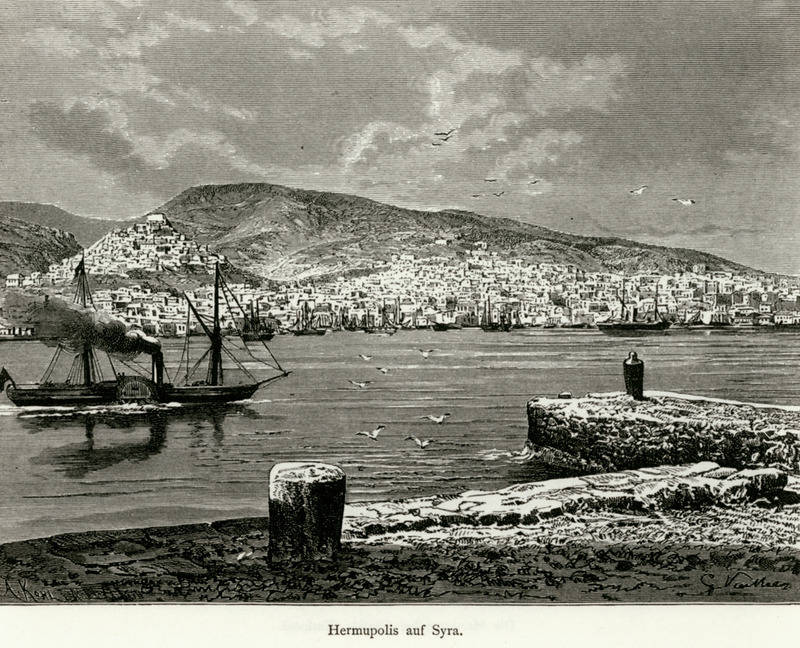 Syntagma square and its surrounding area. 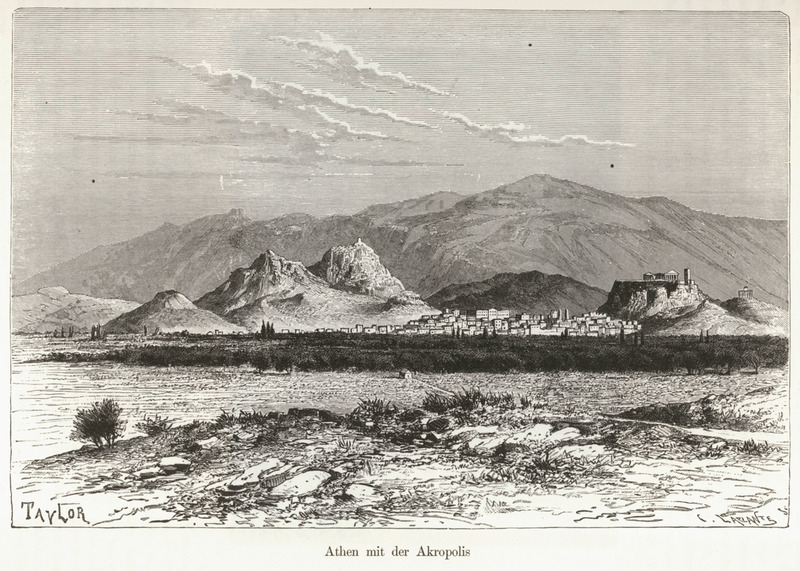 Lycabettus hill in the background. 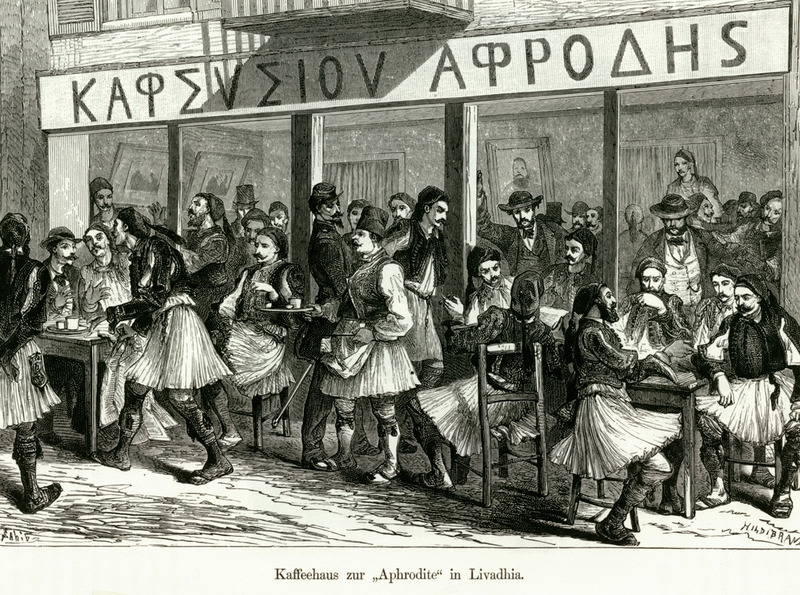 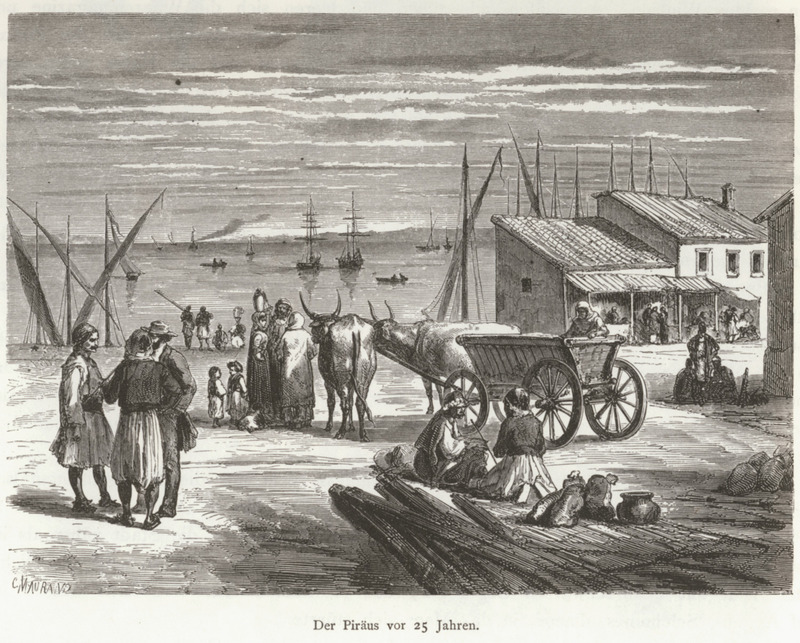 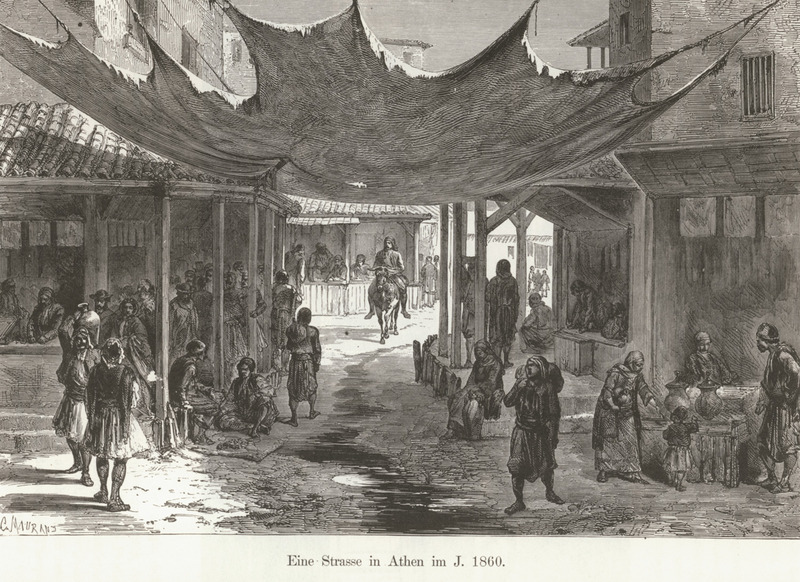 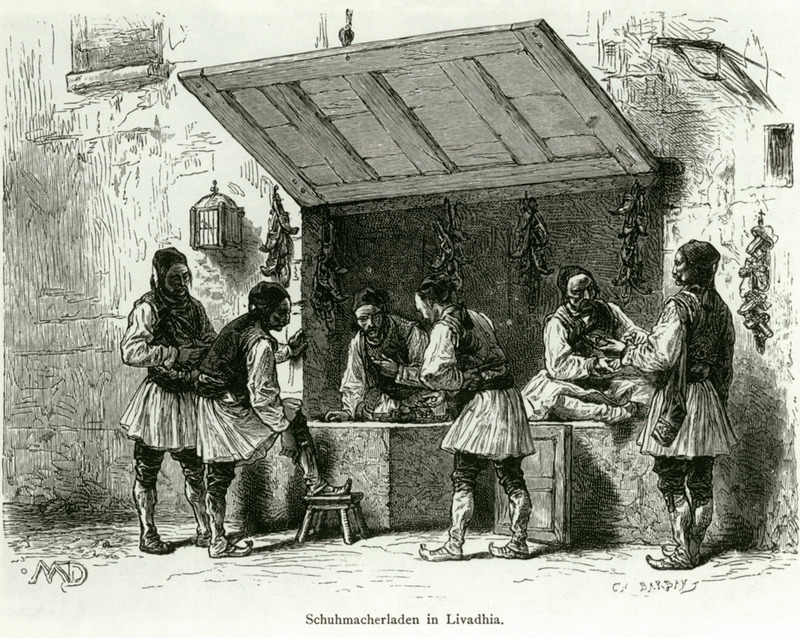 Street in Athens in 1860. 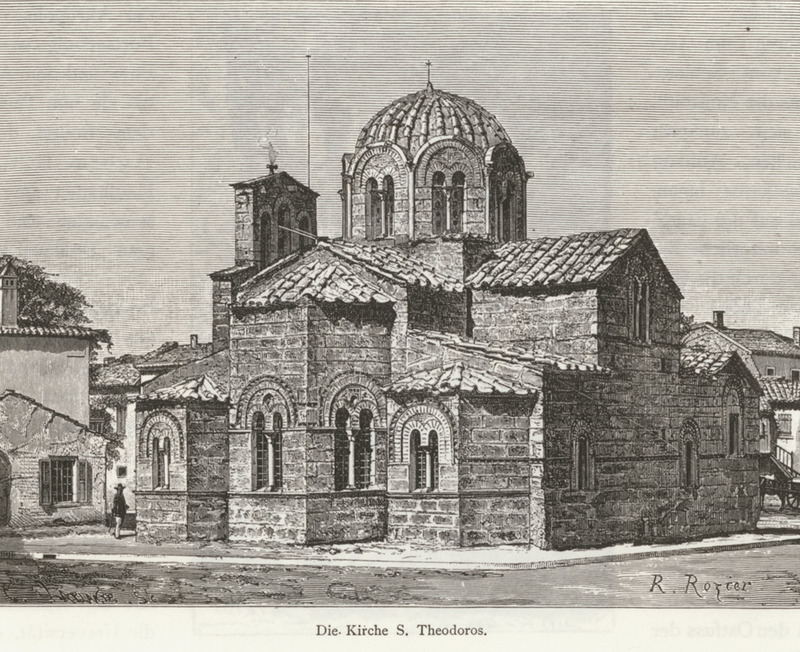 The church of Hagioi Theodoroi in Athens. 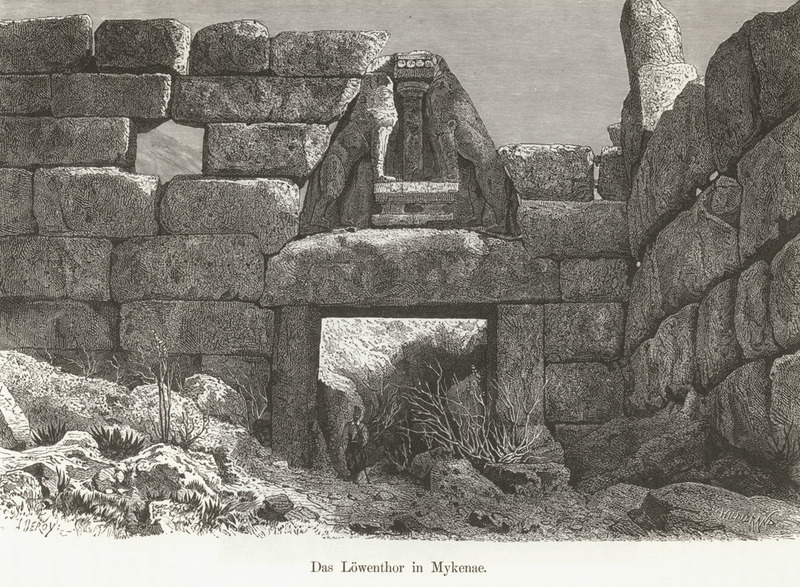 The funerary stele of Ilissus. 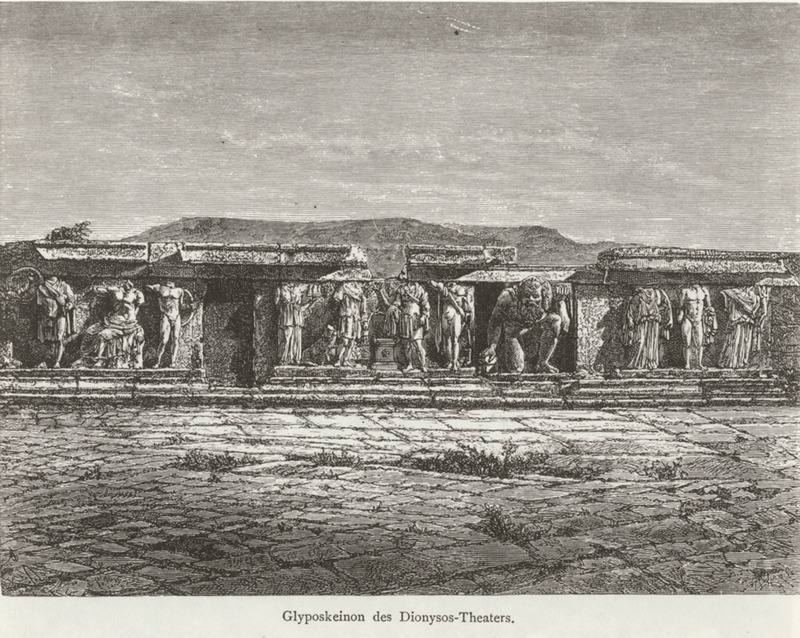 Sculptures from the theatre of Dionysus. 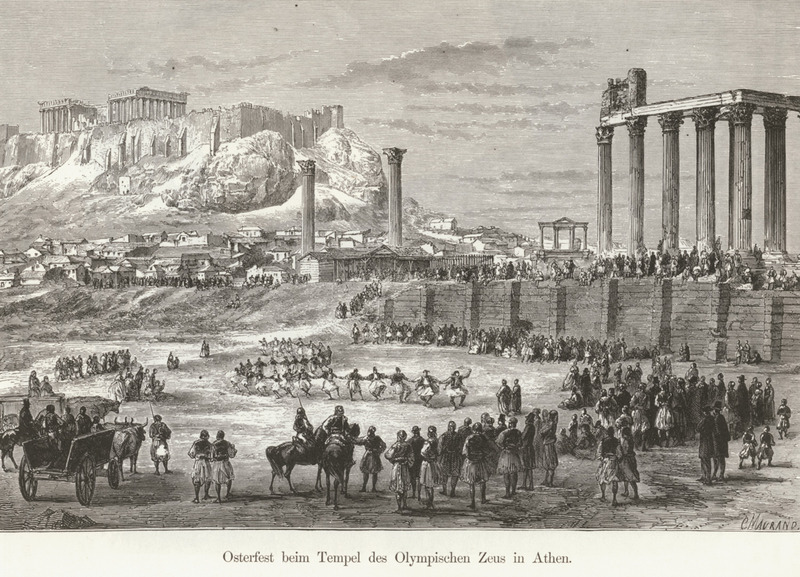 Celebration of Easter at the temple of Olympian Zeus in Athens. 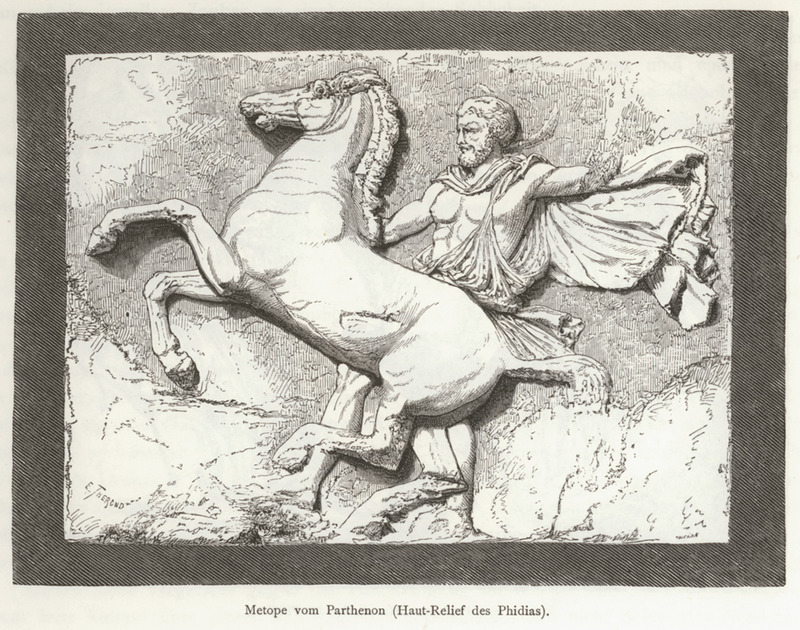 Metope from the northern side of the Parthenon. 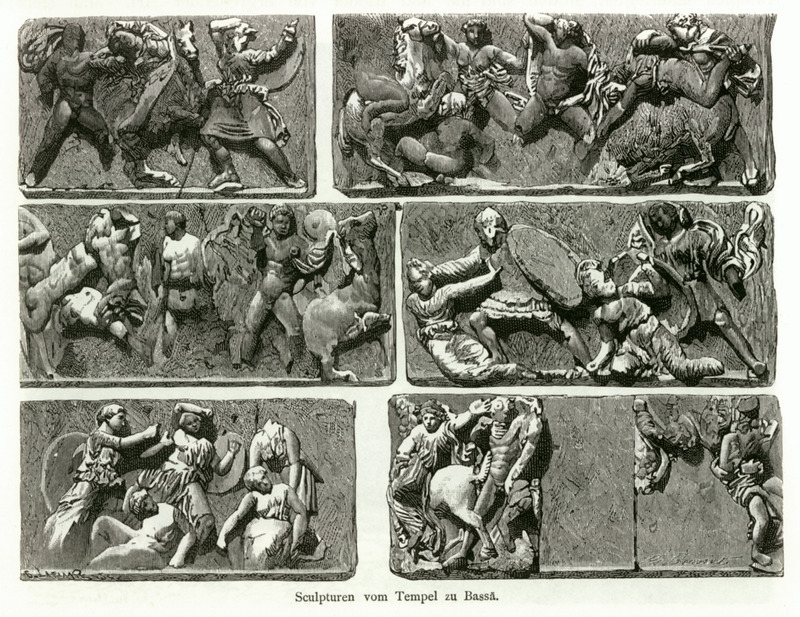 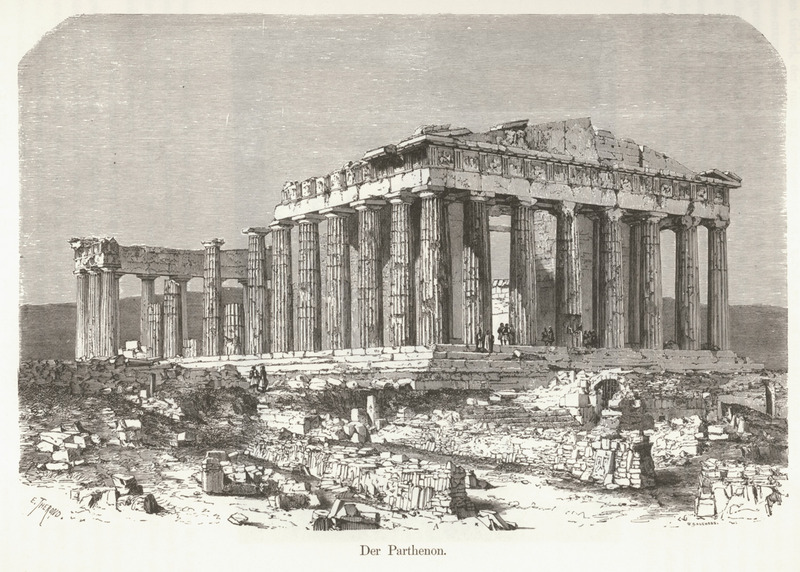 Block from the western frieze of the Parthenon. 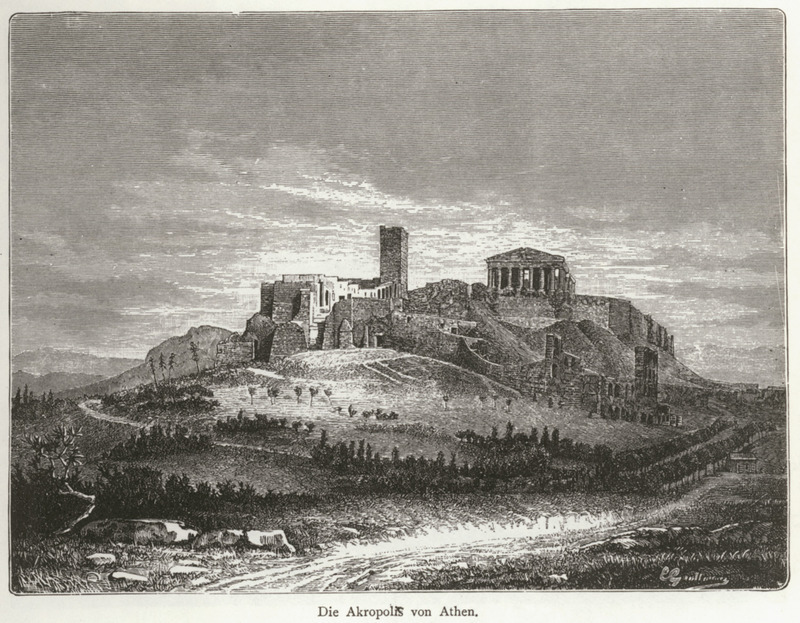 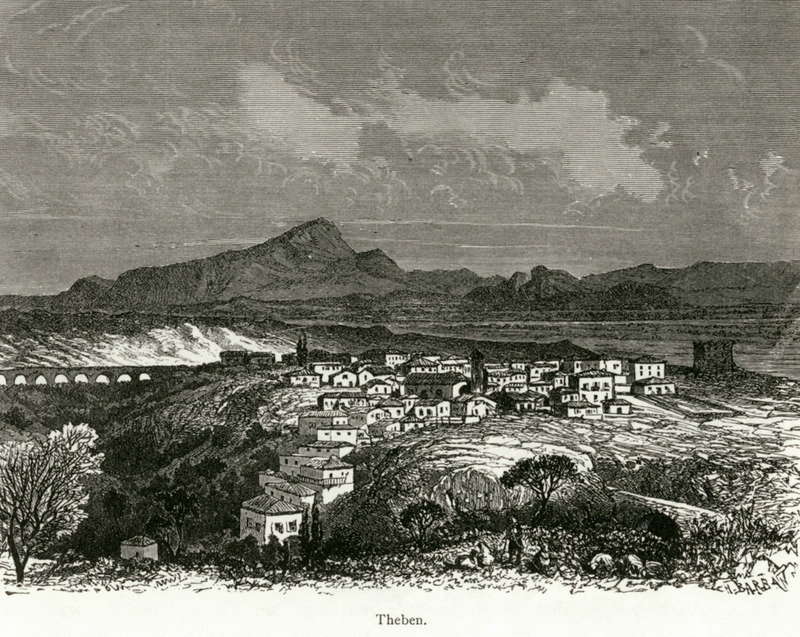 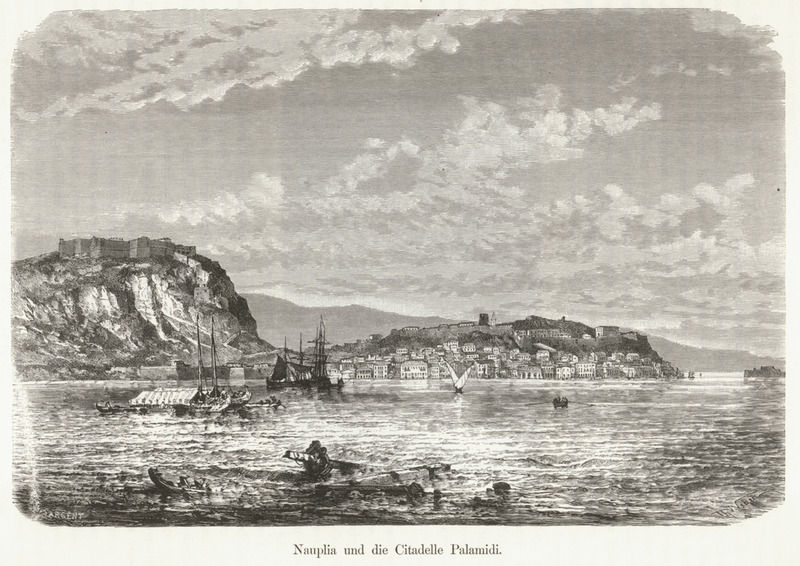 View of Athens with the Acropolis. 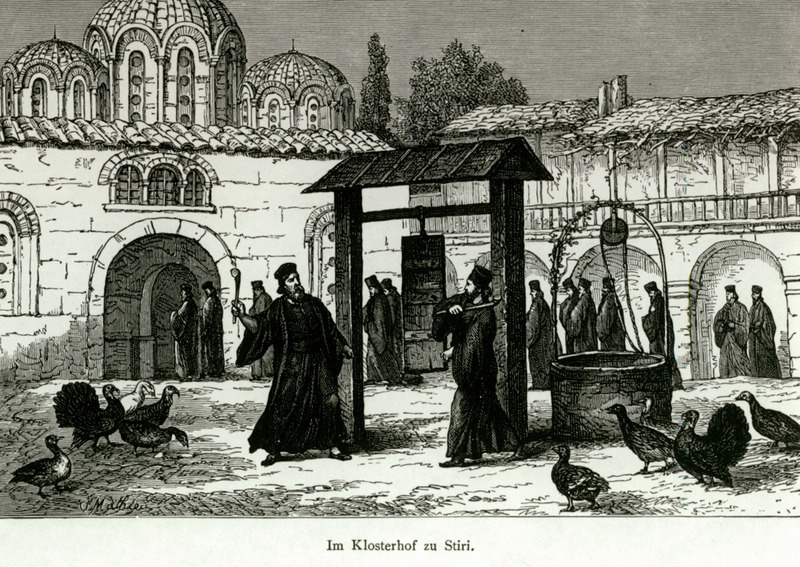 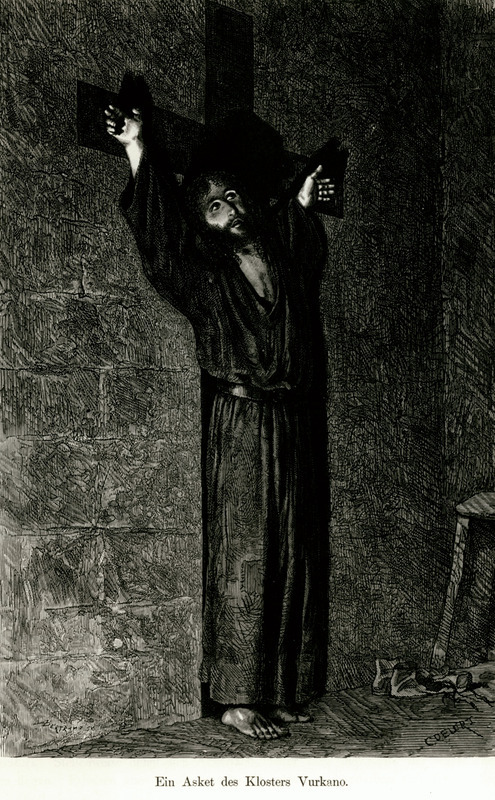 Ascetic monk from the monastery of Voulcano. 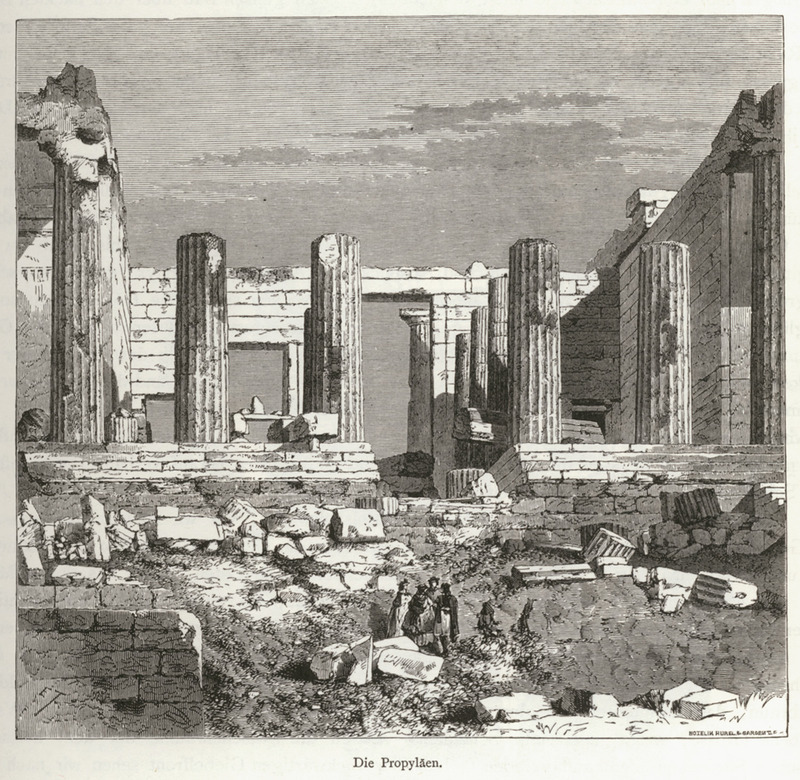 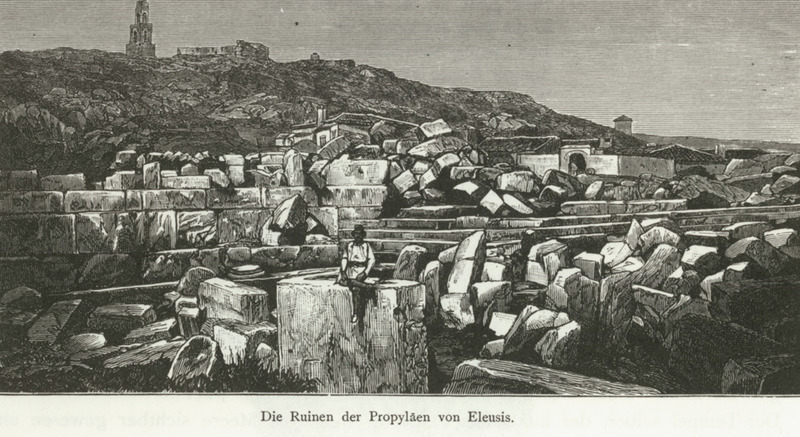 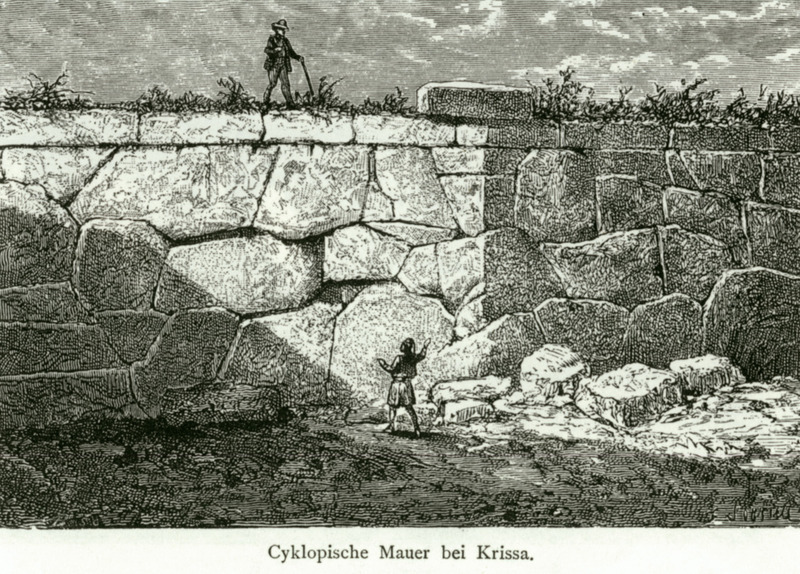 Ruins of the Great Propylaea at the sanctuary of Demeter in Eleusis. 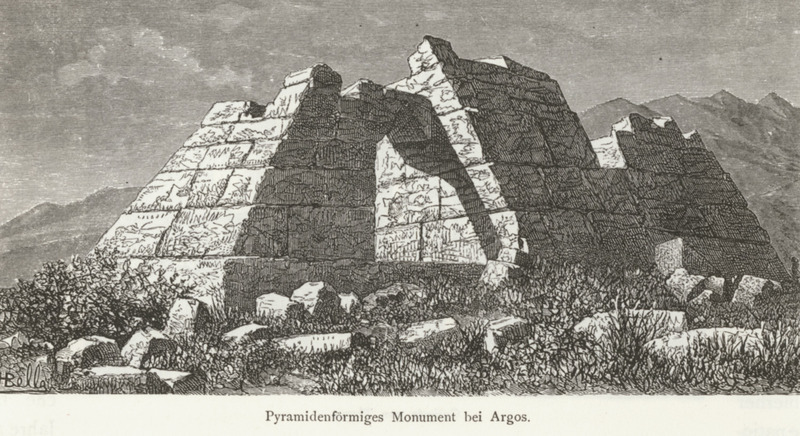 Pyramid shape monument in Argolis. 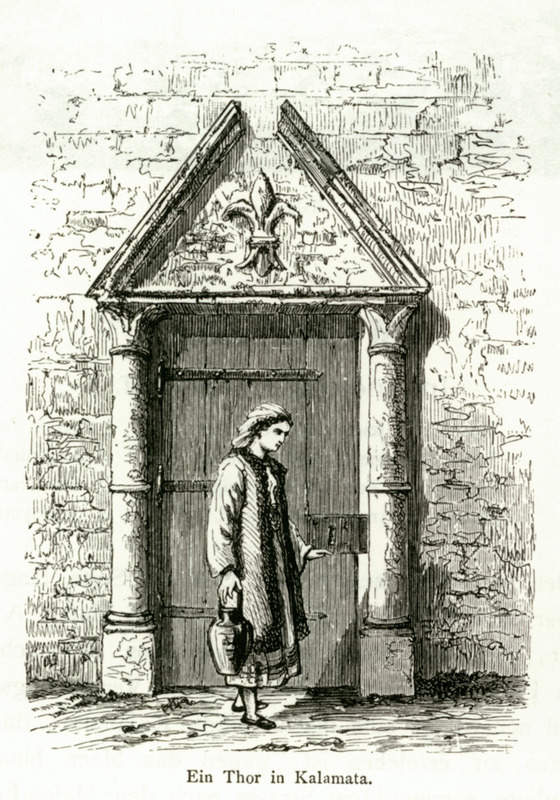 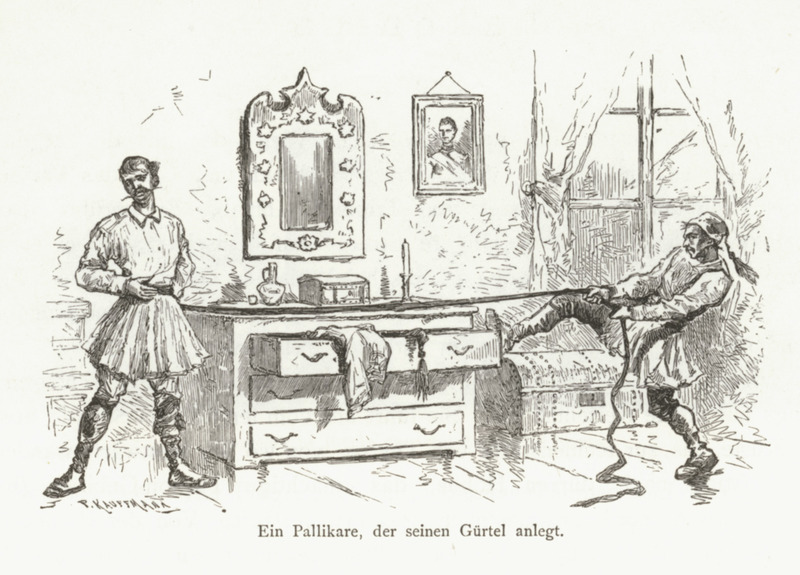 Young man having his belt tied. 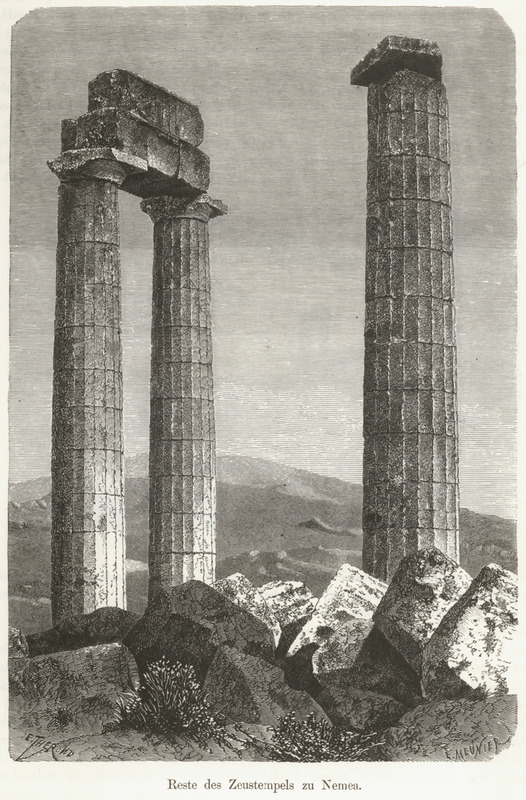 Tambours of Doric columns on the site of the Temple of Zeus in Olympia.